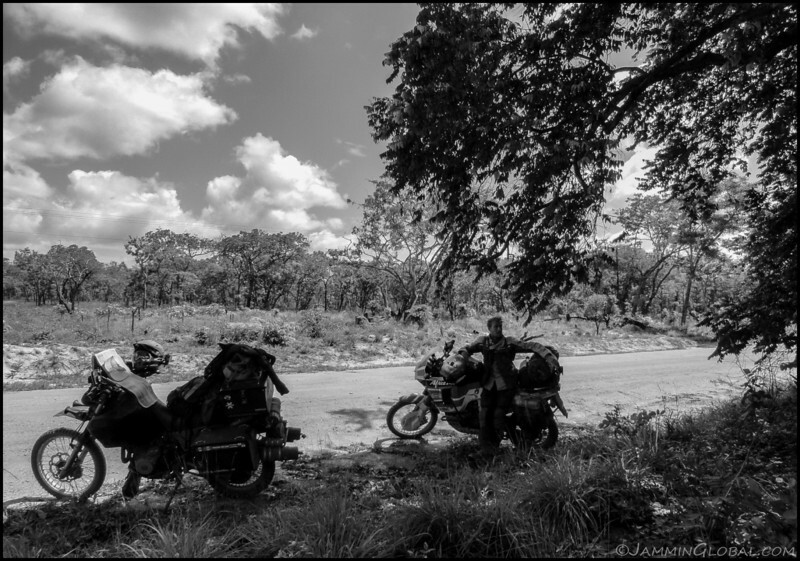 The last day of riding the coastal roads of northern Mozambique with Rob, a South African rider who I met a few days earlier. 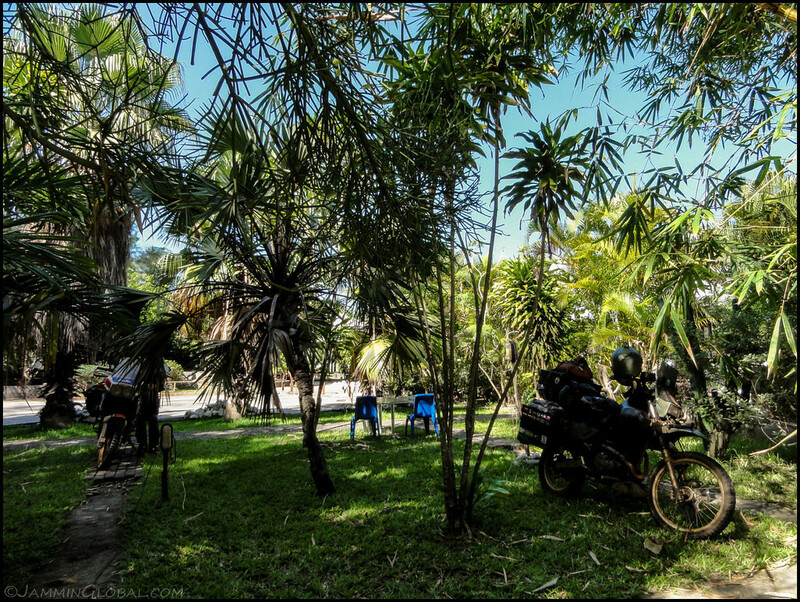 The story continues from our beach camp at Quelimane and enters back into civilization at the big northern city of Beira. 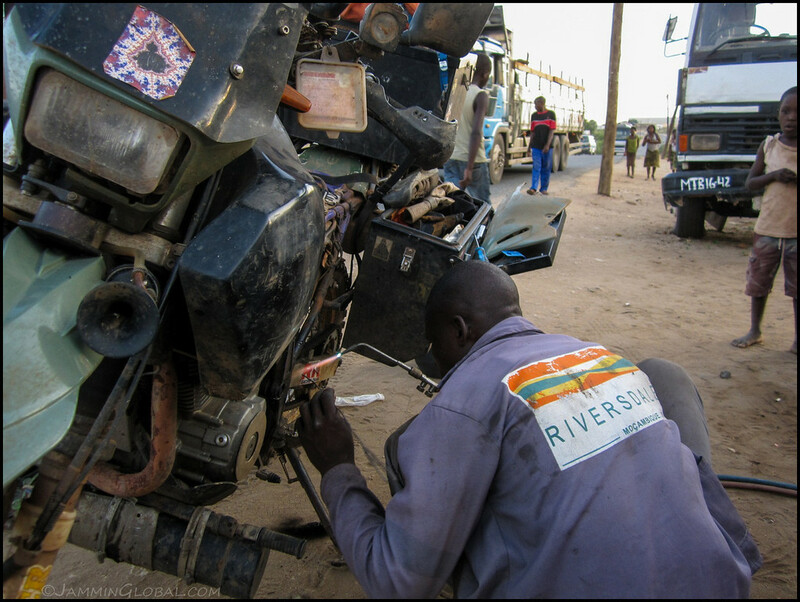 I took care of the crack in sanDRina’s frame along with some other maintenance and then headed north, through Tete to Zambia. 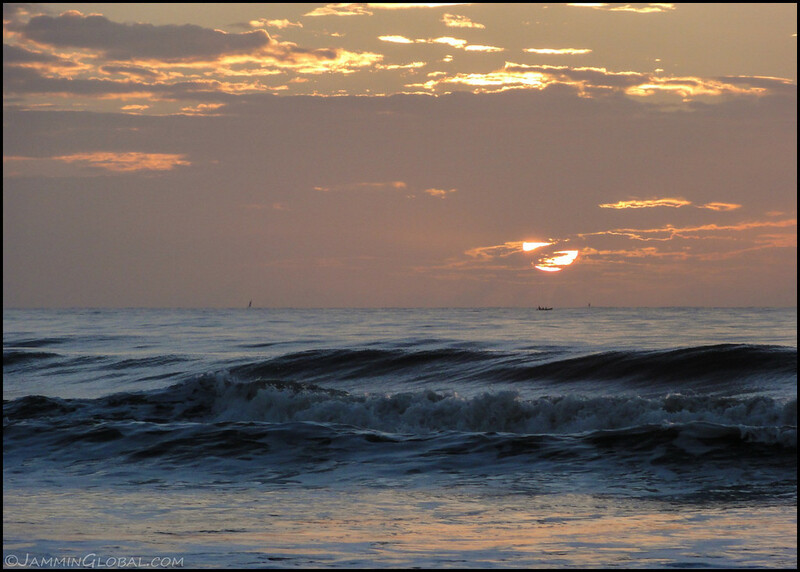 Our massive sun just after rising up past the horizon from the beach at Quelimane. 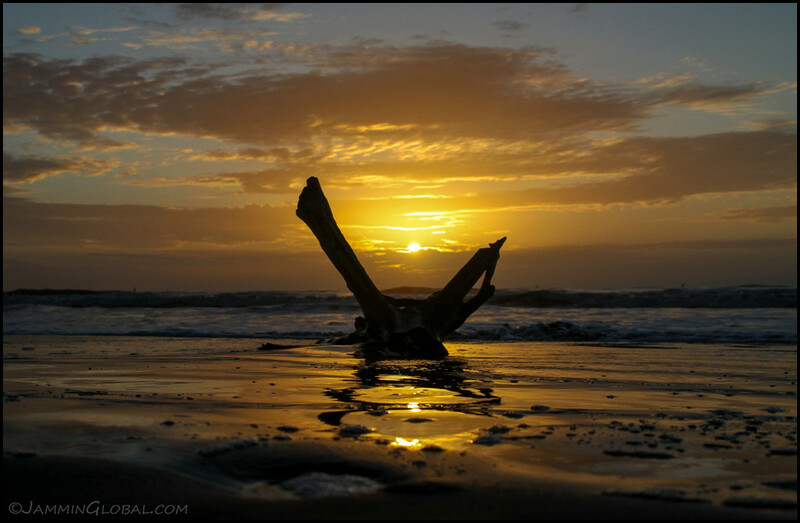 A piece of driftwood framing the sun with reflections in the wet sand. 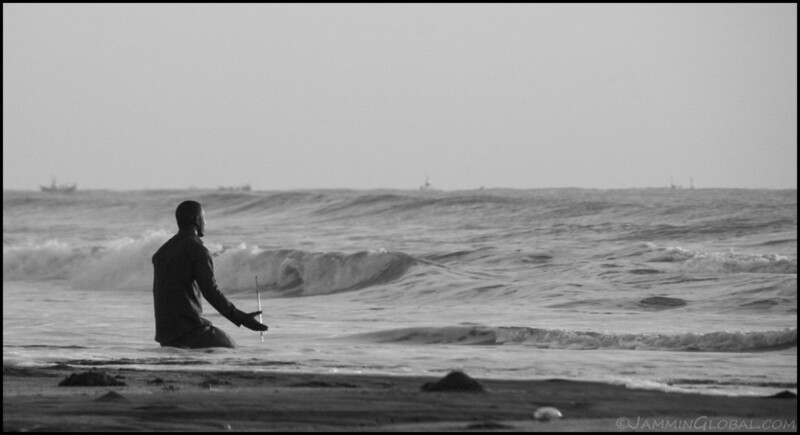 A Mozambican man saying his prayers in the surf at Quelimane. 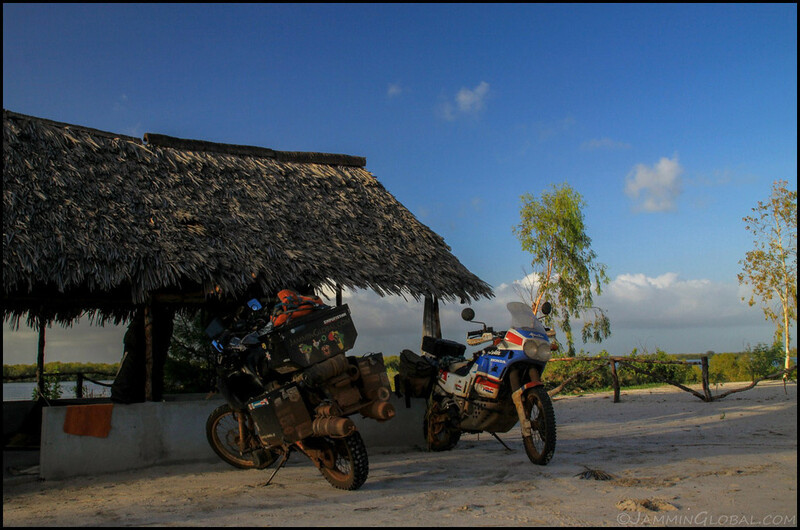 Rob and I packed up our camp, which was set up in the lawn of this run-down hotel and got back on the road for one last day of off-roading down Mozambique’s coast. Crossing the Zambezi River, which starts in Zambia and empties in Mozambique. I was hoping my Zambian visa would come through so that I could pay a visit to the Zambezi’s most notable feature, Victoria Falls. 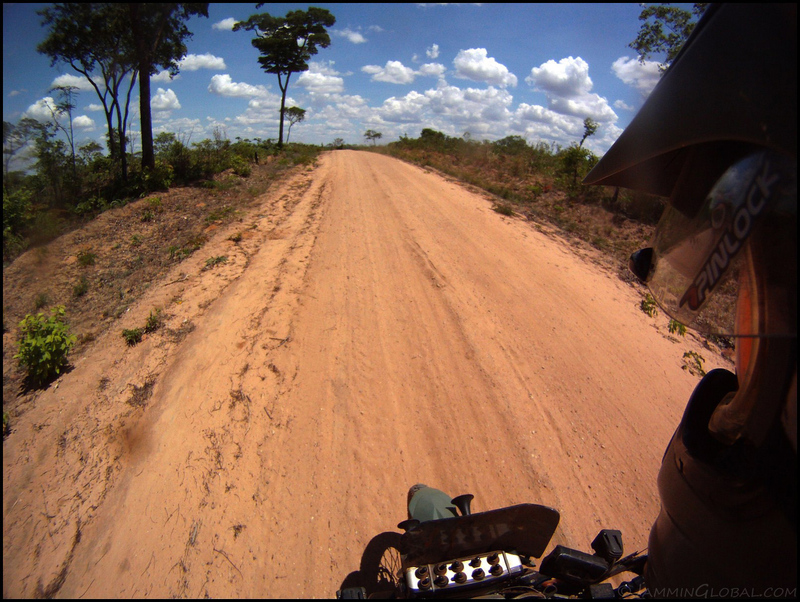 Back on the dirt road heading through forests that looked relatively untouched by man. Curious kids standing a ways off and just observing these two strange men on their big motorcycles. 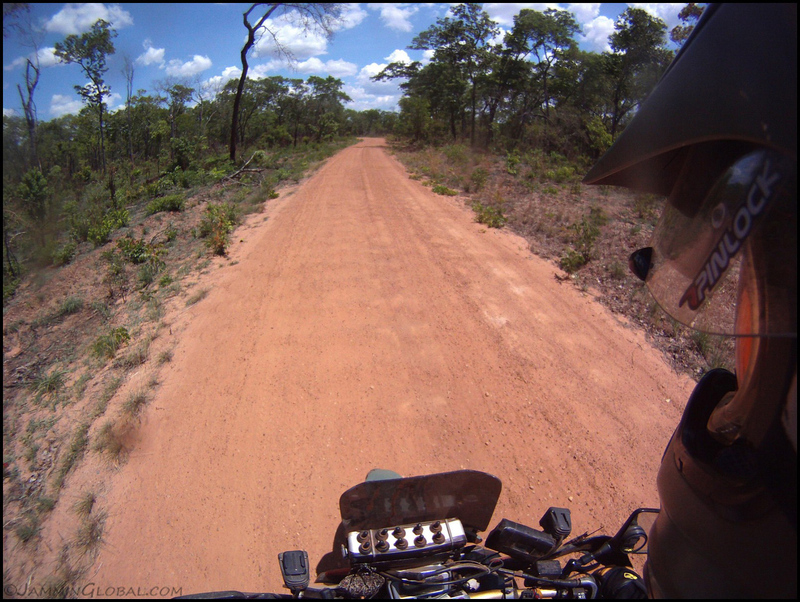 I was following my GPS and the route in Tracks4Africa that has all these wonderful less-traveled roads mapped. My favorite colors: the brown earth, the green trees and the blue and white of the sky. No traffic or civilization in sight. Ahhh…. 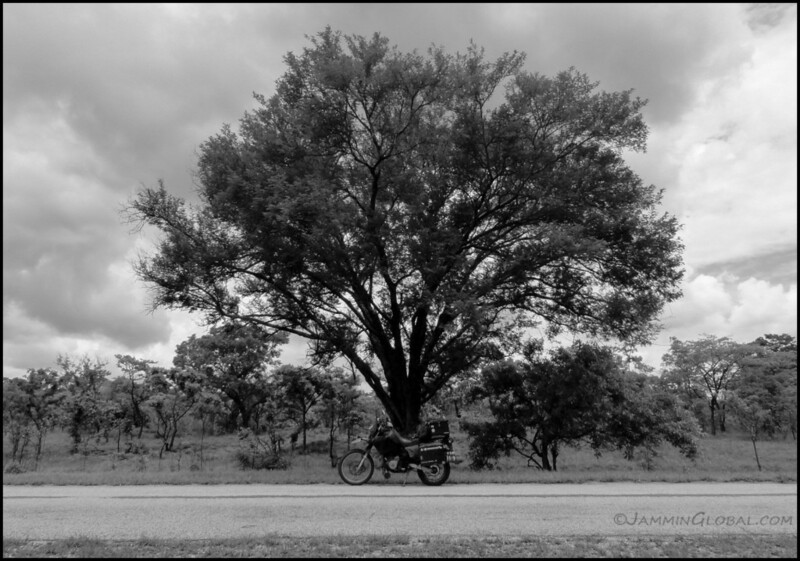 Rob and I enjoyed the last few days of riding through the rural Mozambican coast but it had to end at some point and we hit the main road and turned for Beira. 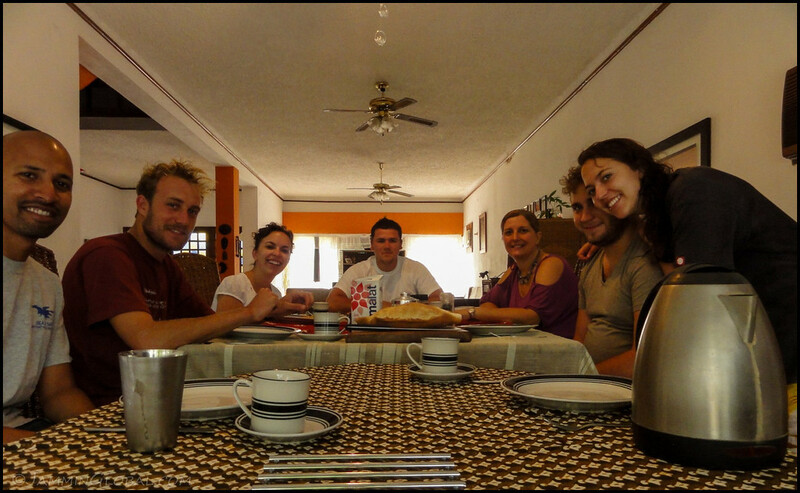 Having breakfast with friends of Rob’s in Beira. 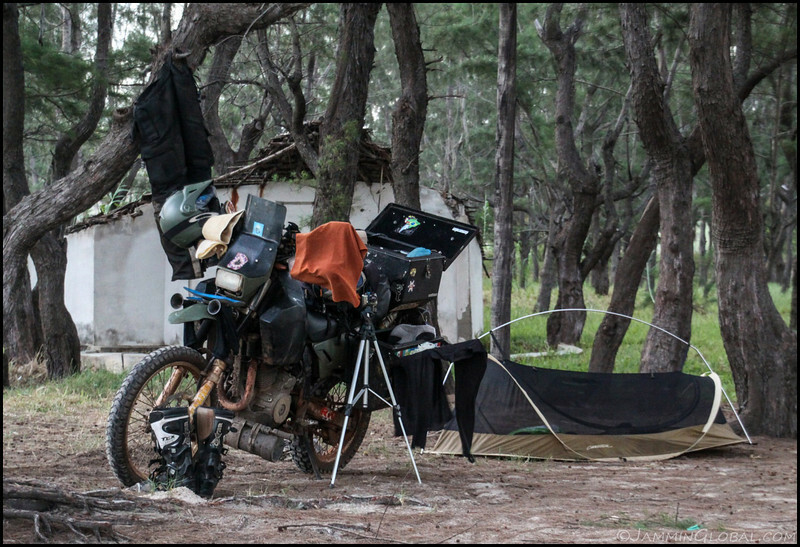 They welcomed us in from the wild and we took a few days off to wash everything: ourselves, our clothes, our gear and even a bit of the bikes. I also took care of some paperwork and got lots of bike maintenance done. Deon, the man of the house is not pictured but he’s into the steel business here and his wife, Denize, recently moved from Brazil. She said my Portuguese was not bad for just picking it up while traveling. 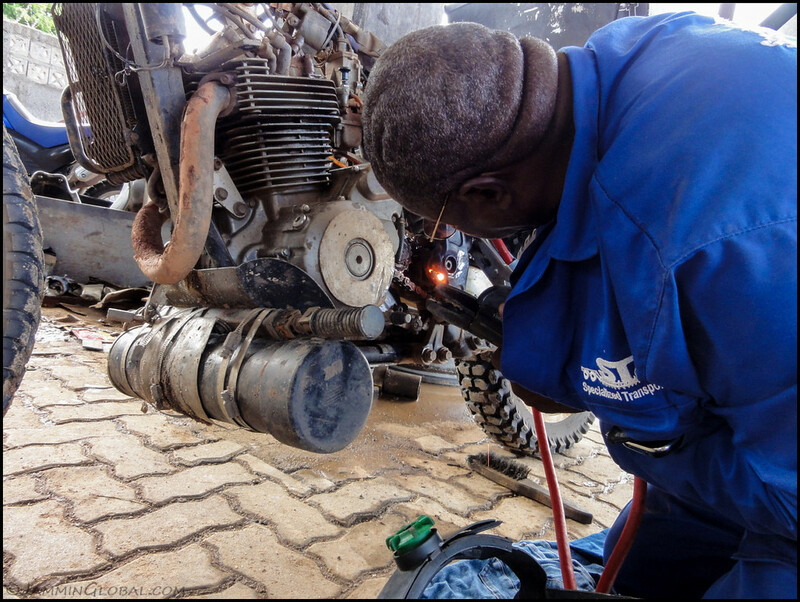 Deon put me in touch with a friend of his running a big trucking business and sanDRina is having her cracked frame re-welded at the workshop. 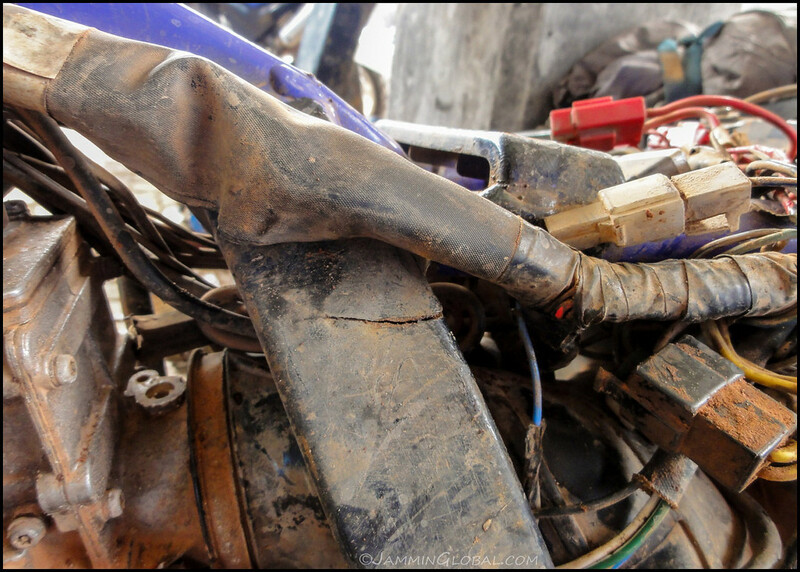 I removed the fuel tank and wow, what a surprise – a huge crack further up the frame. 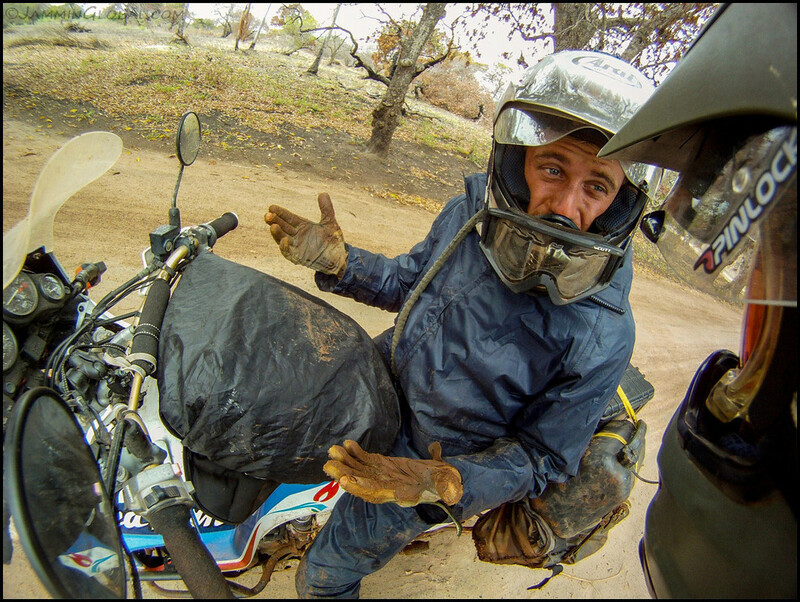 This was most definitely from riding about a thousand kilometers from when the first frame crack happened towards the start of the coastal off-road riding. Instead of viewing the DR’s frame as weak, I’m so impressed that the damage wasn’t worse for the kind of riding I did (wash-board/corrugations) with the load I was carrying after the first frame crack. Nervous welding moments as I couldn’t move the wiring harness too far out of the way. We had wet rags all around and no damage was done to the wiring. 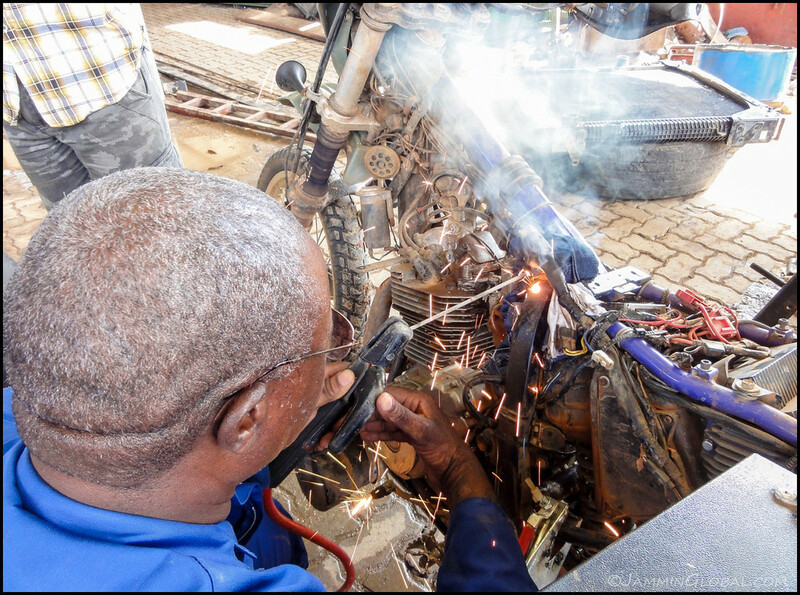 I thanked the welder for his excellent job in fixing up the cracks in sanDRina’s frame. New Galfer organic rear brake pads going on. 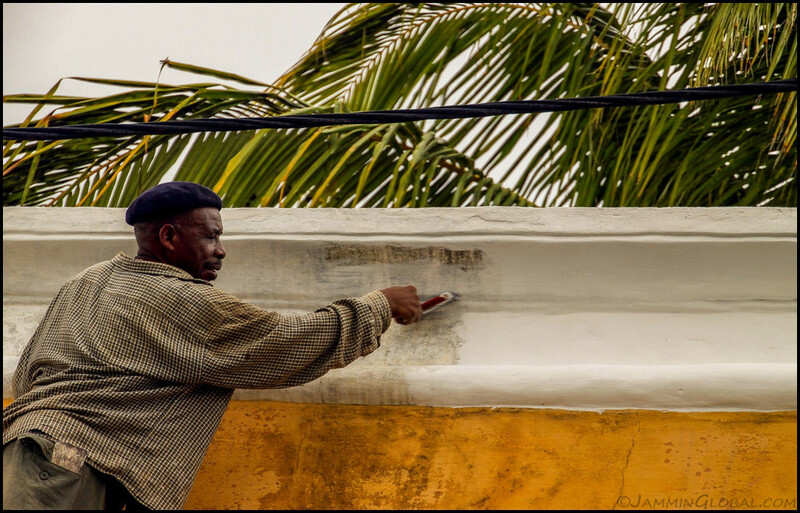 The old set lasted 7,546 kms (4,690 mi) and was installed during the major rebuild in Nairobi. They’re way past the wear indicator and check out the grit that’s been grinding on the rotors. 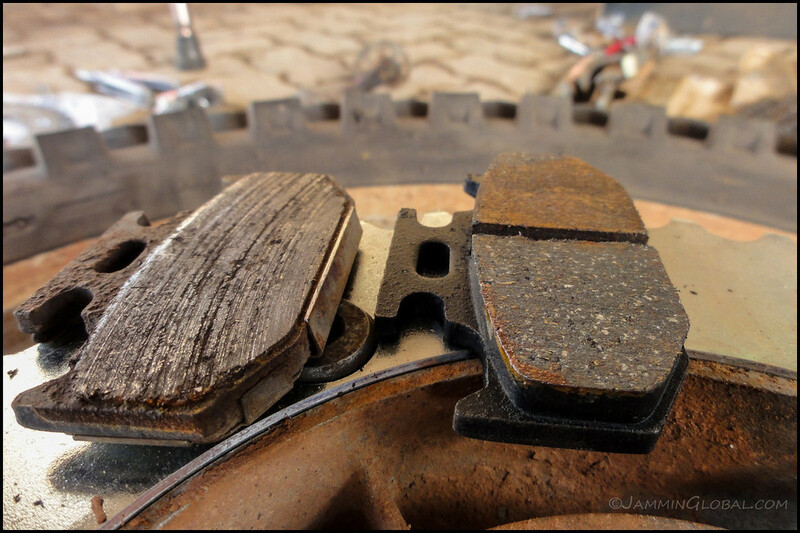 These soft pads performed well over lots and lots of off-roading (where the rear brakes are used more than the front). sanDRina getting new JT sprockets and chain installed. I was lugging all these spare parts since Nairobi and am always happy when the spares get used because that’s a weight reduction! New JT chain going on. 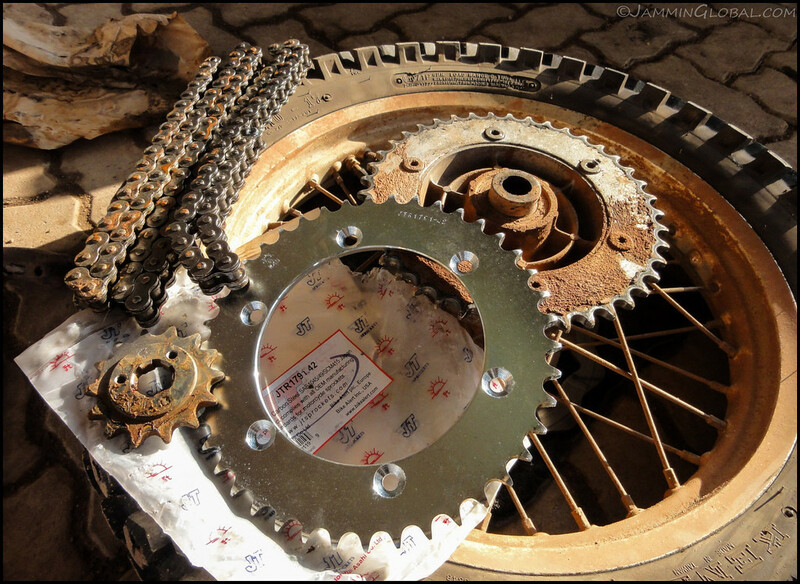 I got sponsored by JT for the sprockets and they wanted me to test out their new chain that they were developing. I had a spare RK chain in case this one didn’t last but its side plates looked heavy duty and up to the task. 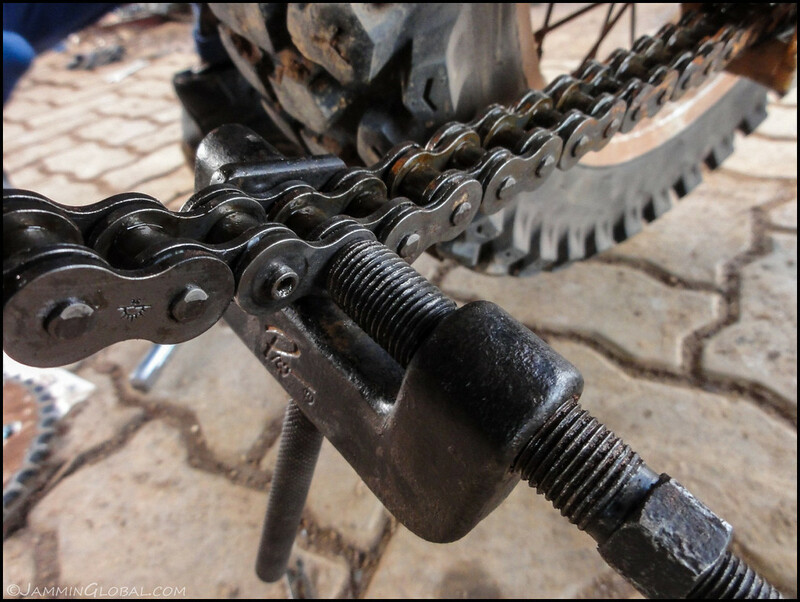 The old DID V8 chain was installed way back in Addis Ababa, before my Lake Turkana ride and lasted for 14,972 kms (9,305 mi). 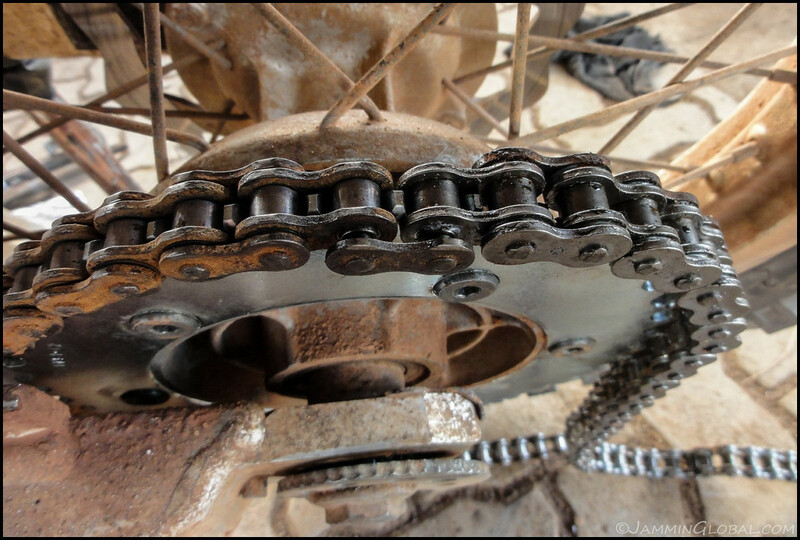 The chain wasn’t finished but it was stretching and this was a good place to work on the bike. Riveting the master link. I love proper tools. I’ve been lugging this Motion Pro Chain Breaker and Riveting Tool all along since Chicago and while I’ve only used it a few times, it’s been priceless. 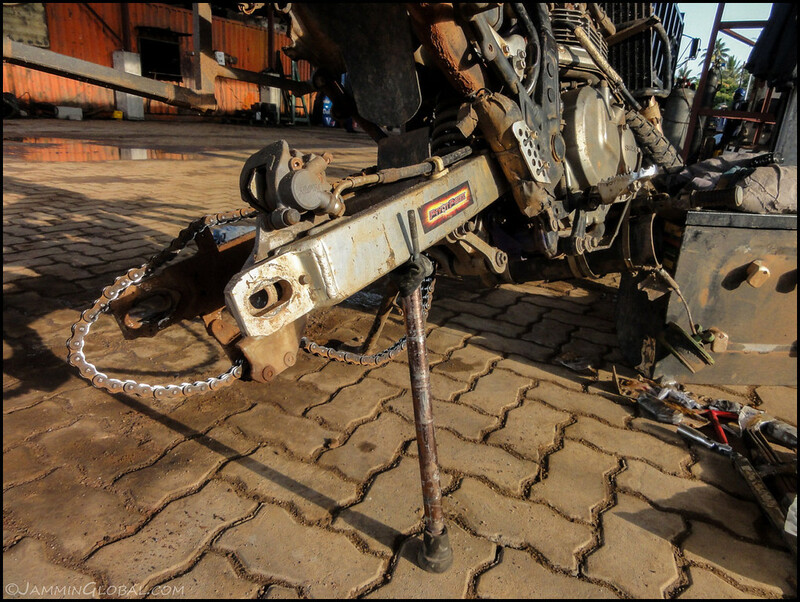 The thing is, I can’t plan exactly where I’ll be when I need to install a new chain, so my mantra has been to carry the spares and the tools to get the job done wherever the need arises, such as in San Luis, Brazil, Addis Ababa or Beira, Mozambique. 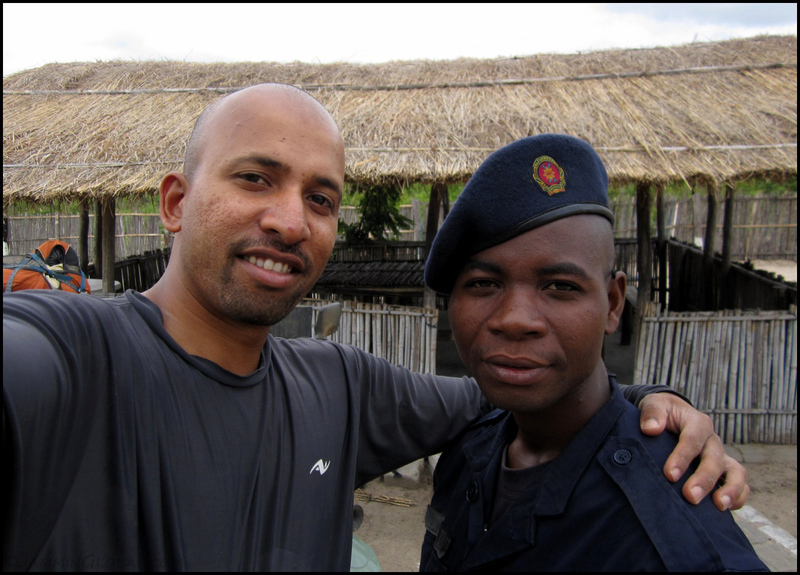 During my downtime in Beira I got news that my visa for Zambia was finally approved. Yay! I was now going to be able to visit my childhood home. The visa was quite complicated to arrange as I needed someone in Lusaka to apply for me and now I had an approval letter in hand that would allow me entry. I said good-bye to Rob as he was continuing on to Durban and thanked Deon and Denize for hosting us. 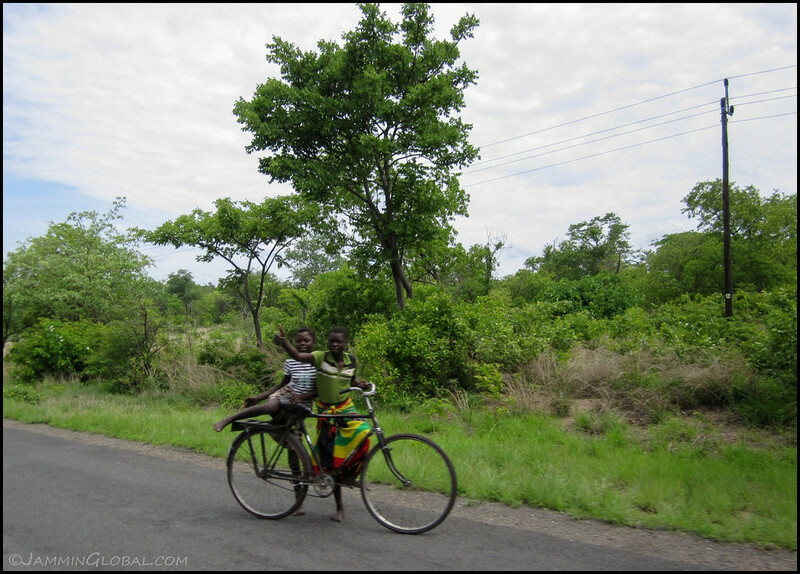 From Beira, I headed inland towards Tete and the border for Zambia. 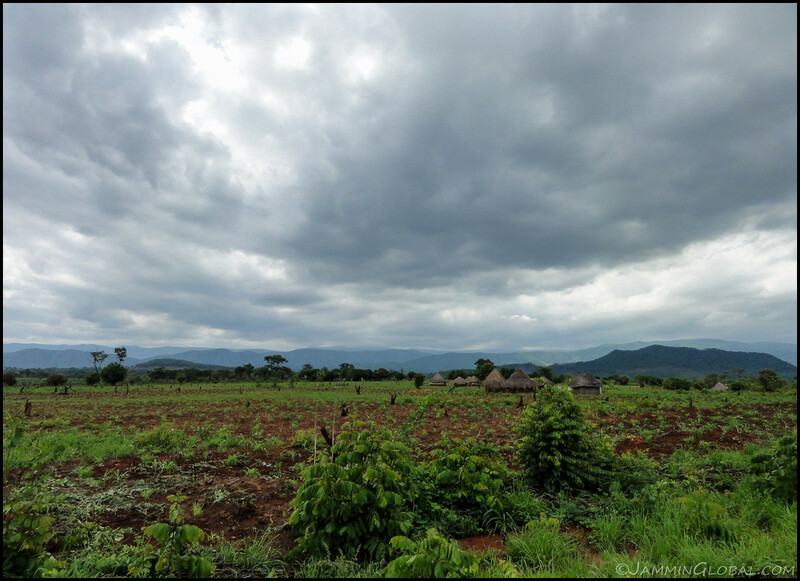 An overcast day with views of Mozambican farmland and the Bvumba Mountains in the distance. Beyond those mountains lies Zimbabwe. I came across a blind corner at a good clip and saw that there was a bridge across a small canyon. I continued at the same speed and only at the last second did I notice a super massive pot hole at the other end of the bridge. It must’ve been 2 m (7 ft) across and quite deep. sanDRina hit it really hard and I was lucky to ride it out. I pulled over and yup, the frame cracked again and this time in new spots. Poor girl, just taking so much abuse. At the edge of Tete I pulled over at a welding shop and promptly had sanDRina’s frame all healed up. 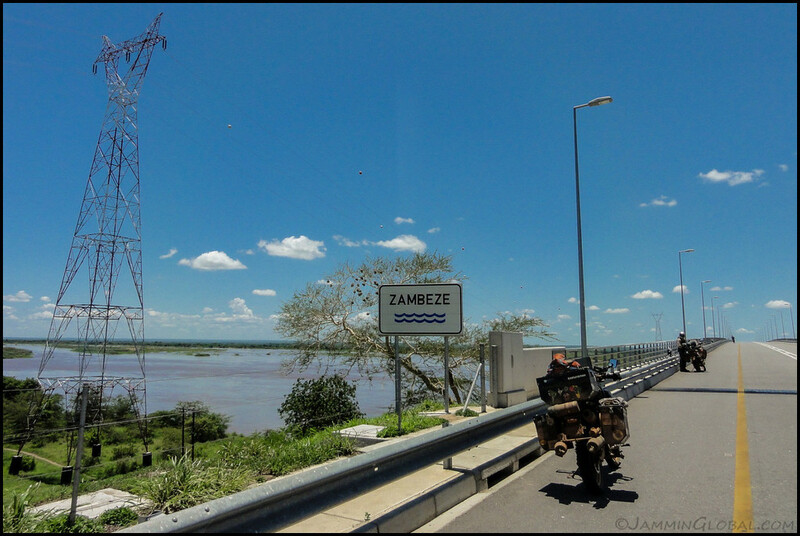 Crossing the Zambezi at Tete, the largest city in this part of Mozambique. It was an important trading town before the Portuguese got here and recently it’s been picking up with the mining industry. I stayed the night with Karen through CouchSurfing, who’s been posted here with the mining industry. She’s a Japanese Brazilian and as I remember from my other Japanese Brazilian friends in Brazil, she said she didn’t fit in back home in Brazil, nor was she accepted when she visited Japan. 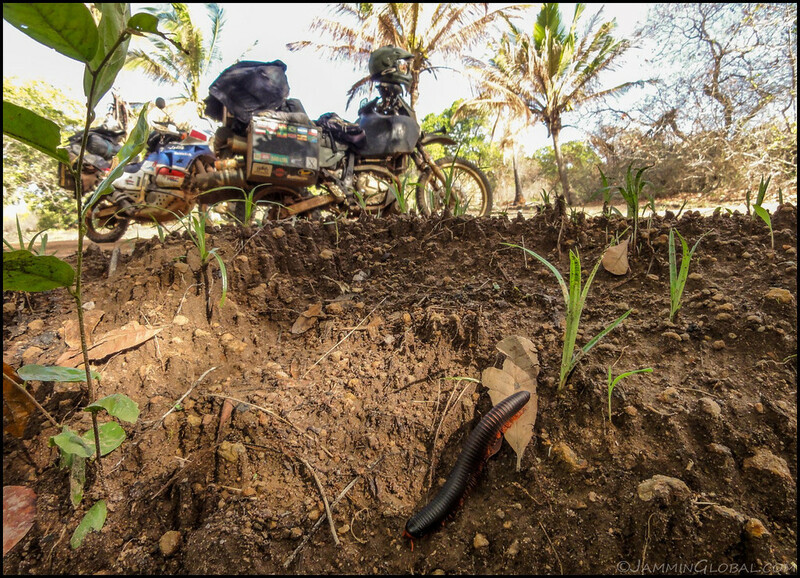 This remote corner of Mozambique was now home. The last day in Mozambique, heading north for Zambia. 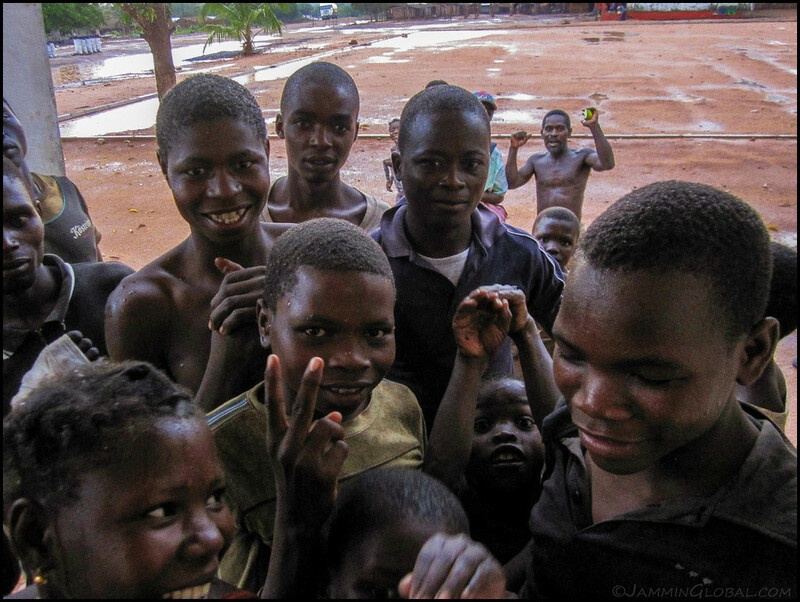 The kids are super-friendly in Mozambique. 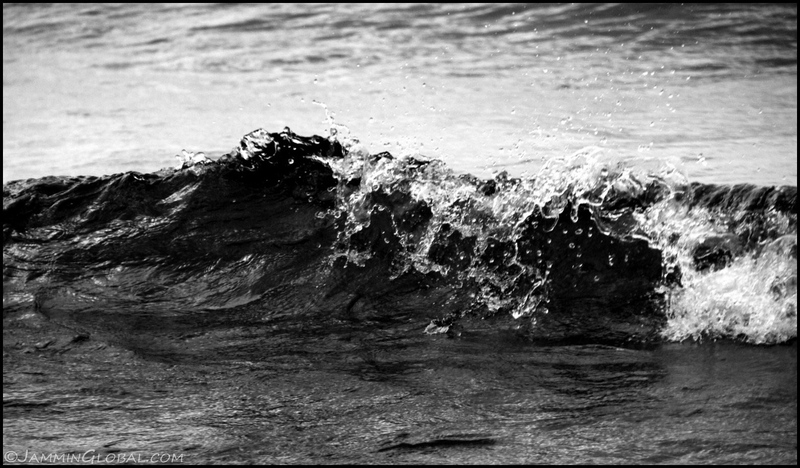 More than just waves, I got lots of thumbs-ups and enthusiastic cheering on. 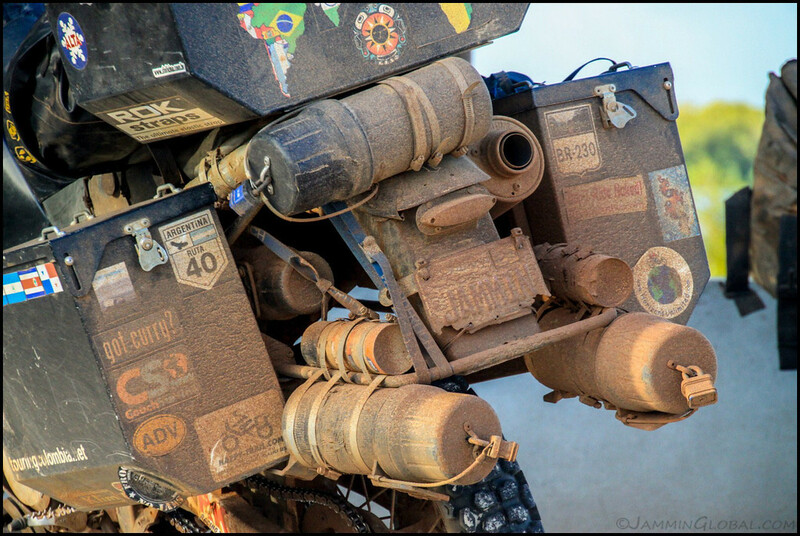 I think they’re ready for the Dakar! The long, empty road heading for the border. 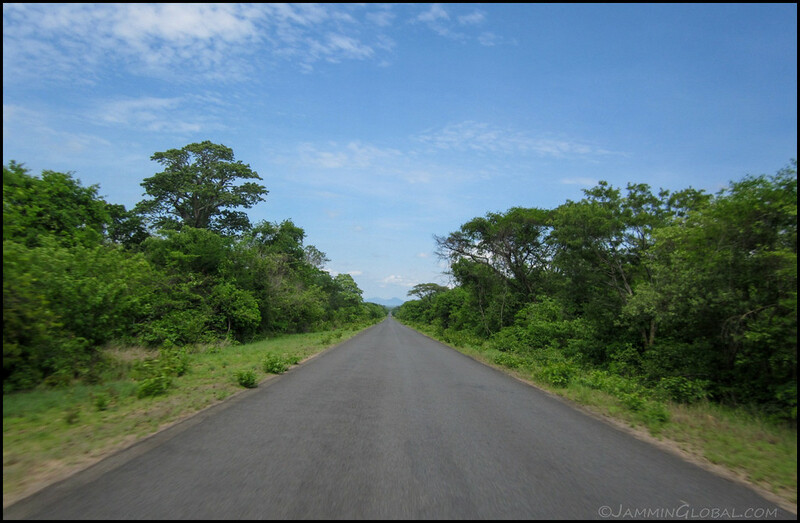 This road was recently paved as the government is hoping to direct truck traffic from the busy Zimbabwe to Beira corridor and encourage overland trade into Zambia and Malawi. Money changers at the Cassaticaza border with Zambia. They gave me a better rate than I was expecting as I traded the last of my Meticais for Kwacha. A nice feeling to be leaving Mozambique with. Oh yeah and my Mozambican visa was only stamped for 15 days but I stayed two days extra with no problem. 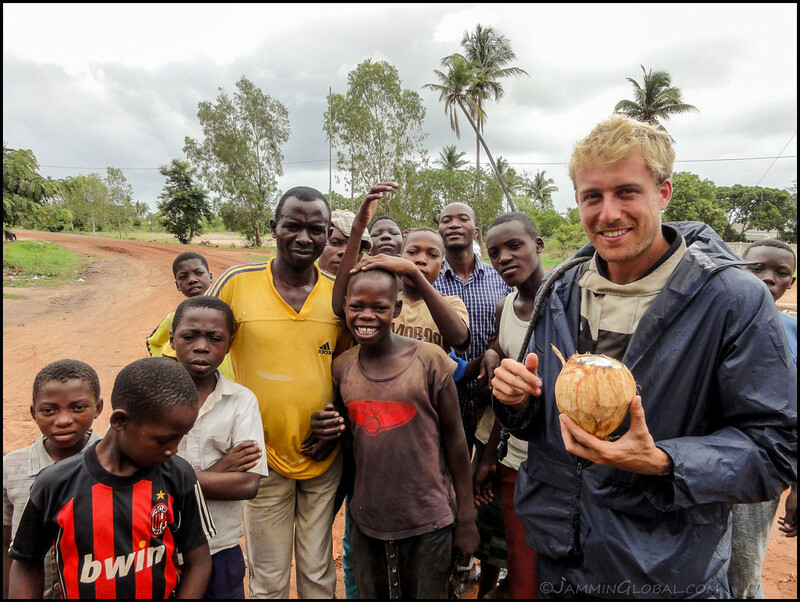 With that, my adventure through Mozambique comes to an end. Before I got to Africa, I knew this would be one of my favorite countries and it lived up to those expectations. Maybe it was the Portuguese connection, maybe it was the abundant and cheap seafood, maybe it was riding with a new friend down the rural coast or maybe it was just the good feeling I had from being there. Whatever it was, I know 15 days wasn’t enough and let’s see when I can get back here again. 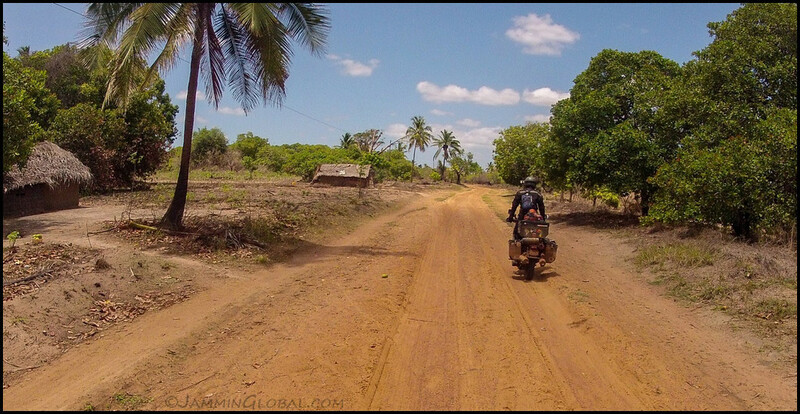 This is the continuation of the off-road adventure that I had along Mozambique’s rural coast. 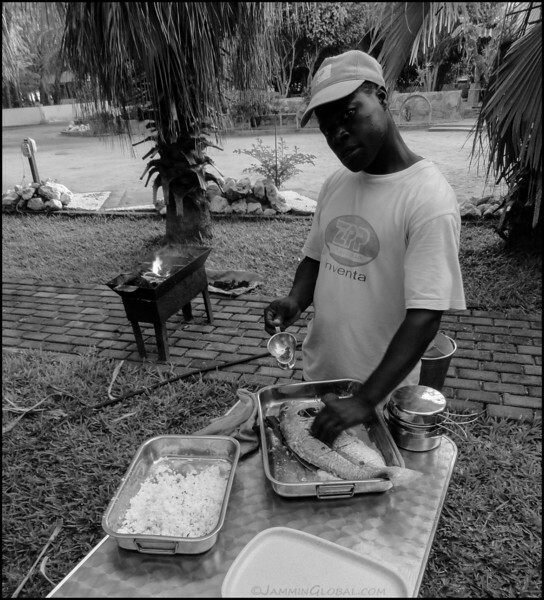 I had teamed up with Rob, a South African chef riding to Durban and thoroughly enjoyed his delicious and simple seafood preparations at the end of each day’s ride. 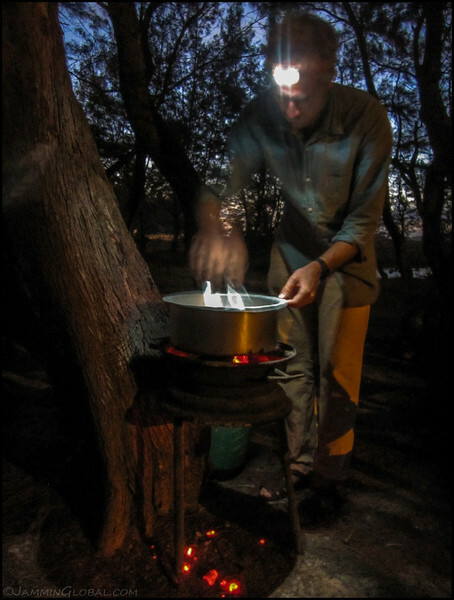 The story continues just as we put up camp at Pebane, about a third of the way between Ilha da Mozambique and Beira. 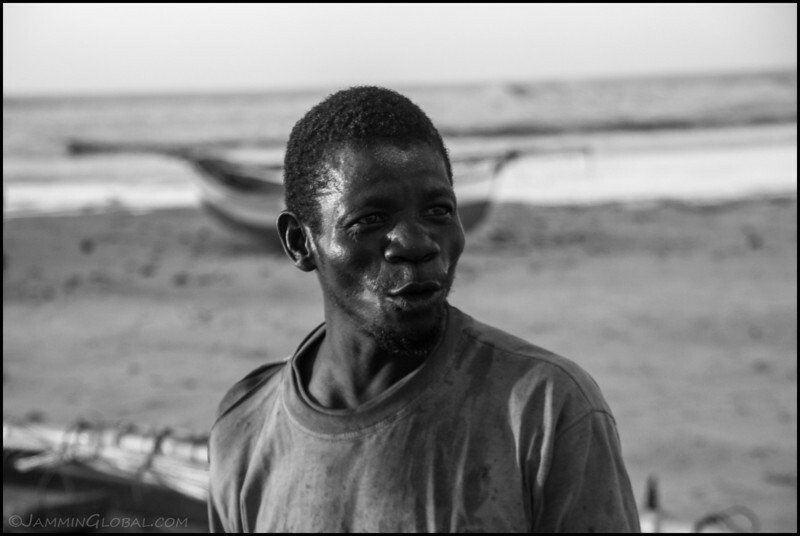 In the morning, we had a nice exchange with a group of fishermen as they waited for calmer seas before we headed back on to the trail to Quelimane. The fun riding was over and we were beat up over washboard all day long. The town of Pebane wasn’t much to see, so Rob and I asked our way towards the beach. At the end of the road there were some cottages and a clearing under these trees. We asked the caretaker if we could camp here. Sure. How much? Free. Sweet! 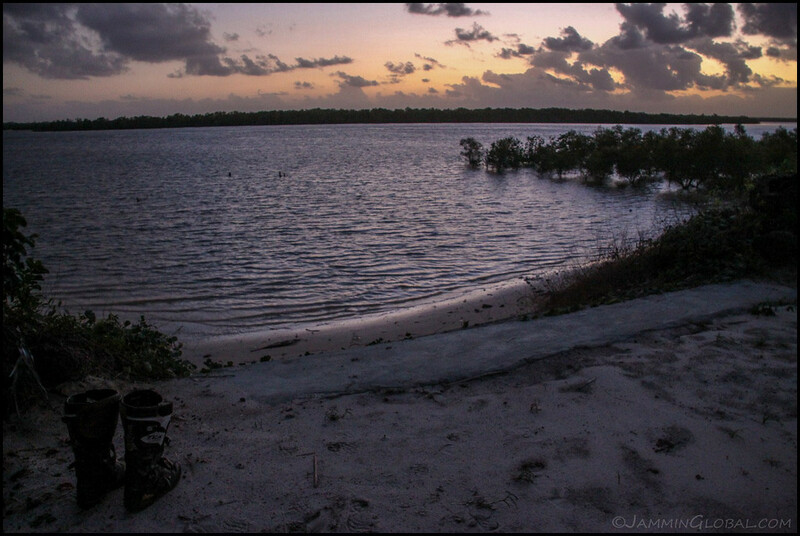 Our campsite by the beach and this little stream with a beautiful sunset. sanDRina exploded into ‘home’ mode. That’s my one man Catoma Twist tent without the rain cover. It’s just a mosquito mesh, which is perfect for letting in cool air at night and seeing the stars as I nod off. That orange towel from REI has been my traveling towel since 2006 and smells like it too! Someone said it smelled like a wet dog, which I don’t really take offense to. It still absorbs all the water after a bath and dries in an hour. and sanDRina doesn’t mind, dirty girl herself. 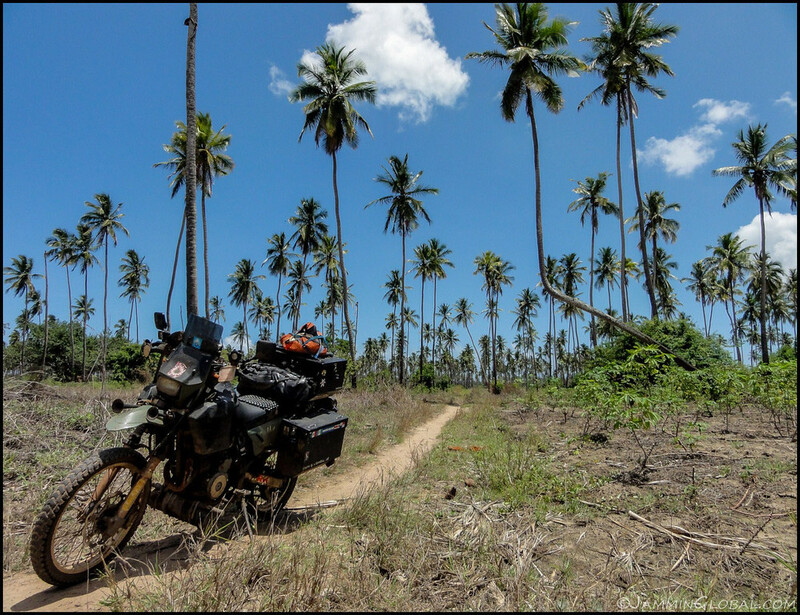 Rob’s Honda Africa Twin and his traveling home. Chef Rob is already busy preparing dinner. 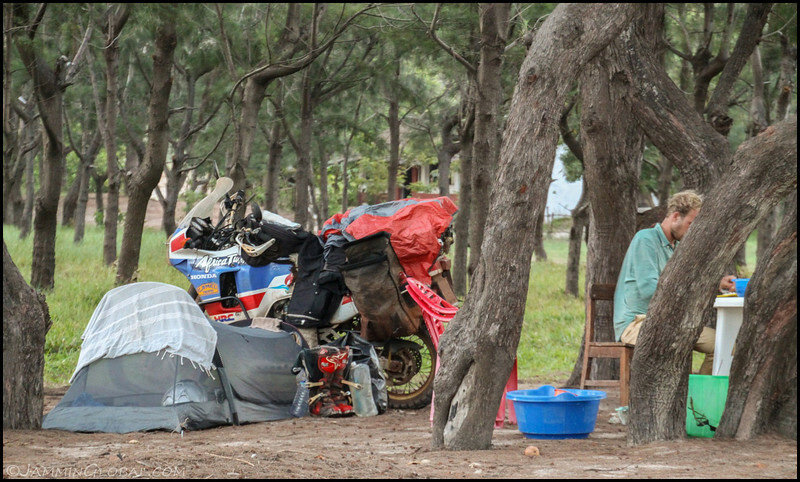 While he was taking a nap after the hard day’s ride, I arranged with the caretaker to let us use these table and chairs for the evening. There was no fresh seafood around but he had a lot of freshly-frozen seafood, which was just fine. 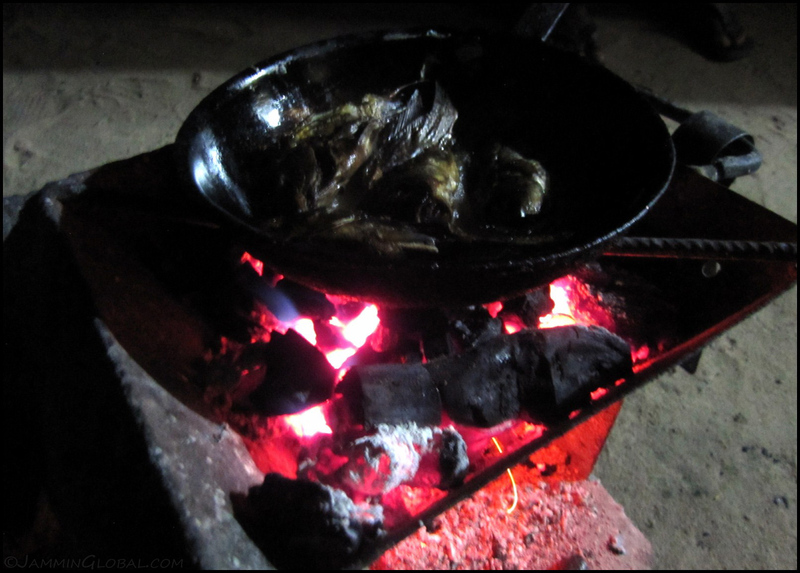 We bought a bunch of shrimp and squid and he threw in the use of some pots and charcoal for the night. A wooden boat by the beach just past our campsite. 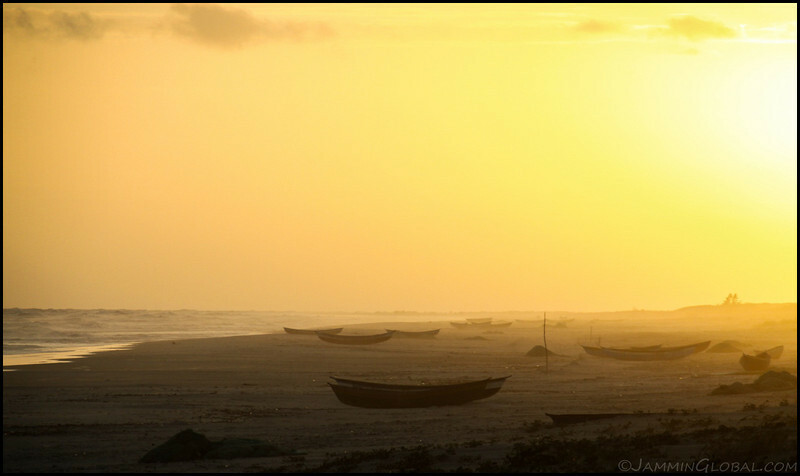 The pristine beach at Pebane with a brightly setting sun. …prepare some tasty food. Rob cooked up some seafood pasta with just olive oil and salt. Light and delicious. Once again, the meat was too much for just the two of us but we gorged to replenish the calories after a long day in the saddle. 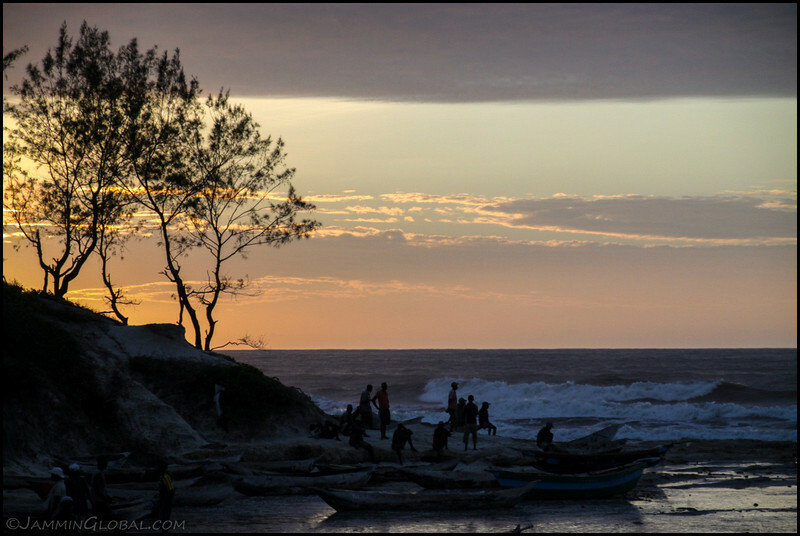 Just before sunrise on the Mozambican coast at Pebane. The golden rays of the rapidly rising sun. 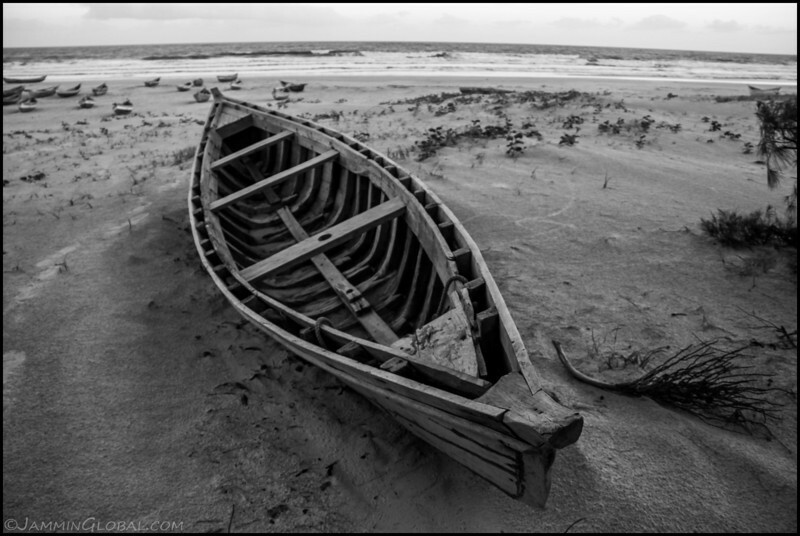 …he was one of the few repairing his boat during the down time brought on by the rough seas. 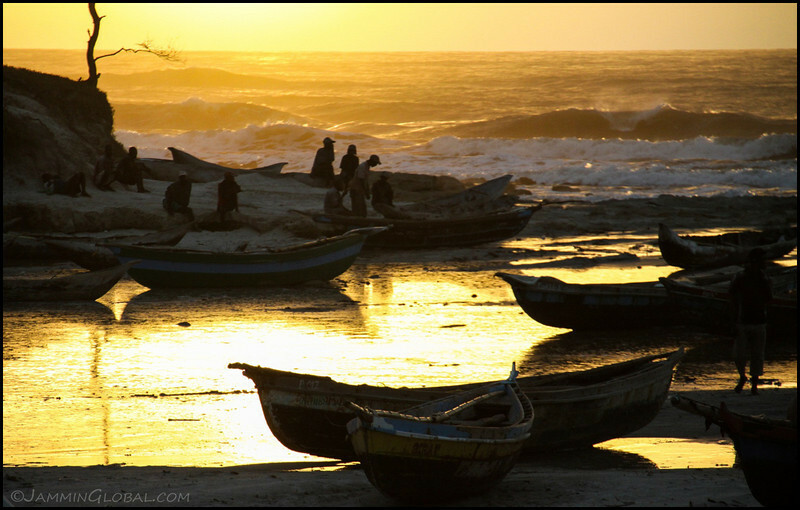 The morning rays highlighting the concentration needed in mending a boat. The other guy just wanted in on the photo. Everybody helping to turn this boat over, including the two ghosts up front. 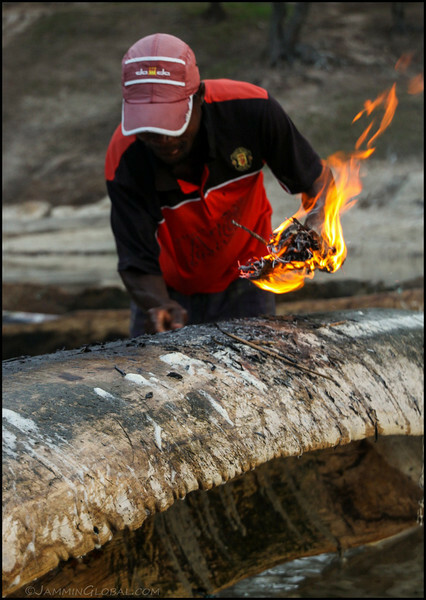 An older canoe being repaired with fire. As the fishermen gave up heading out to sea, they had to walk back through our camp and everybody just stopped and stared for a while. Fair-enough, considering we just stared at them on the beach. After about 10 minutes, we really had to pack up, so I politely asked if they could leave and most of them did. 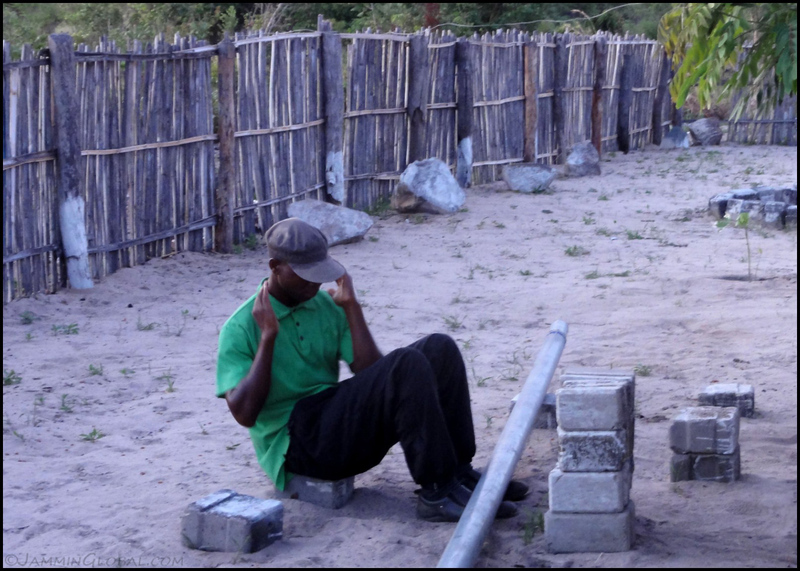 Our Pebane camp all packed up and we thanked the caretaker for all he did. The camping itself was free but we used one of his cottages to take showers, bought the seafood and beers from him and used his furniture and pots and paid him a round 300 Meticais ($10.12) for the both of us. Not bad, considering how expensive Mozambique usually is. 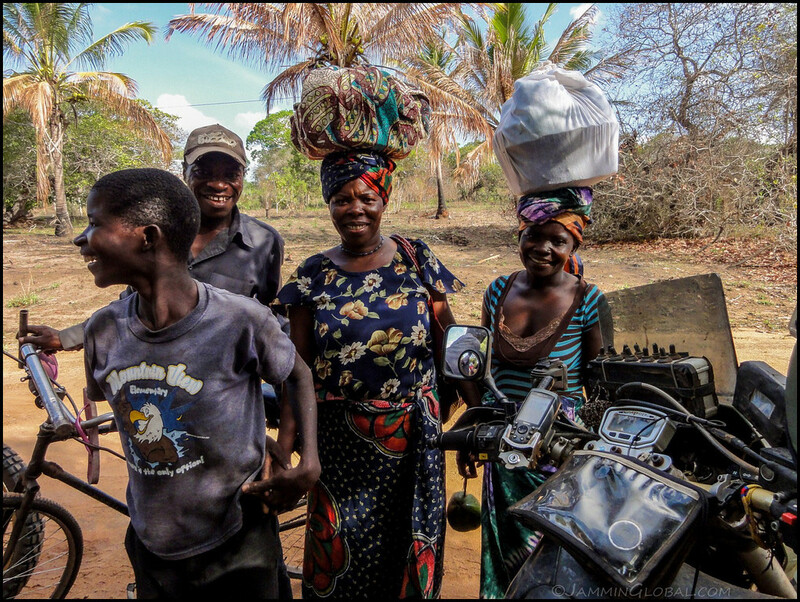 Well-rested for another long day along Mozambique’s rural coast. The children in villages were always cheering us on and we felt very welcome. Fueling up. This was the official filling station in this area. 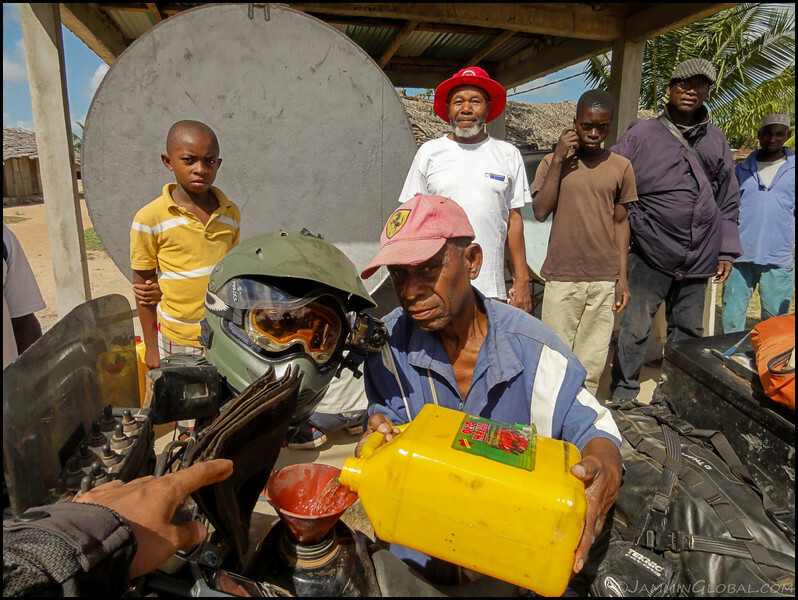 Fuel was kept in those huge tanks and sold by the jerry can. I recognized this sweet. It was coconut burfi! My mother makes this a lot in South India and what do you know, there’s an excess of coconuts in Mozambique and they figured out the same sweet to make from it, or maybe there’s been some recipe exchange over the years. 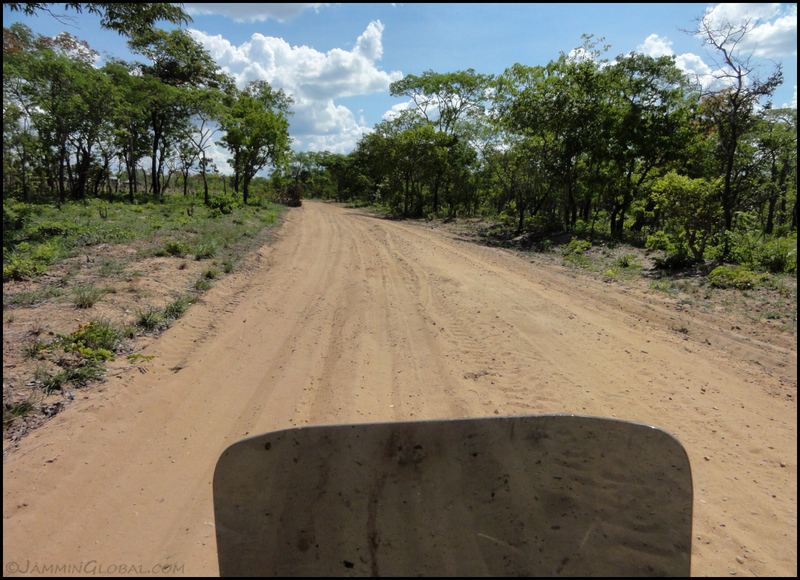 Leaving the towns behind, it was back into the bush. 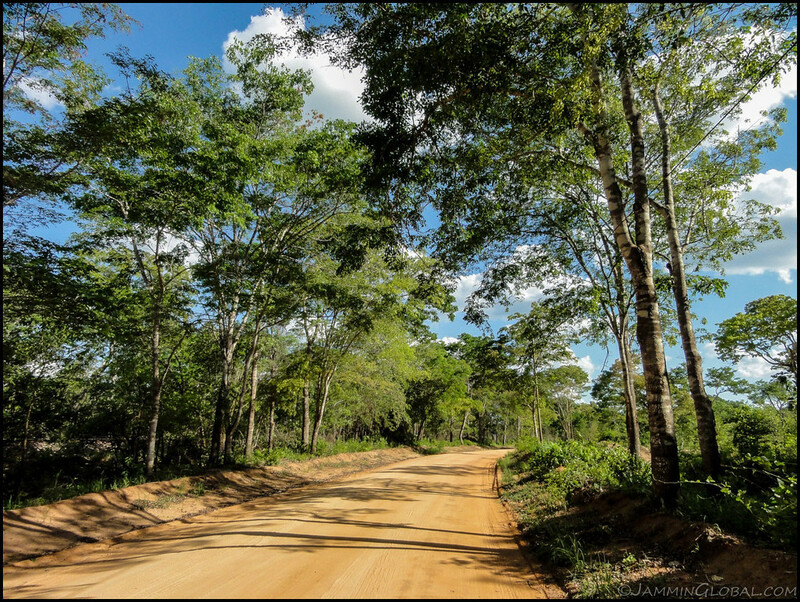 A bright, sunny day through forests and corrugated roads. We were both fatiguing quickly. After 30 kms of fast-riding over washboard, we needed a good 15 minute break, before going back in for another beating. 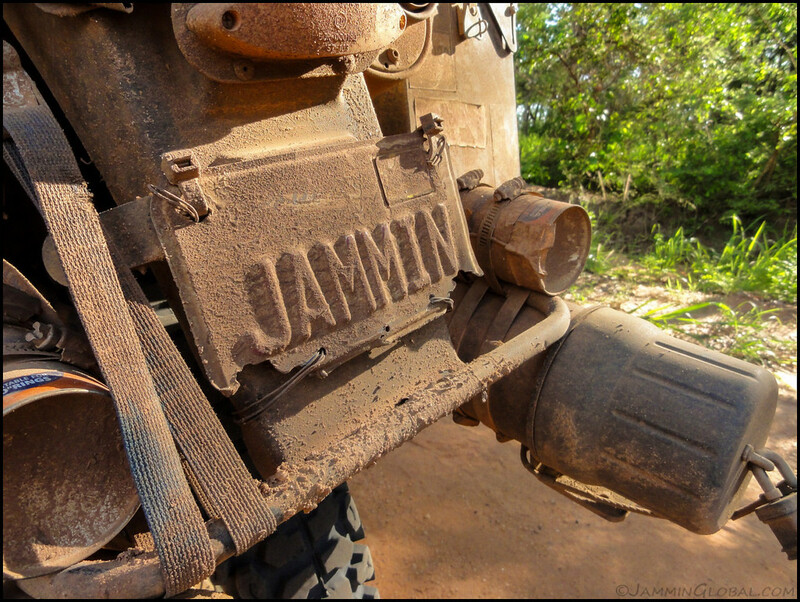 It was a long day with 300 kms (186 mi) between Pebane and Quelimane and most of it was brutal washboard. 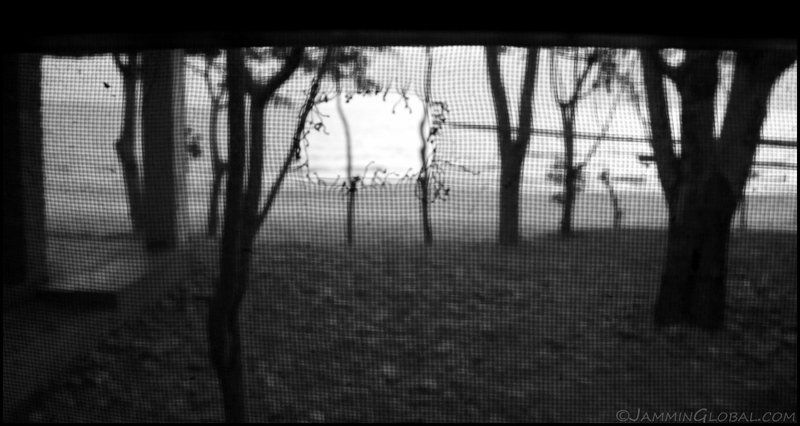 During one of the breaks, I noticed this huge crack on sanDRina’s frame. Oh no! This must’ve happened on the first day of this coastal adventure when I hit a bridge at full speed and landed really hard. The forces must’ve gone through my rear shock mount and cracked here. 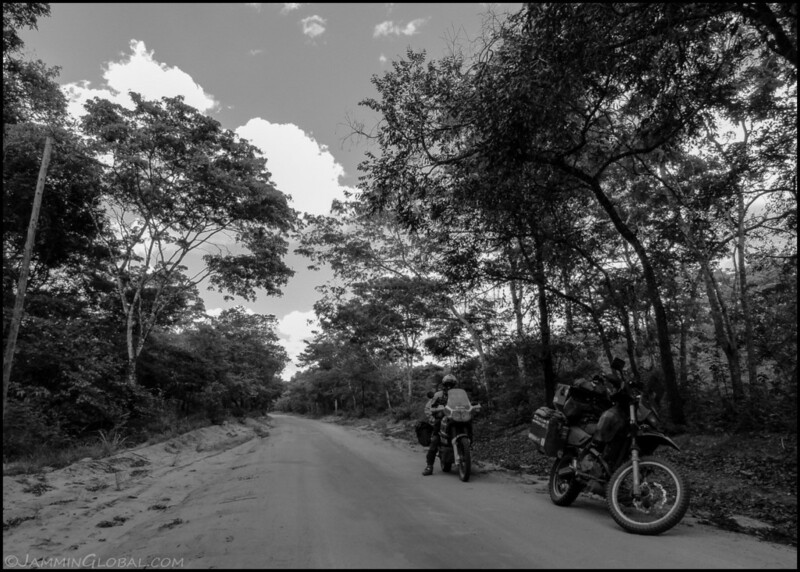 We were still in the bush and had over 600 kms (373 mi) till the next city of Beira. …get back on the bike and ride out of here, over more washboard. I was hoping the crack wouldn’t get worse. 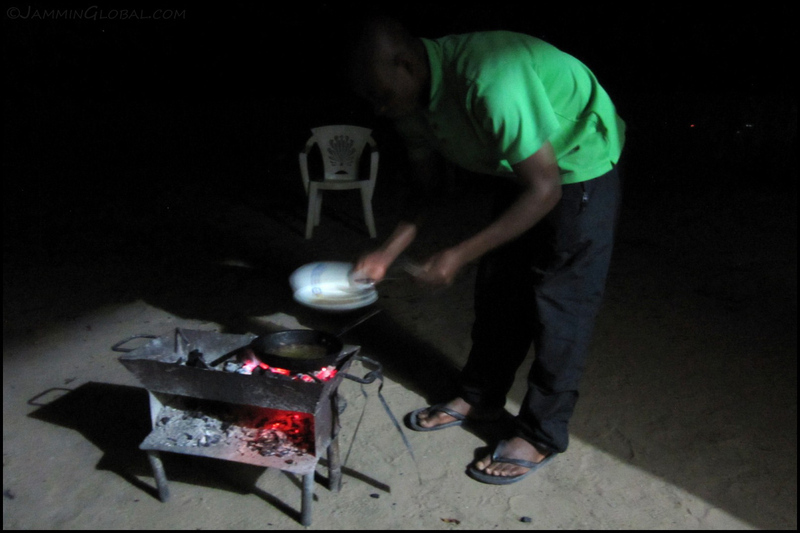 We arrived at Quelimane and setup camp at this old hotel and got the caretaker to setup a charcoal stove and we were both so tired today, we just had him salt and grill the fish for us. It was a 4 kg pedra and again too much meat for us but we ate most of it. On my long journey, there were various small adventures and the ones I cherish the most are the ones that take me off-road for it is there that we pass through remote, rural lands and see the people who live far away from the civilization we know. 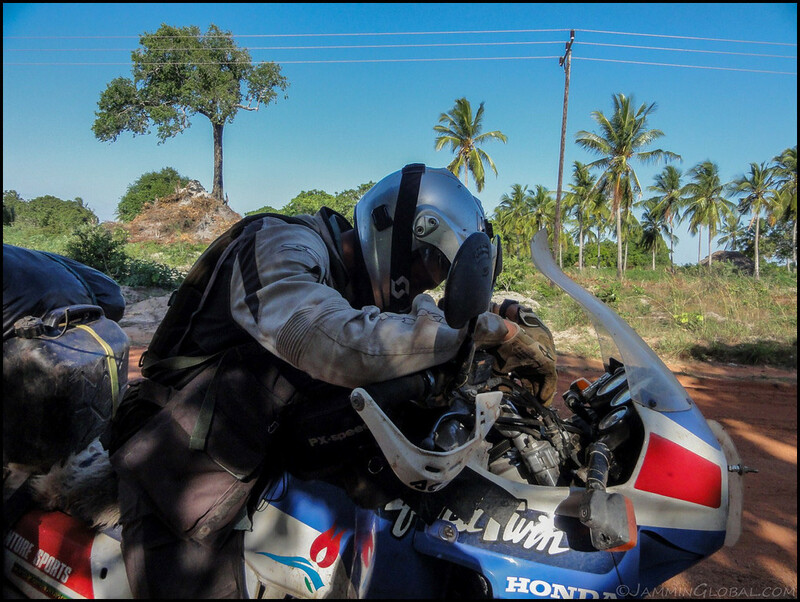 After a day-off at the enigmatic Ilha da Mozambique, I teamed up with Rob, a South African rider heading from Barcelona to Durban on a Honda Africa Twin, and we journeyed through the coastal roads of Northern Mozambique. 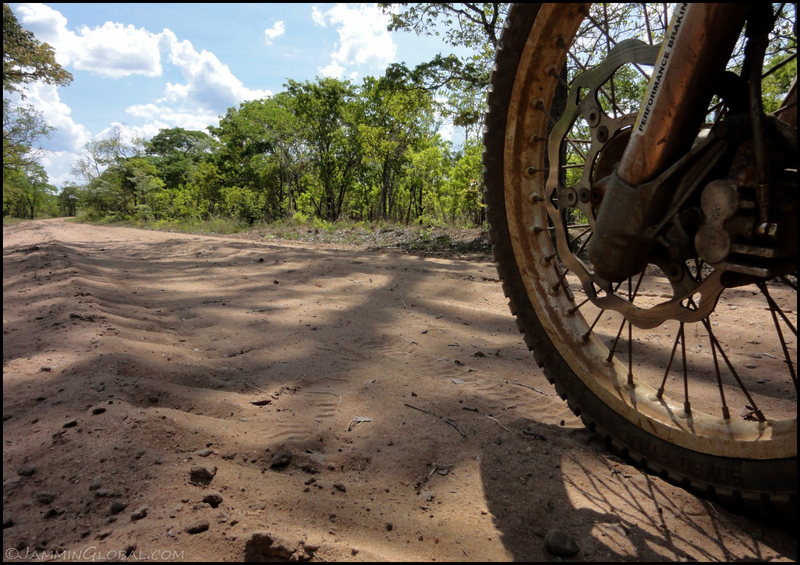 The rainy season was in full swing but it didn’t make the off-roading a chore and actually helped us out by firming up the sand and cooling down the temps. After our first night of camping by the shore in Moma, we had an epic estuary crossing, only realizing we were drenching the bikes in salt water at the end. But all good in the spirit of adventure and some serious technical riding and non-stop corrugations followed us into Pebane. 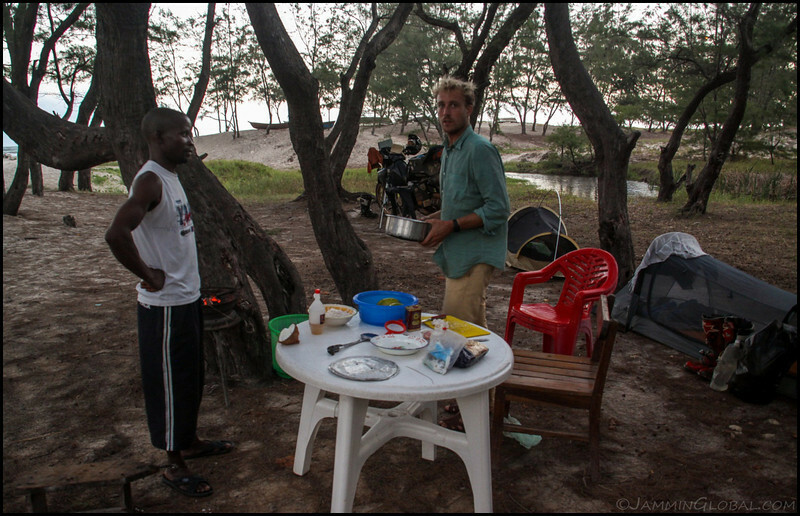 Rob and I heading out from Causarina Camping across the waters from Ilha da Mozambique. 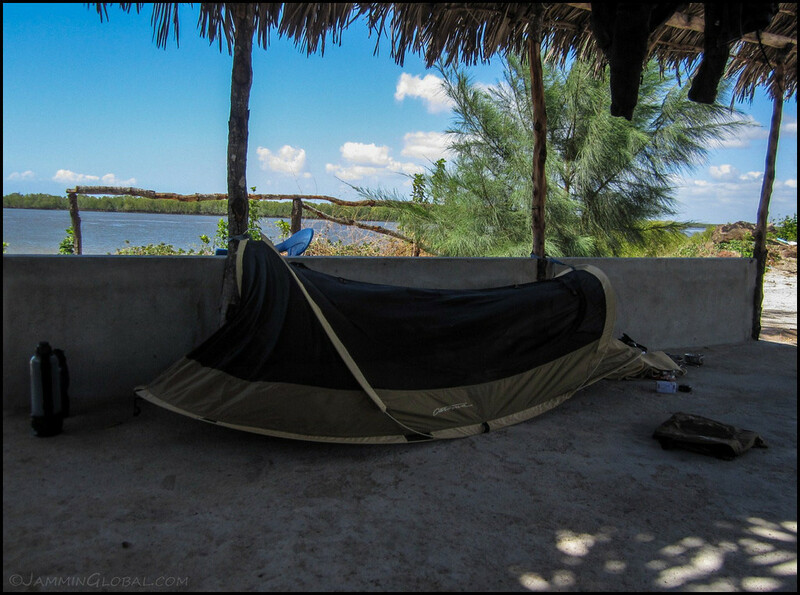 We slept on the sand in our tents and would be hugging the coast from here down to Beira. 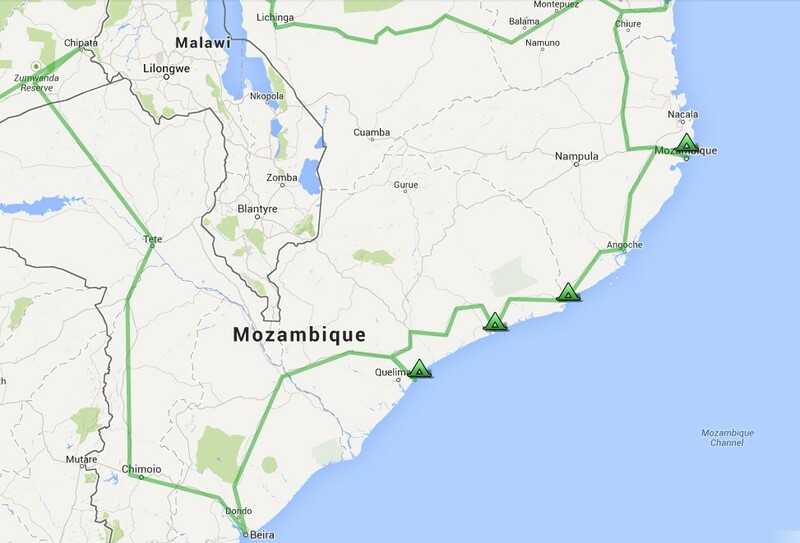 Here’s the route we took for some coastal riding down Northern Mozambique. 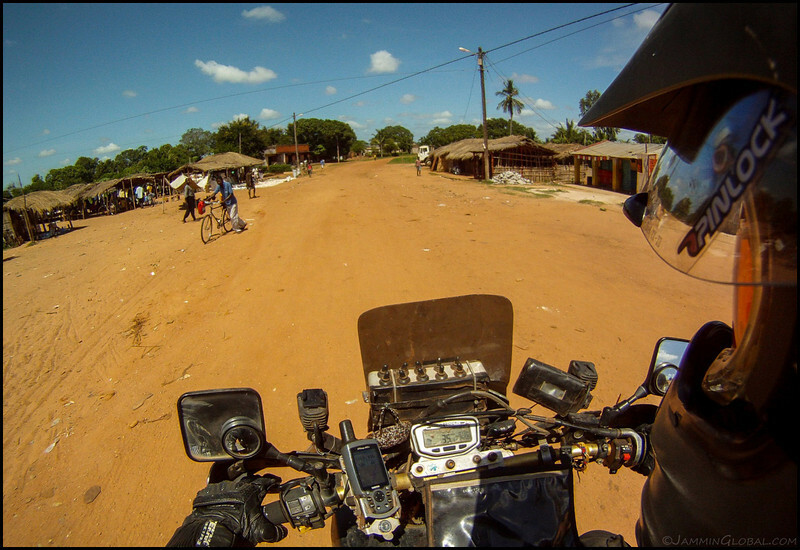 From Ilha, we camped at Moma, Pebane, Quelimane and then into Beira for a total distance of 1,384 kms (860 mi). Click on it to go to the interactive version in Google Maps. 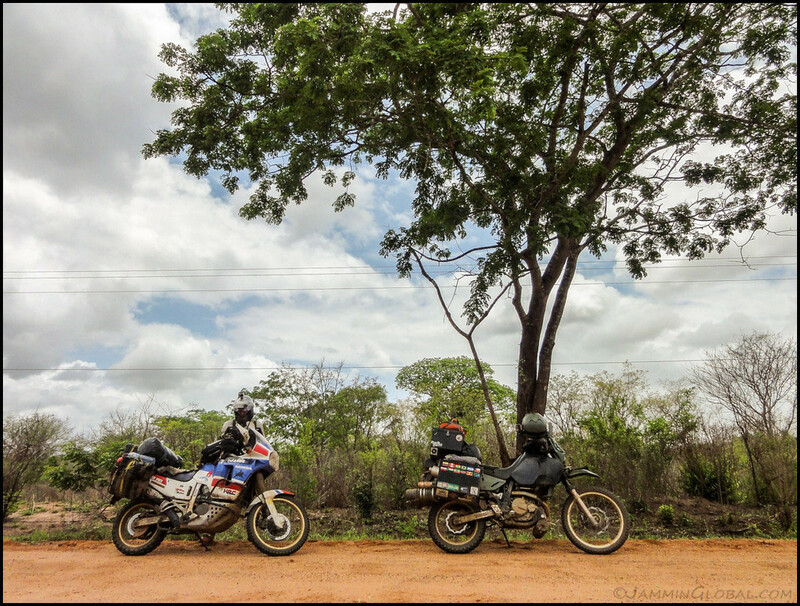 Old School Adventure Motorcycles: Honda Africa Twin and Suzuki DR650 riding Mozambique. 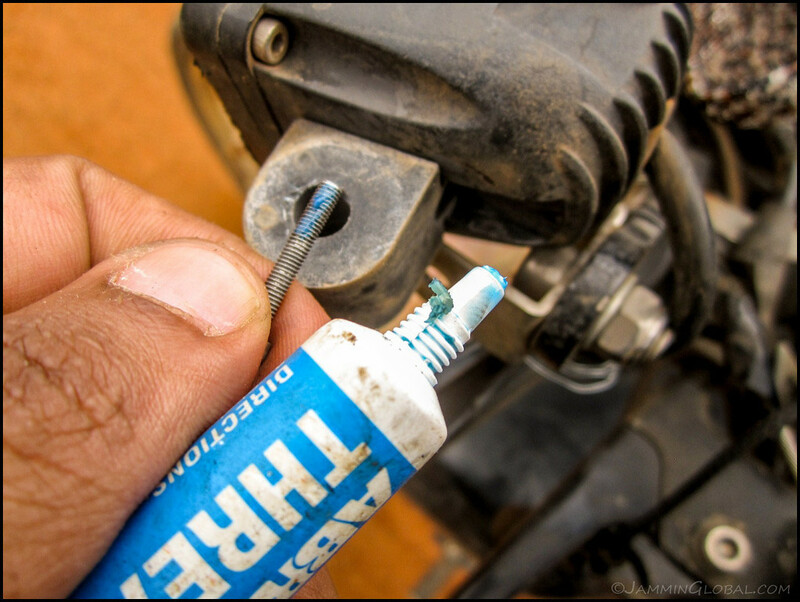 The roads started off with some heavy corrugations and one of my auxiliary Vision-X LED lights worked itself lose but nothing some thread locker couldn’t fix. At the turn off to Angoche we refreshed with some coconut water, nature’s own sports drink with electrolytes, potassium and other good stuff, along with a light snack of fresh coconut meat. Big motorcycles don’t usually pass through these parts and a crowd quickly formed. Just curious faces checking us and our bikes out. Soon after, it started to rain and Rob and I had to make a call at a turn off. 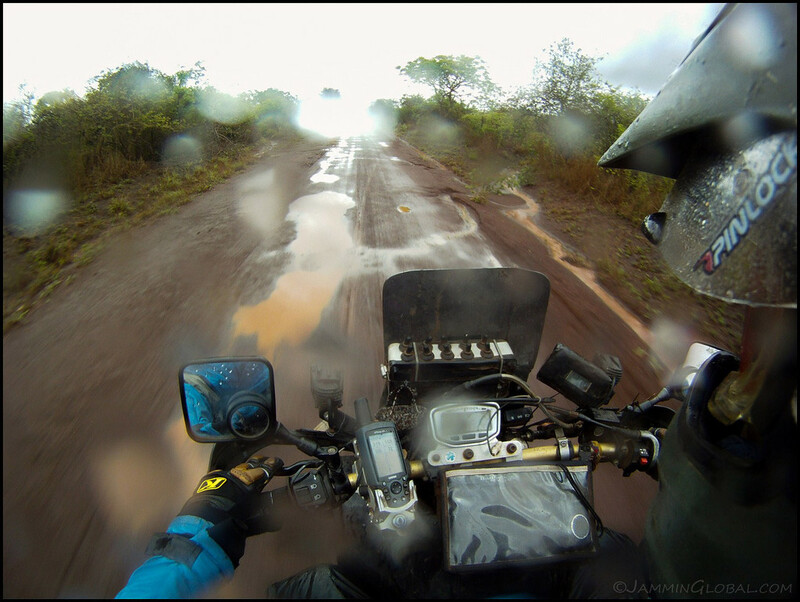 We could’ve ditched the wet off-roading for a boring tarmac ride through Nampula but stuck to our guns and figured the rain would pass. The mud roads didn’t get bad with the rain and it was actually nice to ride in some cooler temps. 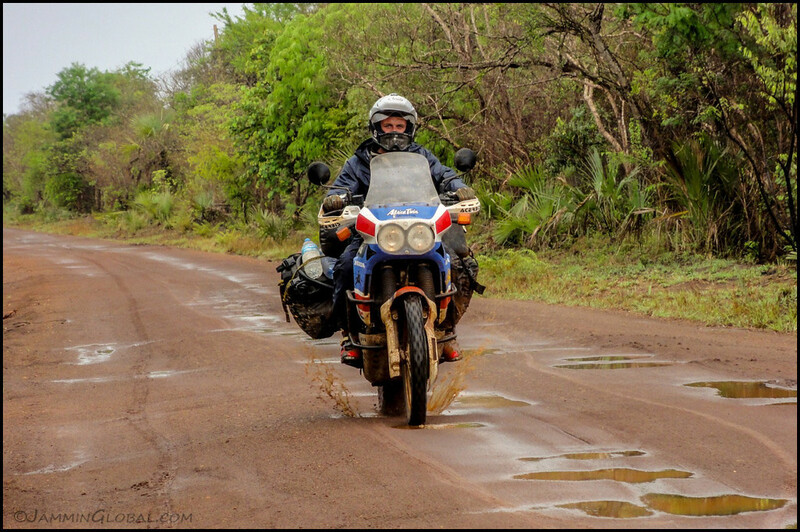 Rob on The Mule, his 1989 650cc Honda Africa Twin making splashes on the Northern Mozambican coast. 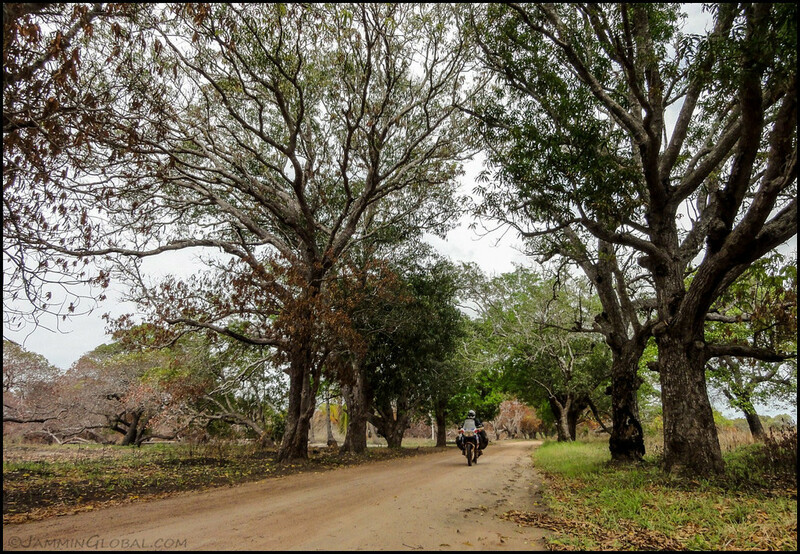 This is just a picture of a pretty road with some big trees and yes, an adventure motorcyclist riding through. “Eh, WTF! Stop braking in the sand.” Haha, poor Rob. I apologized for my inferior sand riding skills. I was leading because I had the GPS tracks but Rob was much more comfortable riding sand than I and a while back, when I came across a huge sandy section, I braked to pick the best line through and Rob couldn’t stop and took a fall. Ooops, all good. 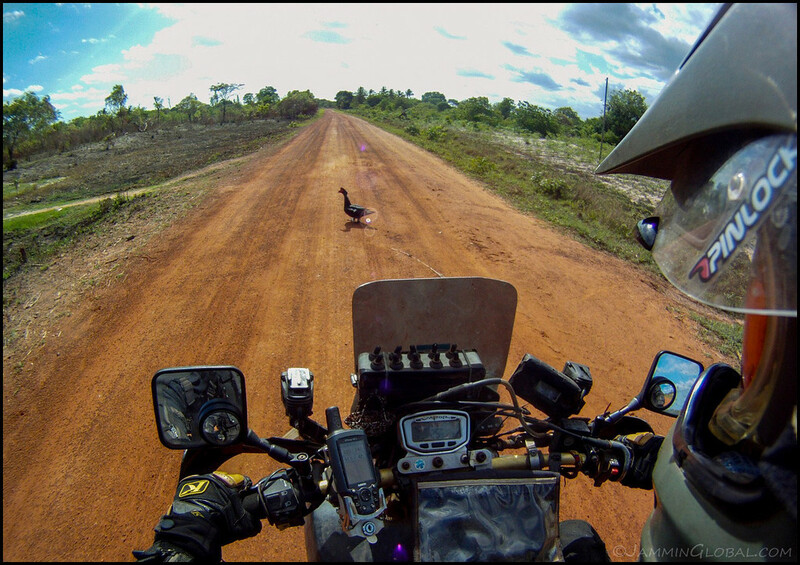 A little roadside Discovery Channel moment, brought to you by Old School Adventure Bikers. As is inevitable, whenever we stop, it’s only a matter of a few minutes before passing locals stop to take in the sight of strange looking men on strange looking motorcycles. This guy was carrying quite a load himself. He came over and then these ladies decided to stop and greet us and it was turning out to be quite a moment for them. 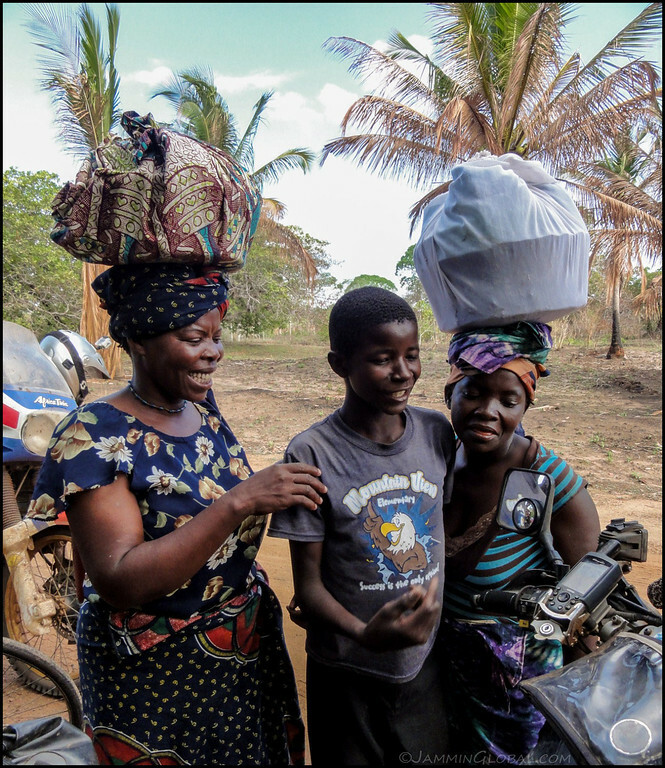 Our young man here took it upon himself to explain to these ladies what all the gadgets were on my bike. I can understand basic Portuguese and he was really confident in saying that my GPS was a cell phone and that box of switches was a radio. They were enjoying themselves. See, when people ask me what’s the purpose of my traveling through all these places, maybe one reason can be to bring some entertainment to the locals. You bet they’ll be talking about these two strange men on motorcycles for a few days to come. 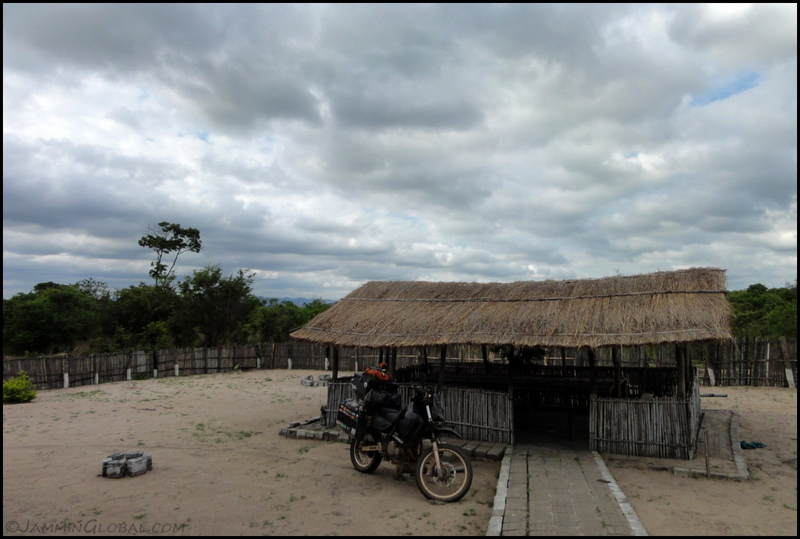 We reached Moma, having covered 330 kms (205 mi), and after going around in circles for a bit, Rob came upon the still-being-constructed but also rundown Nautica Club da Moma and we could camp under this hut for 250 Meticais ($8.43). 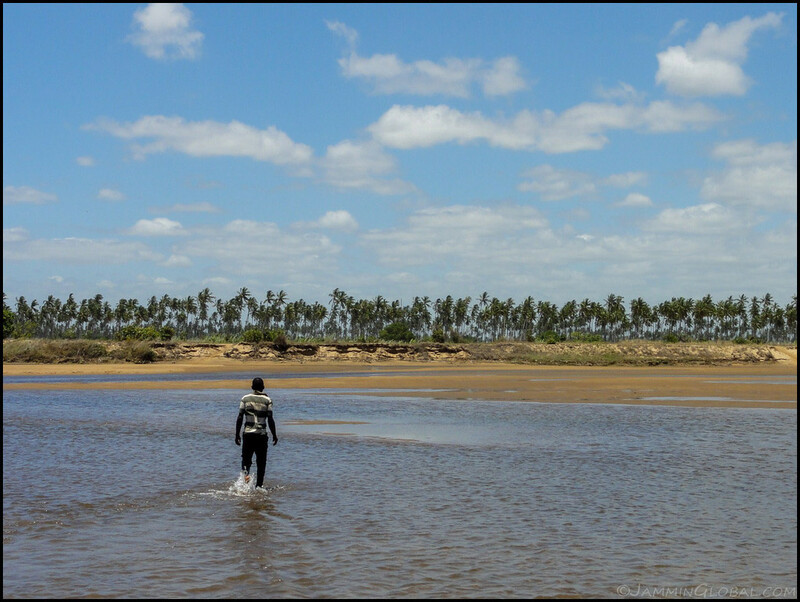 Mozambique is not a cheap country to travel through unlike its neighbors in East Africa but the journey is still worth it. For that price, we could take hot showers, charge our electronics and they even set us up with a grill and charcoal for the night. My Oxtar TCX boots taking in the sunset from our private bay and airing themselves out after a day of riding in the rain. We sourced us a kilogram (2.21 lbs) of prawns from a Chinese prawn factory and Rob, being a professional chef at fine-dining restaurants back in Spain, set about grilling them and served them with garlic butter and my contribution of a chili coconut rice and miso soup. The ladies ready for another day of off-roading down the Mozambican coast. sanDRina, just the way I like her – covered in mud. 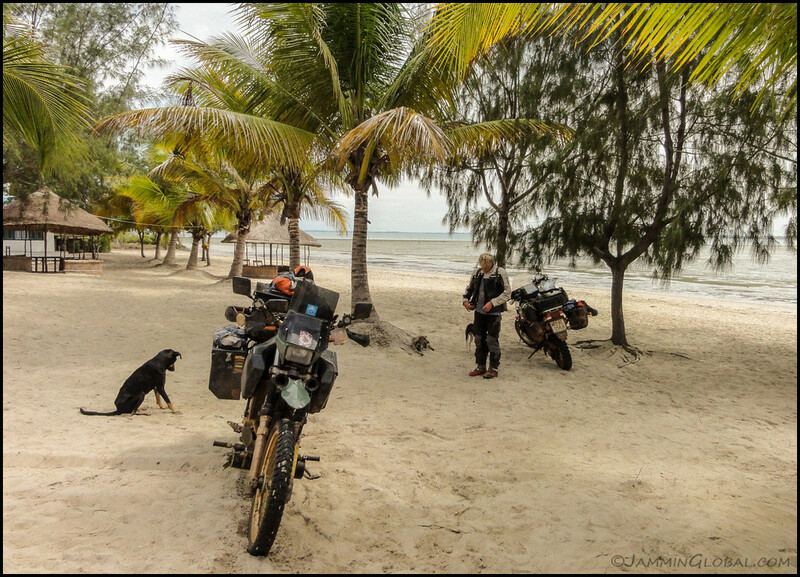 Rob’s Africa Twin looking well-traveled. This bike was the preferred steed for world travelers in the years past but has now been pushed aside for all the new fancy adventure bikes coming out. Unlike the DR with its single-cylinder engine, this one has a V-twin, which changes the character of the riding machine. The Africa Twin was never sold in North America, so it wasn’t even an option when I was choosing a motorcycle for my trip. 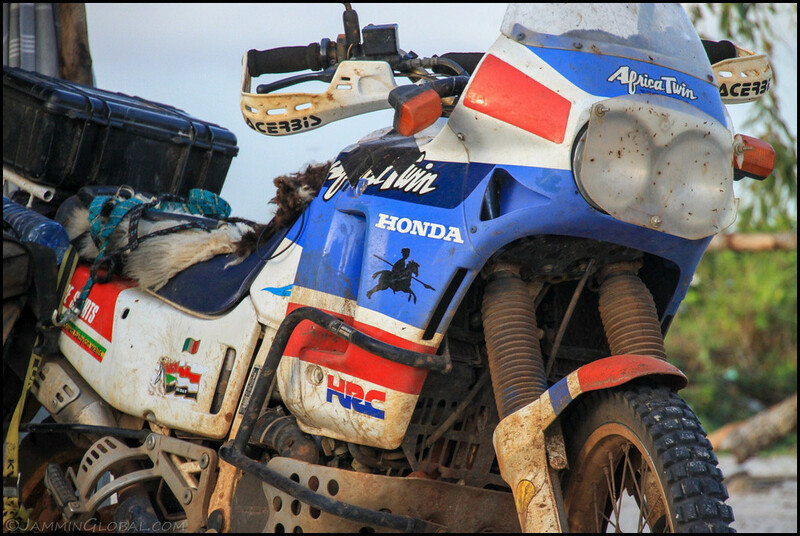 But they say Honda’s working on a new Africa Twin for all markets. My one-man Catoma Twist tent, which is basically just a self-supporting mosquito net that comes with a rain cover. The winds were very strong at night and I had to tie the tent to the poles. It’s small but comfortable enough and being compact when packed, it’s not a bother in my luggage. Fueling up in Moma before heading out for the day. Petrol being filtered by a coffee strainer. The good thing about traveling with these old school motorcycles is that they’re not fussy about the quality of fuel. Rob gave me a few tips and I was now really enjoying to ride in the sand. All it takes is more throttle to let the motorcycle do what it’s designed to do – keep itself upright. It’s only when the user forces unnatural inputs through a jittery hand that the front wheel wobbles and topples the rider. …there was lots of water to cross to get to the other side. Rob is scouting the best path across. 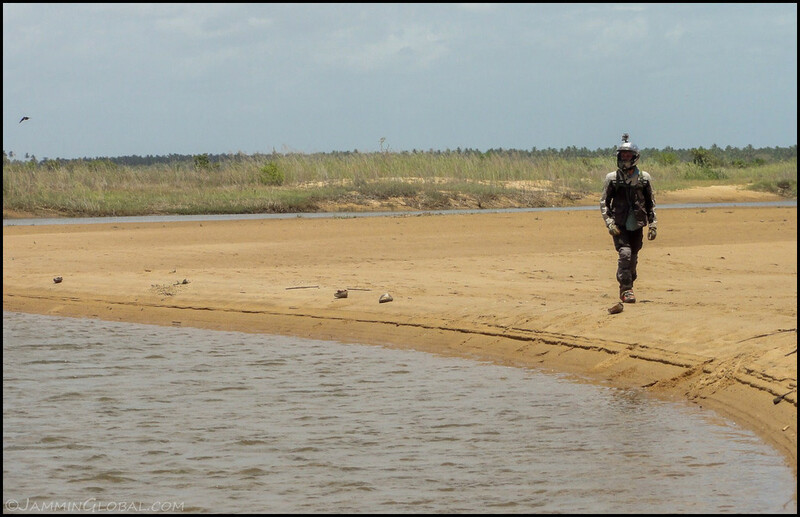 These locals jumped into the chance of guiding us across so we made them walk a path to judge the depth of the water. We rode through with no issues and crossed maybe 200 m (650 ft) of shallow water. We’re taking a break here at the middle of the entire crossing. It was only at the last water crossing, which was very deep resulting in a big splash, that we finally tasted the water and realized it was salty! Oh no, this was not a freshwater river but actually a salt water estuary. Great, we just basically bathed our bikes and our gear in salt water. 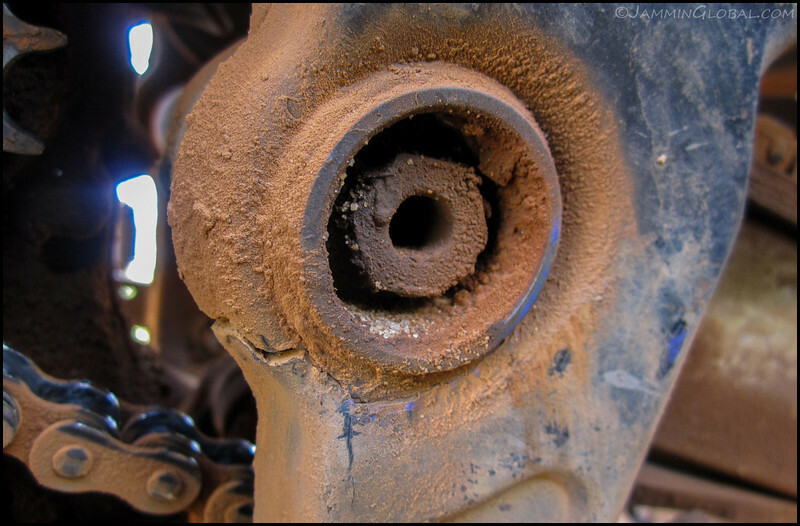 Salt – the nemesis of steel and the harbinger of rust. But meh, what’s done is done, we’ll wash them later. 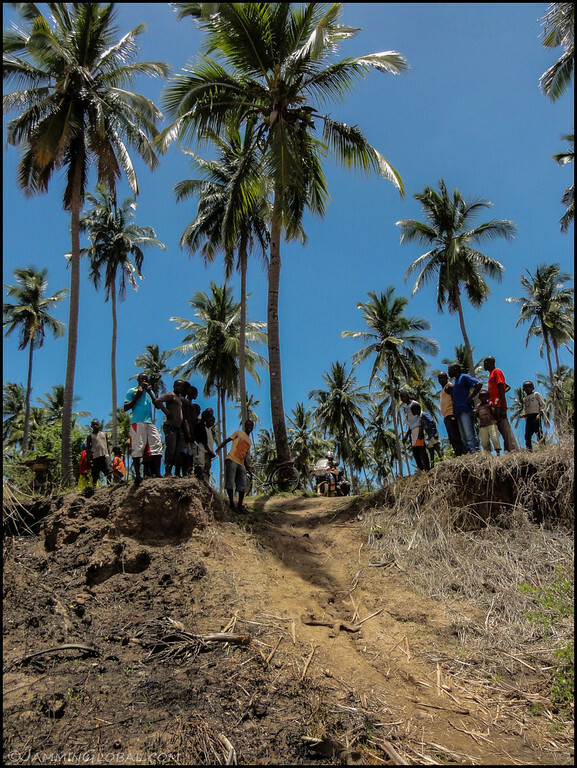 We followed our local guides and took these footpaths to get back to the main road. And just when we got there, we saw that a truck had crossed the supposed missing bridge. Rob and I looked at each other and laughed in realizing that we had just had a crazy adventure through salt water for fun. Makes for a good story and we shot some great video. 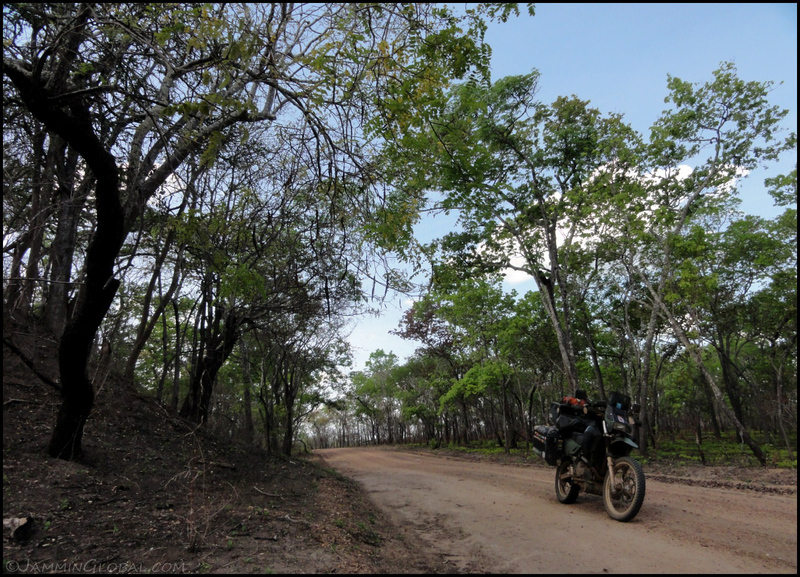 After some technical riding in and around huge, muddy potholes, the road got better but the riding was challenging with the constant traffic. Not on-coming traffic, but cross traffic. Chickens were the worst because they’re so scatter-brained. I much prefer duck crossings because once they commit to crossing, they will follow through with their waddle. Humans on bicycles were just like the chickens – freaking out upon hearing us thundering down upon them. 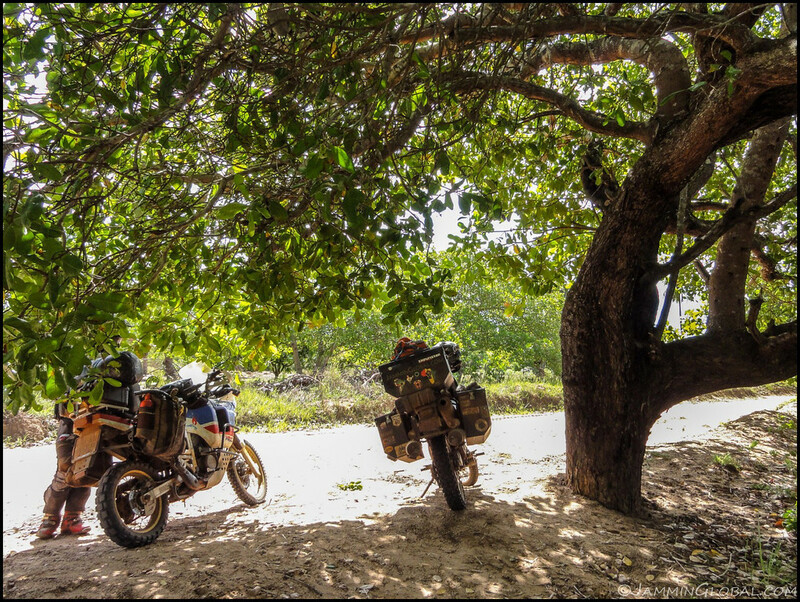 Seeking shelter from the strong sun under the shade of the vast cashew tree plantations. 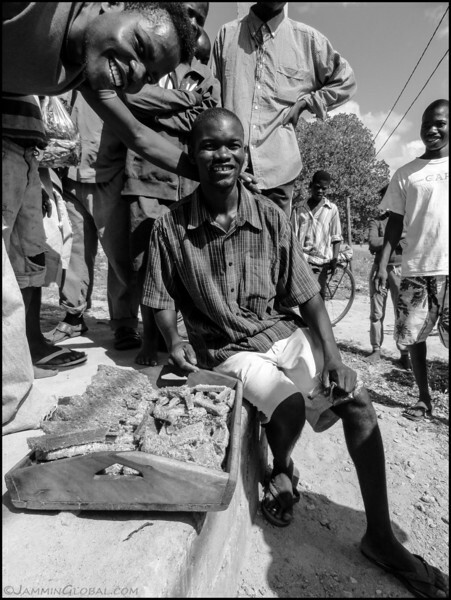 Cashew nuts are a premium product with a large profit margin but all the plantations are under the control of the local mafia with none of the benefits going to the locals who live in and around them. 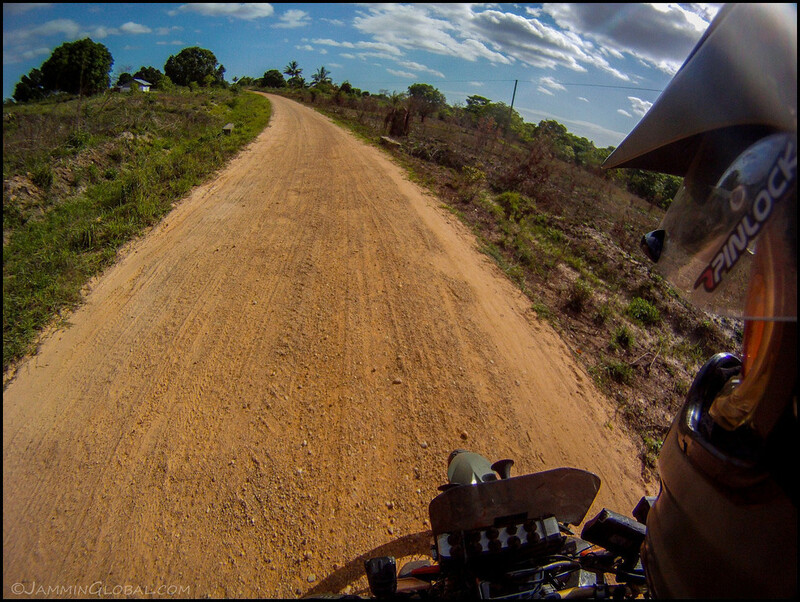 Enjoying the off-roading down Mozambique’s coast. 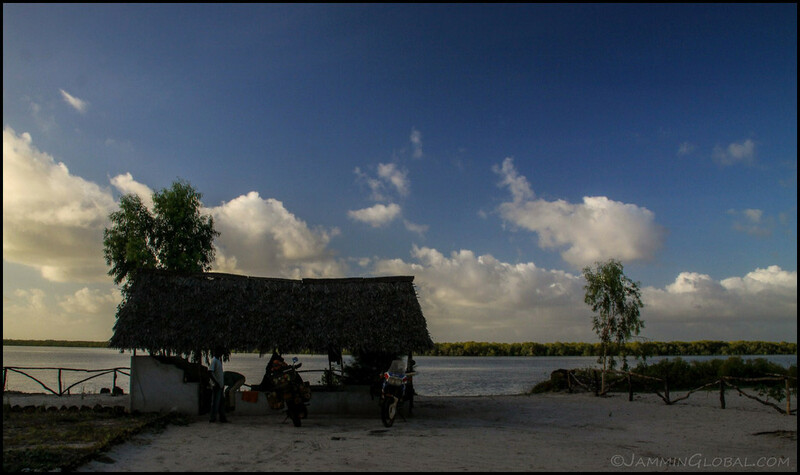 From Pemba, I headed south to Ilha de Moçambique (Mozambique Island), the small island that was the epicenter of Portuguese East Africa. It lies just off the coast, near Nampula, and at 3 kms long by 500 m wide, it’s densely packed with old Portuguese colonial buildings and infused with Arabic and Swahili culture. Vasco da Gama landed on the island in 1498 and subsequently, the Portuguese established a naval base to resupply and protect their trade routes to India. Before the Portuguese arrived, an Arab merchant with the name of Musa-Al-Big was living there and his name was given to the island and later to the mainland. 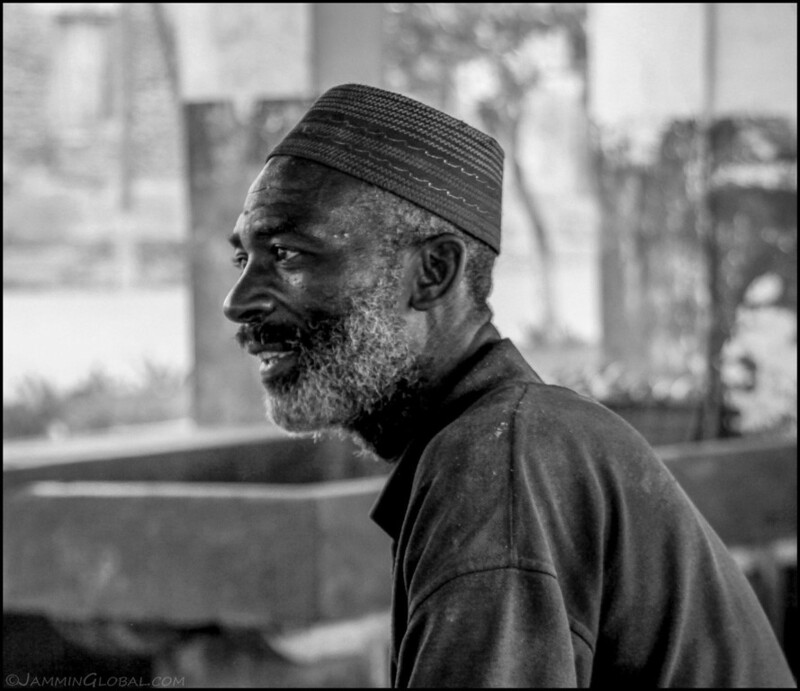 Besides soaking in the colonial architecture and the relaxed vibe of Ilha de Moçambique, I was there to visit a charity organization called Projecto Oceano who run afterschool programs for the kids on the island. As per my duties to The Muskoka Foundation, who connect overland travelers with volunteer opportunities, I was there to see if Projecto Oceano would be a good partner for Muskoka. 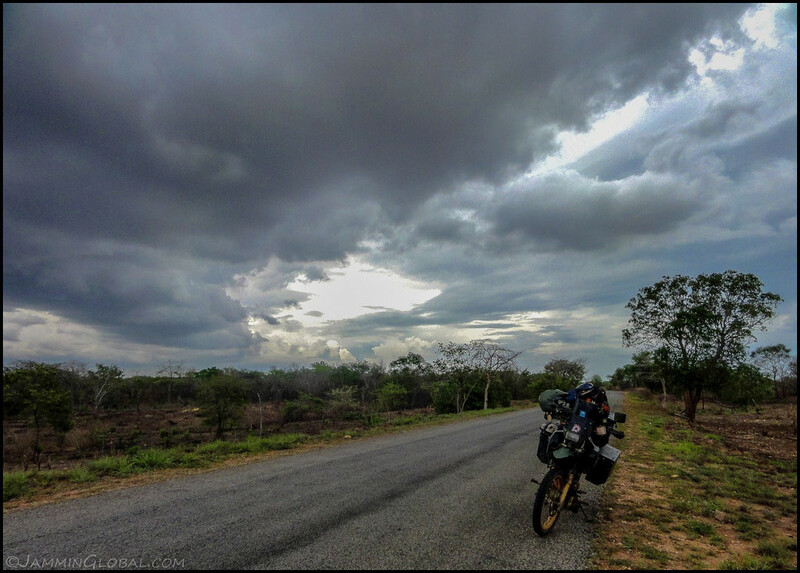 I left sunny Pemba and realized that I was riding straight into a thunderstorm. Battling the crosswinds made for a good workout. 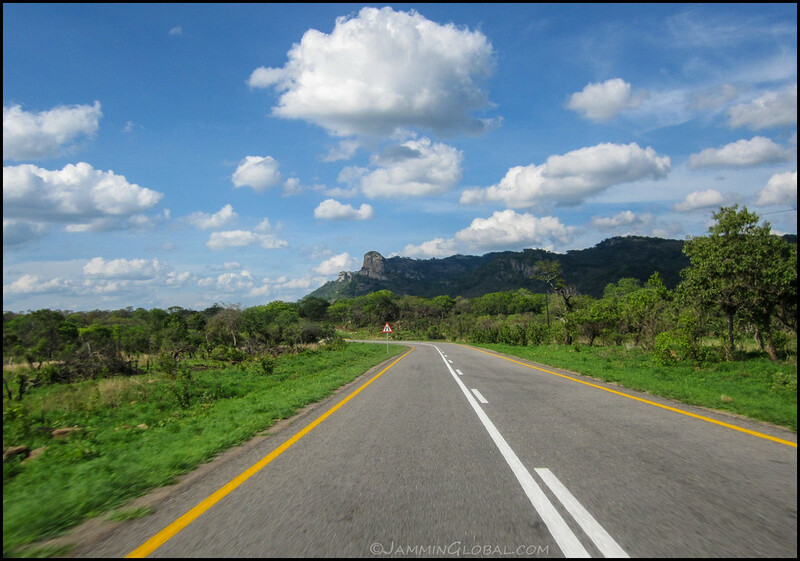 Enjoying the sight of pointed inselbergs that dot the northern Mozambican landscape. I caught up with the thunderstorm and just as before, I sought shelter with the locals as the heaviest of the rain and lightning passed. 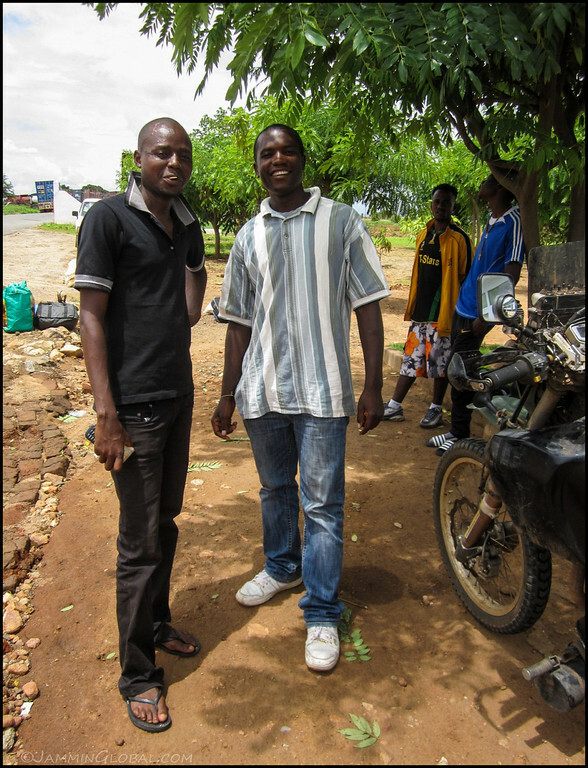 Friendly guys and curious about this stranger on his grande moto. 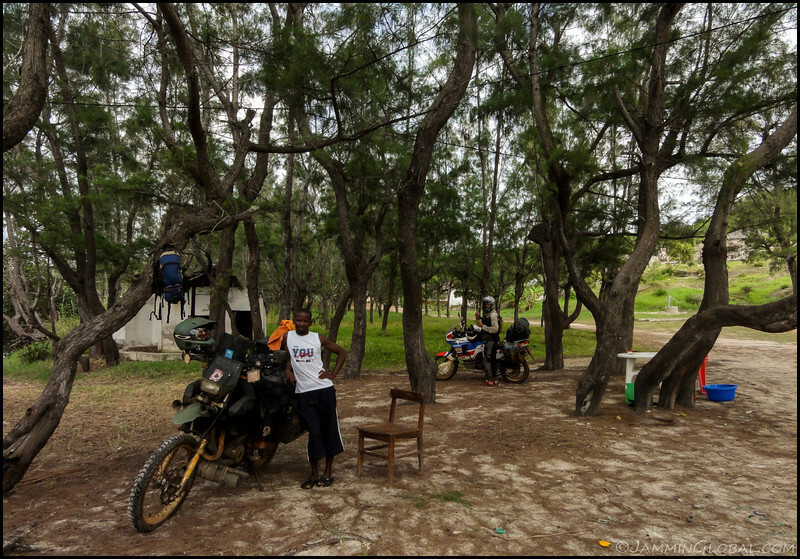 The rain eased and after 409 kms (254 mi) from Pemba, I arrived at Causarina Camping, just across from Ilha de Moçambique. 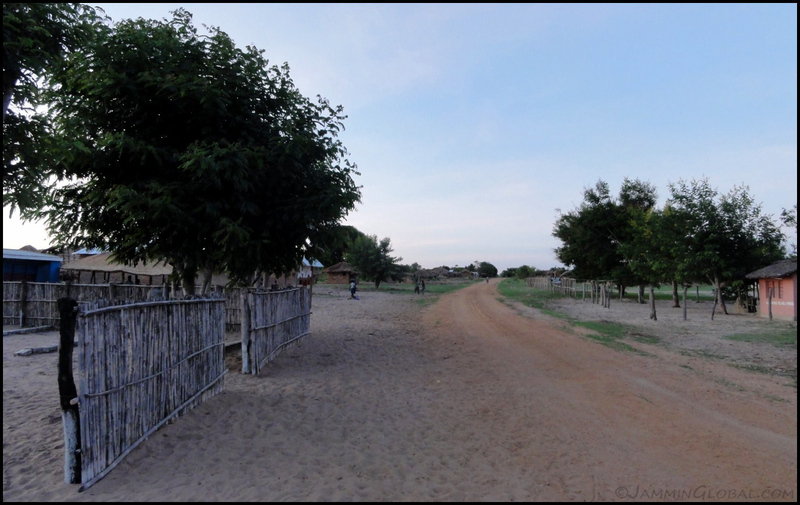 The place was empty and I setup camp under one of those thatched huts. A beautiful view from my beach campsite. That’s Ilha de Moçambique on the horizon, connected to the mainland by a single lane causeway. 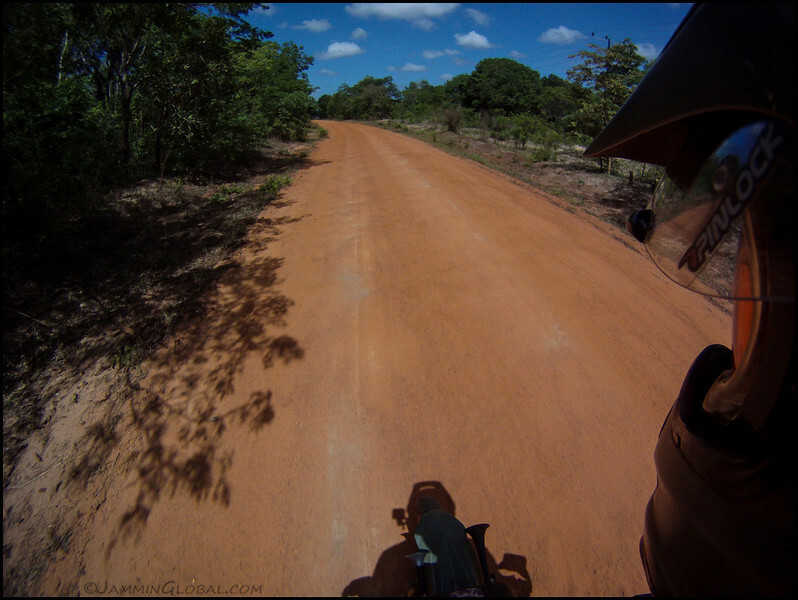 Riding to Ilha de Moçambique on the single-lane causeway, which was built in the 1960s. 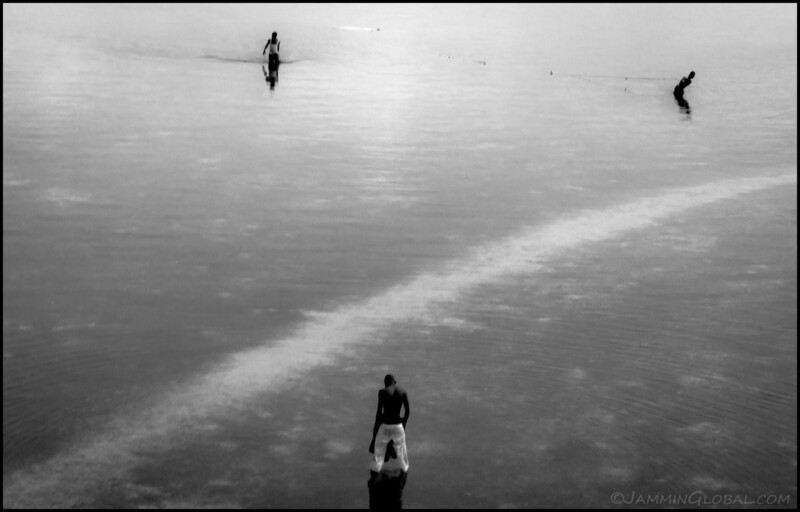 Fishermen walking on water. The bay is very shallow and the tides create dramatic changes. 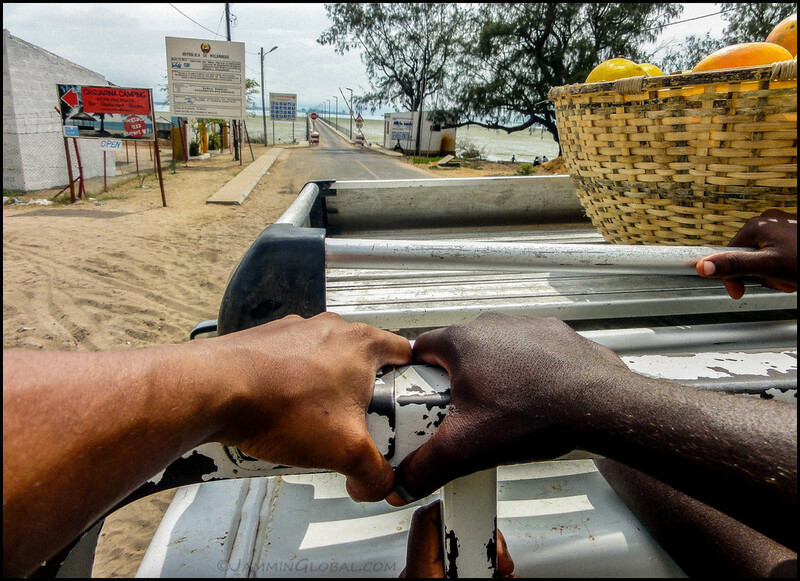 Entering Ilha de Moçambique and passing through Makuti Town, where the majority of the island’s inhabitants live. 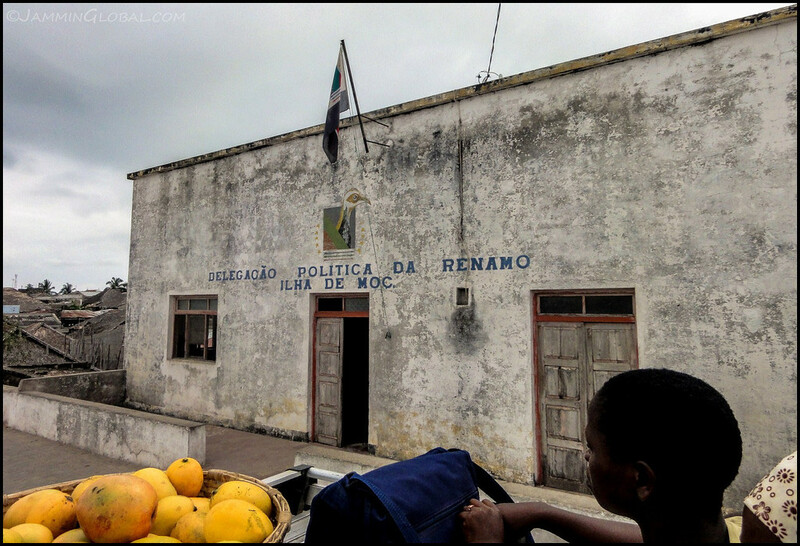 Renamo is the opposing political party in Mozambique and they fought a brutal civil war from 1977 to 1992 with Frelimo, who are currently in charge. 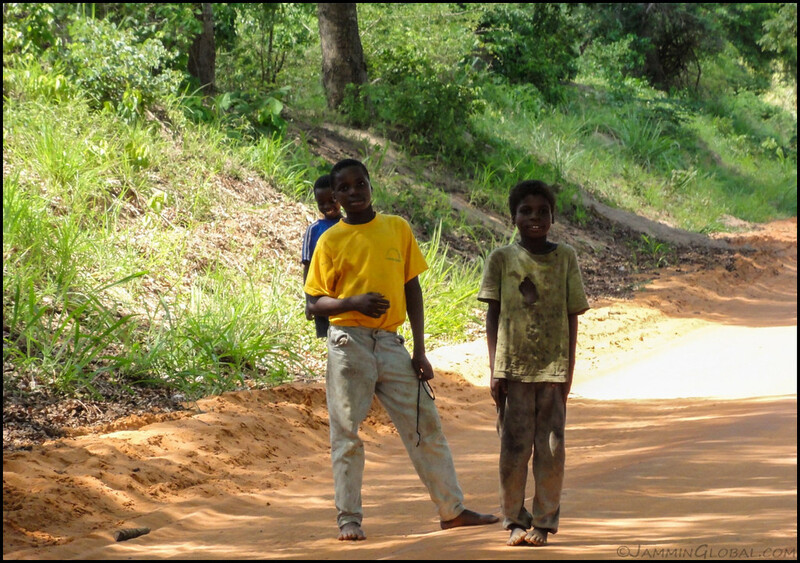 Renamo generally control the north, which is less developed, while Frelimo controls the south, the more prosperous half of Mozambique. 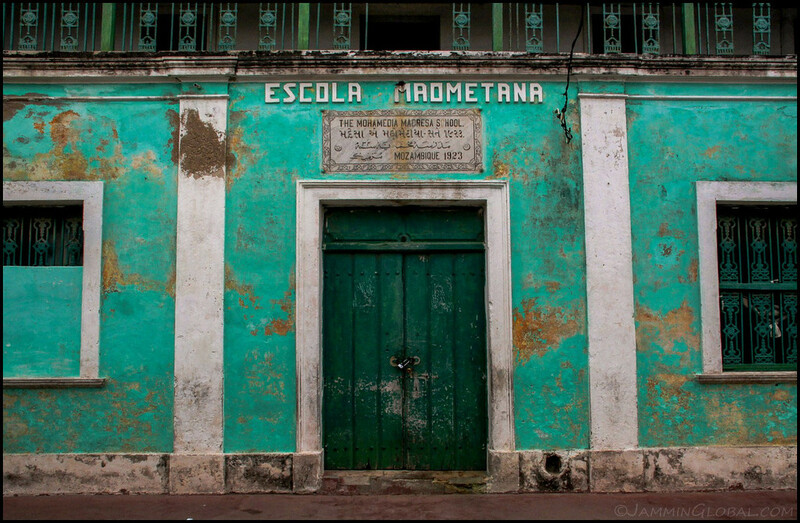 I hopped off the pickup truck and strolled around empty Stone Town, noting this old madrasa (Islamic school). 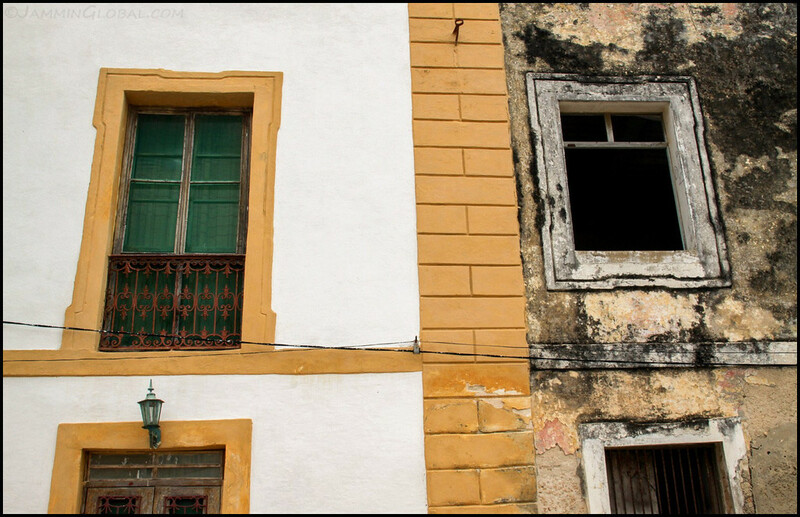 The buildings on Ilha de Moçambique are pretty rundown but as captured here, there’s quite an effort to spruce things up with some new paint and attract the tourists. 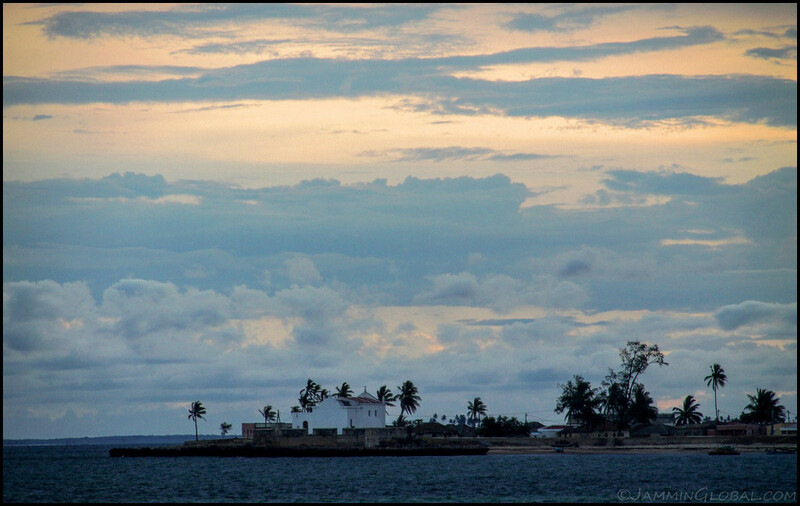 I’ve been told that Ilha is like what Zanzibar was before it became popular. …super sour fruit. He sprinkled some sea salt on it but it was still pretty sour. Hey, I’ll try anything at least once. 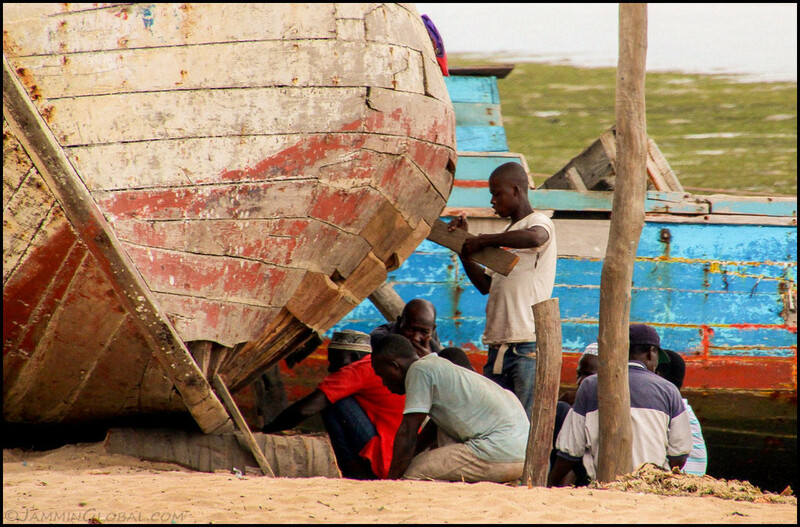 Fishermen repairing their boat. 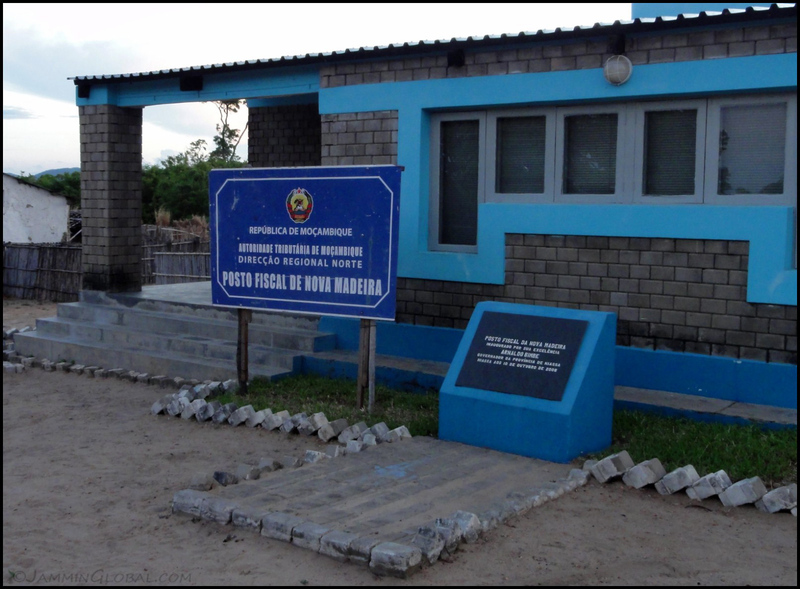 Ilha de Moçambique was a big port in its hey days but things have slumped as business has moved to other ports, such as the new one at Nacala. Time for a mid-morning snack and I found this hole-in-the-wall eatery. It was a family’s house and I was sitting at their dining table with a bed to my right and a washing area in front. 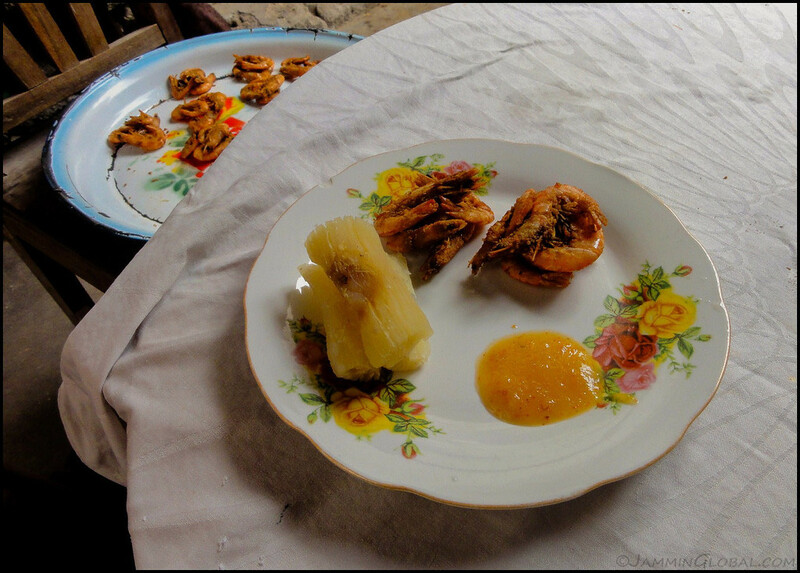 They were serving up fried camarões (shrimp) for 5 Meticais ($0.17) for a bunch and 5 Mets for the boiled cassava. Served with a tangy hot sauce. …his daughter who was tasked with cleaning and washing. Back on the streets and walking past the old armory. 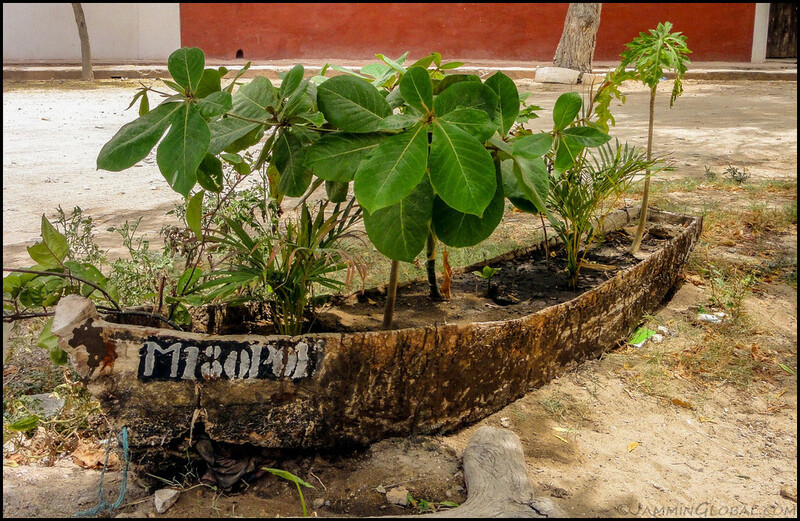 A grounded dhow, which once transported people and now transports nutrients. 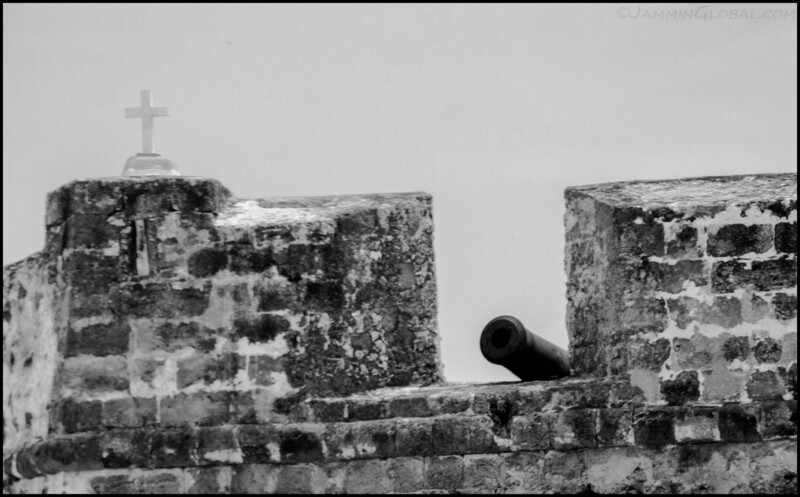 Cross and canon, the two arms of Portuguese colonization, at Fortaleza de São Sebastião. 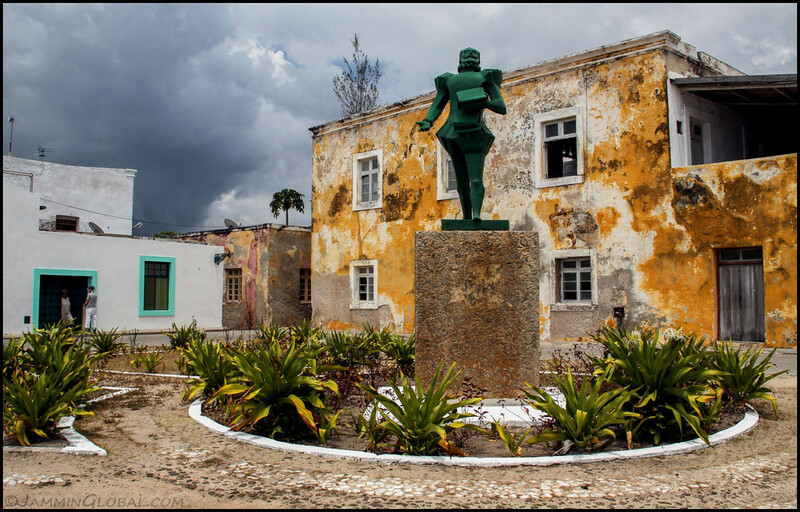 The statue of Luis de Camões, a poet who fell in love with a local slave girl. The old and the new. The entire island is a UNESCO World Heritage site and money is pouring in to renovate the dilapidated buildings and turn them into boutique hotels. 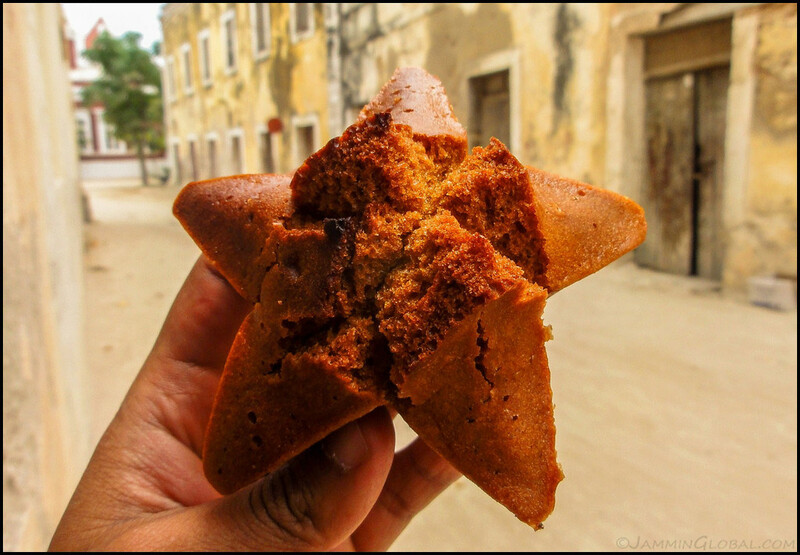 A star-shaped cake that a boy was selling down one of the numerous alleys in Stone Town. 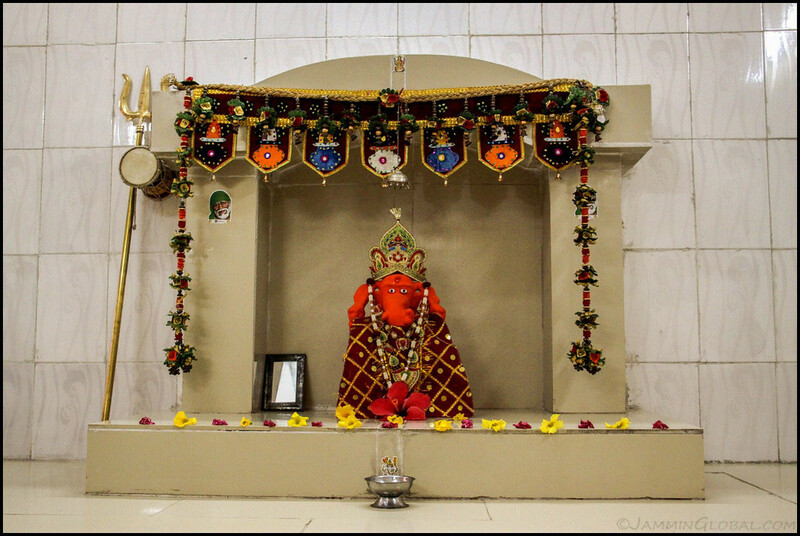 Ganesha on Ilha. I stopped by the Hindu temple that’s been here for a few centuries. Such a mix of cultures on such a small island. 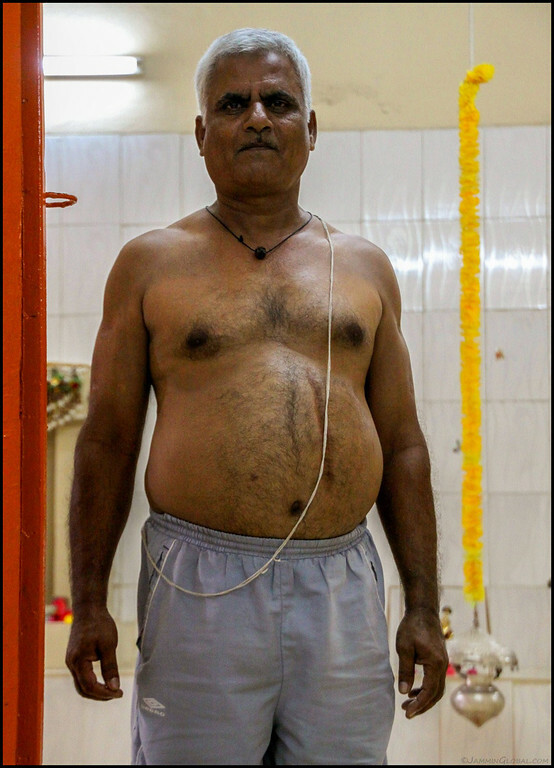 The Hindu priest, stationed all by his lonesome self on Ilha. He was so excited to meet another Indian as his family is back in Diu, an ex-Portuguese colony in western India. 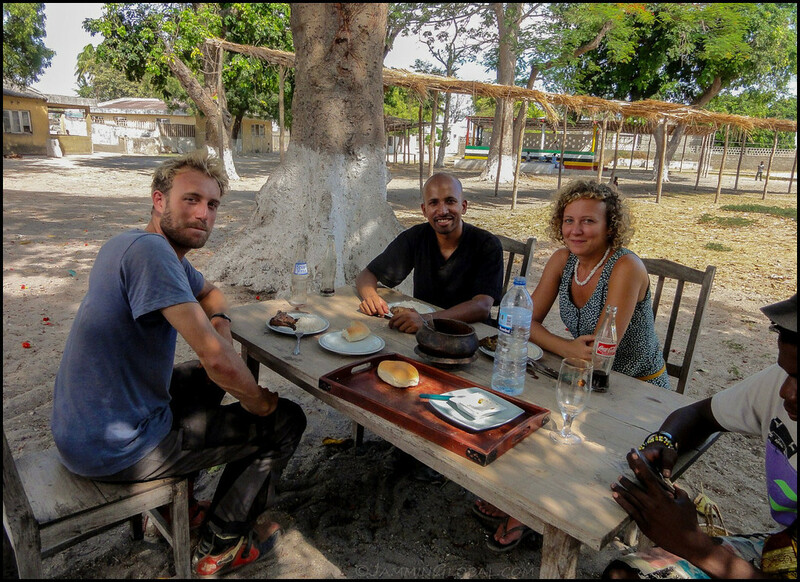 I met up with Rob, who rode down a day later than me from Pemba and we both met up with Jessica who runs Projecto Oceano. Jessica having a weekly meeting with some of her students. Her organization provides afterschool activities for the kids as the educational system on the island is very basic. I was here to see whether Projecto Oceano would like to partner with The Muskoka Foundation, who connect overland travelers with volunteer opportunities in distant lands. I got the ball rolling and now, the next Muskoka traveler coming down Africa can choose to spend a few days on Ilha and run some workshops with Jessica for the kids. 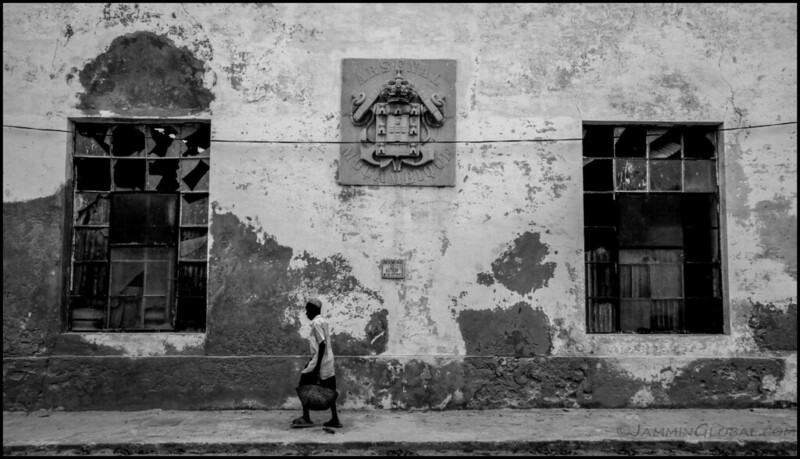 The old port on Ilha, which traded heavily in spices, gold and slaves. A guard and his friend playing their version of mancala next to a huge canon. 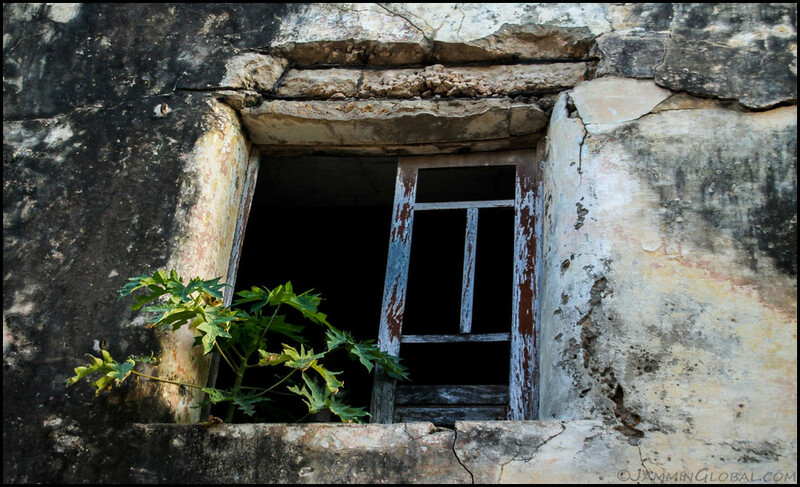 A papaya tree taking root in this poor old building. Given enough time, Nature will reconquer our bricks and mortar. 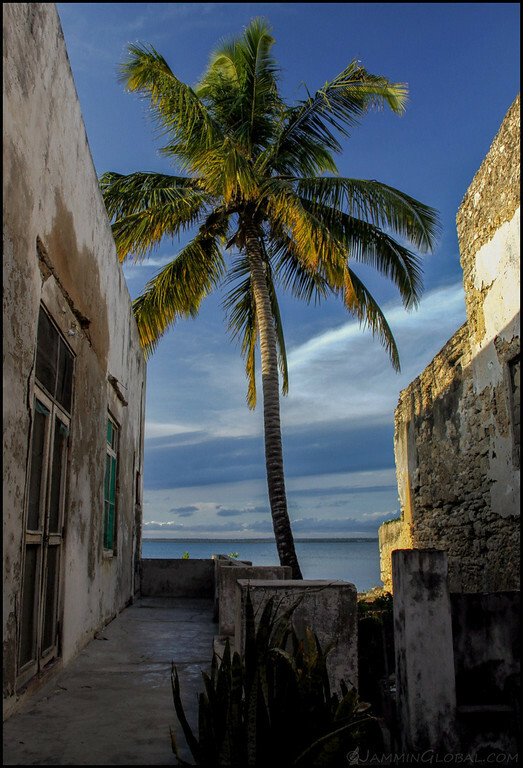 A beautiful coconut tree seen through a space among the crowd of old buildings. 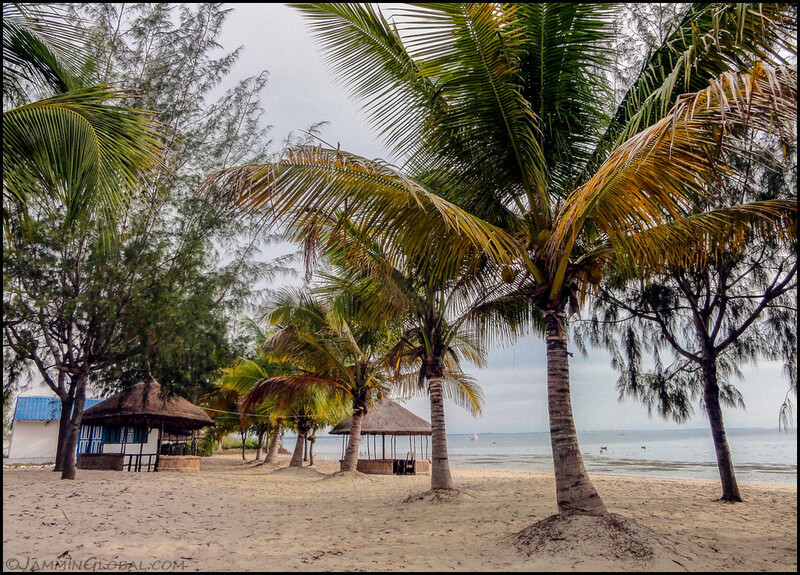 Ilha de Moçambique and its beautiful beaches. The day ending over the Church of Santo António. 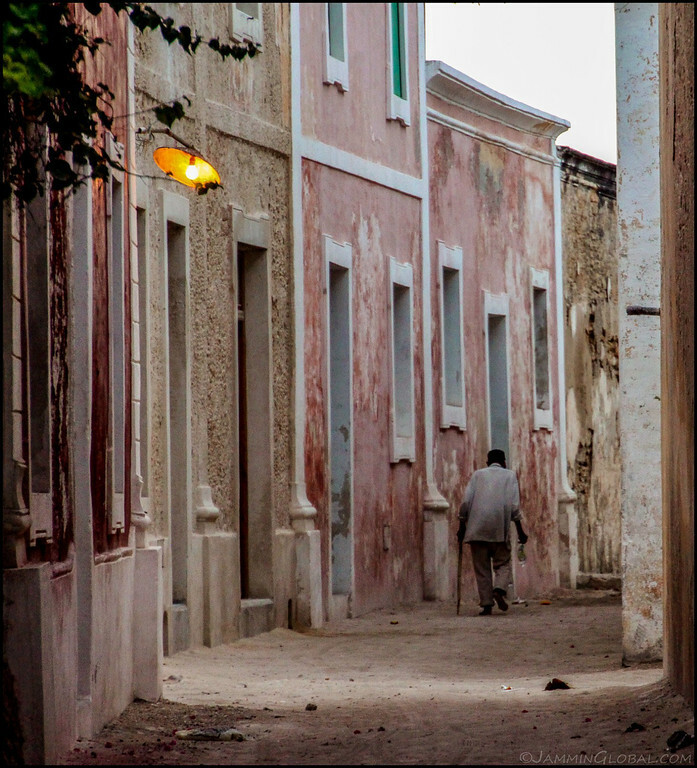 Heading home down the colorful alleys of Ilha de Moçambique. 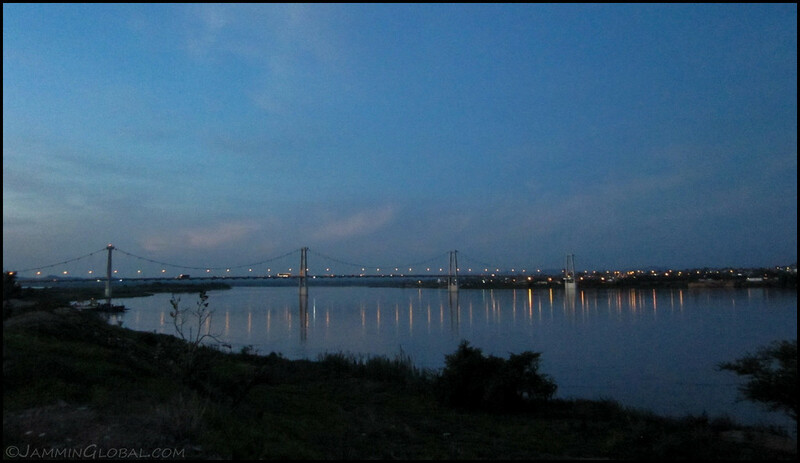 And it was time for Rob and I to head back to our campsite, across the bridge. A beautiful day on Ilha de Moçambique and I’m happy I could visit her before commercialization takes over. 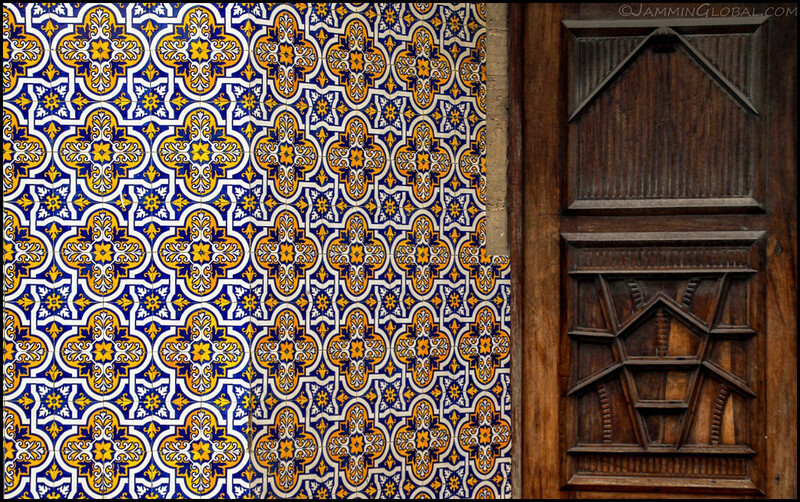 There’s tasty food, quiet and historical streets to meander through and beautiful, warm people to meet. 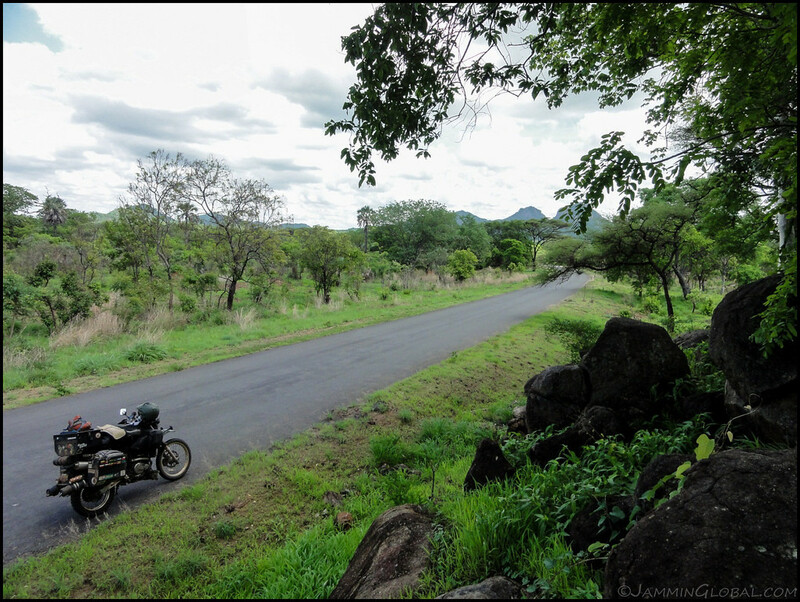 After my little break on the shores of Lake Malawi, I headed east, across the remote region of Niassa Province towards Pemba, on the coast. 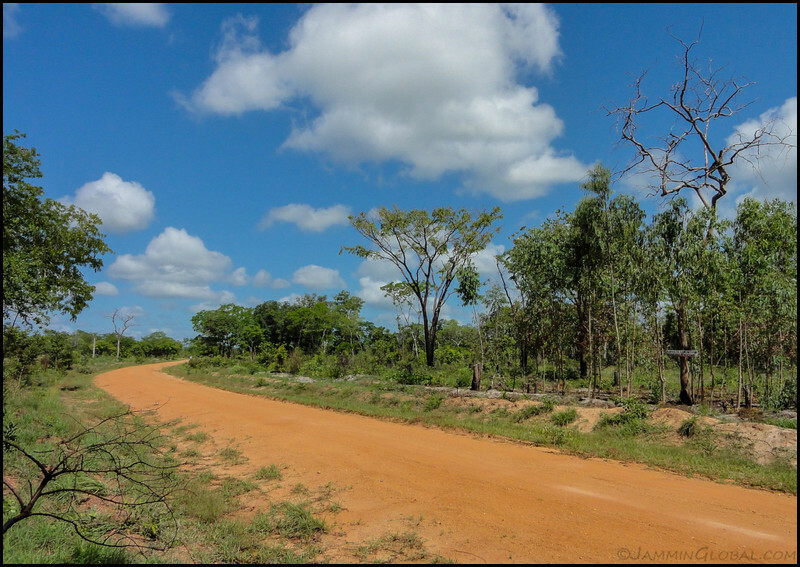 Mozambique is developing quickly with the Chinese laying new roads everywhere and the route that heads east from Lichinga to Pemba was in varied states of construction. The middle portion, the farthest from civilization on both sides, is still a little track through the forest that I highly enjoyed. The rainy season was fully underway now and I sought shelter from a fast-moving thunderstorm with some villagers in their hut. The track was either hard-packed mud, that turned slippery when wet, or sand, which was surprisingly easier to ride when wet. 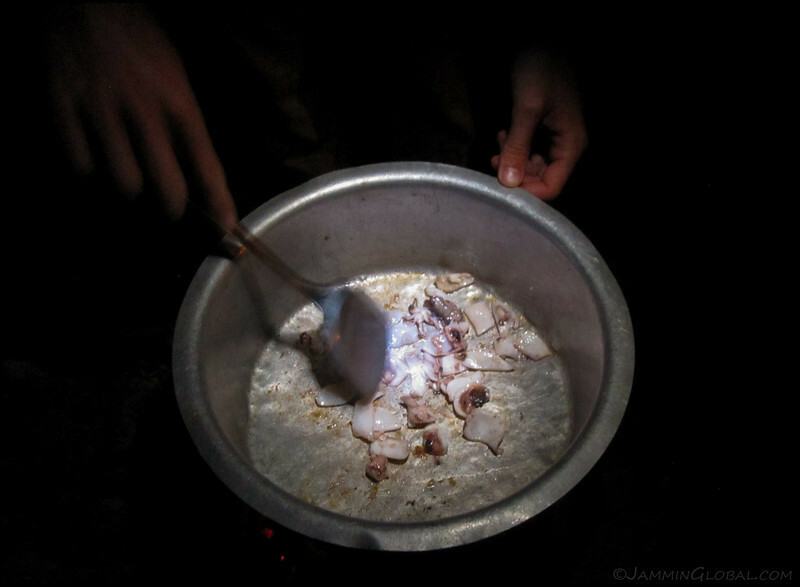 I emerged back into civilization on the other end and headed for Pemba, where I enjoyed fresh squid and octopus. 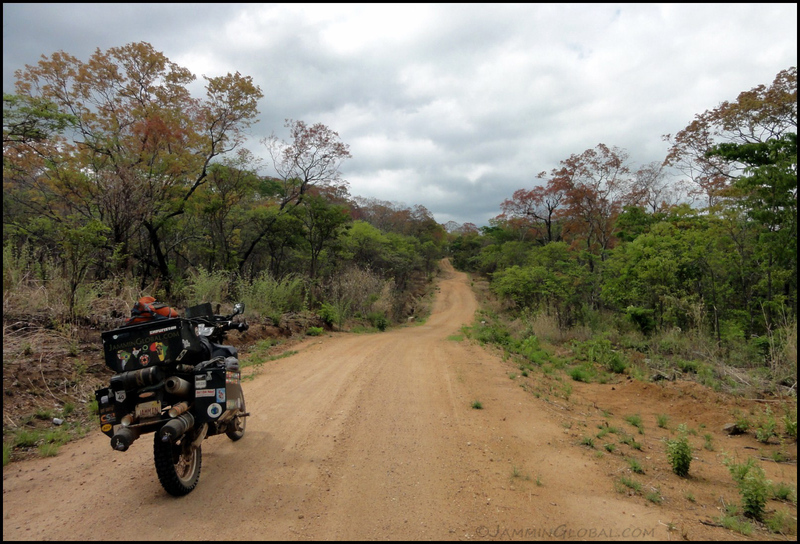 Heading east out of Lichinga and enjoying the twists and curves in the mountainous north of Mozambique. 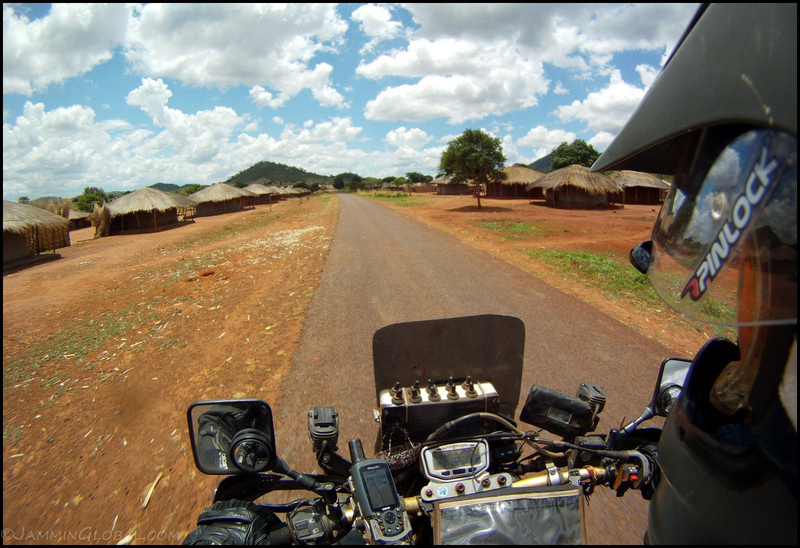 Panorama of the distractions that a rider through Niassa Province experiences. Click here to see the high resolution version. I was in the thick of the rainy season. It comes in quick and then moves on. I just missed the rain here and got my tires wet to increase their mileage ever so slightly. 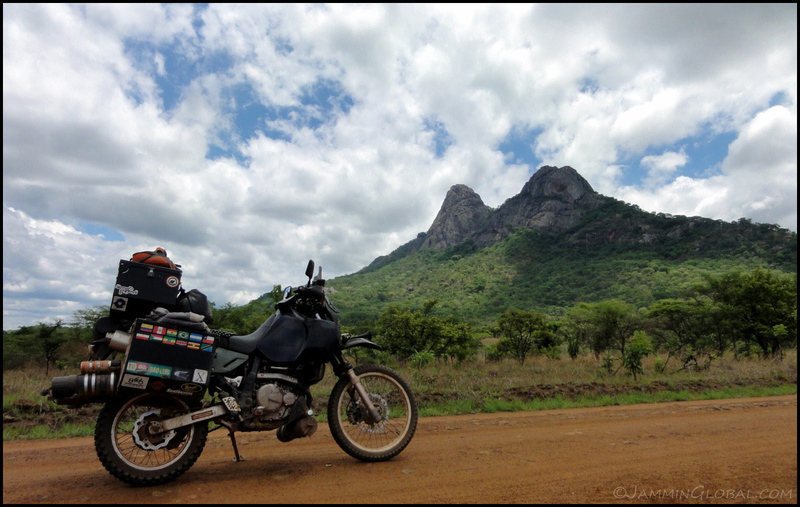 The grand inselbergs that dot northern Mozambique. These are remnants of old volcanoes where the outer rock has eroded to the form the surrounding plains and the inner, harder rock, usually granite is left behind to stand proud. 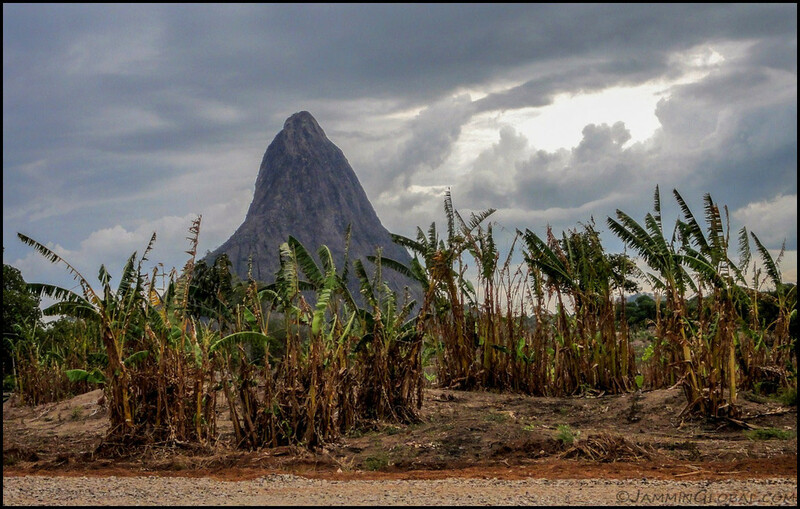 A woman ploughing her farm under the shadow of an inselberg. Quite a dramatic setting to have in your backyard. Can you see the creature in the inselberg? There are two eyes on the small head and a slanted mouth. That same inselberg from another view, showing that seeing faces in inanimate objects is just a trait of the human mind, as we’re hard-wired to pick out faces. Crossing a little bridge in Niassa Province. Click here to see the high resolution version. A view into the distance with a jagged horizon of inselbergs in various poses. Ooh, an elephant crossing sign, telling me that mama and baby elephant only cross in curves, ok, so on the straights I’m good. 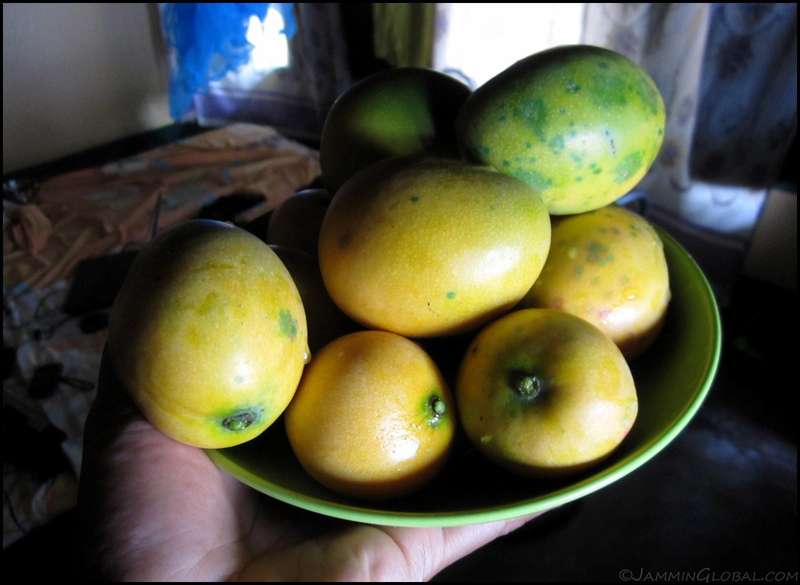 Mango season is in full bloom and I passed numerous trees with brightly-ripened, juicy mangoes, just waiting to be picked or thrown at by kids. The only hotel in Marrupa, a small town about a third of the way to Pemba. This basic residencial went for 400 Meticais ($13.50) and came with a hot water bucket bath. 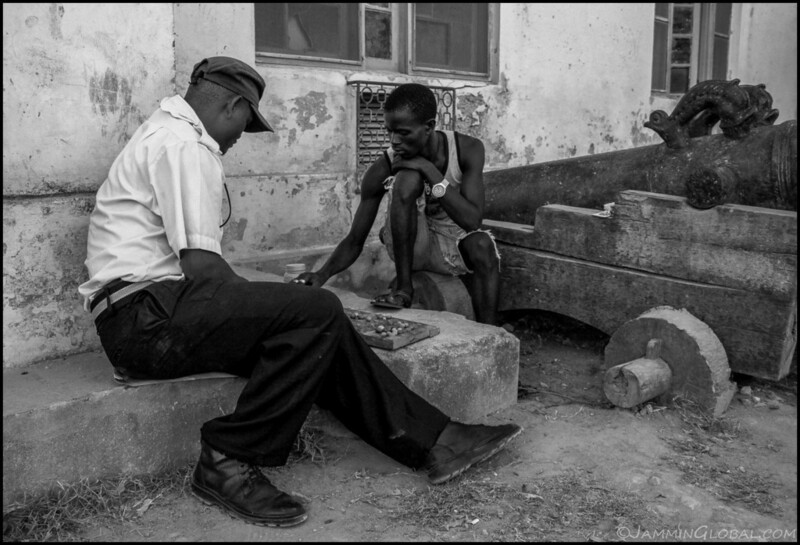 I was walking around town and came across these guys playing a Mozambican version of the age-old game known as Bao or Mancala. The rules are quite complicated but the general idea is to sow and capture seeds. The earliest evidence for this game comes from northern Ethiopia and then it got picked up by the Arabs who introduced it into East Africa and other parts of the world. The vegetable market in Marrupa with only the basics of onions, tomatoes and beans. I was buying some bread and noticed these guys playing a game of checkers. Nice use of bottle caps. On the road after a good breakfast of oatmeal. The section of the route from Marrupa to Montepuez is currently under construction, meaning, get out and ride the world before it all gets paved over! Click here to see the high resolution version. 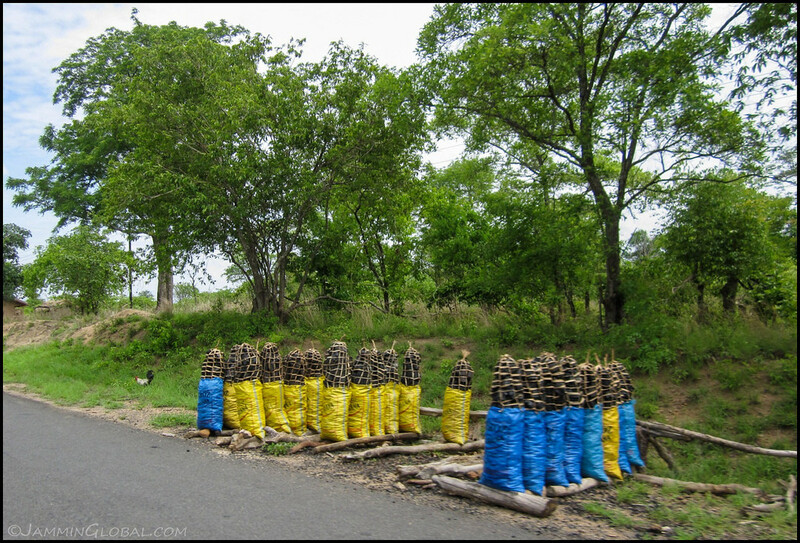 Road construction through forests and rainy seasons don’t go together. Riding the detour from the newly laid roadbed on the right. African Mud. It’s good for the boots. A wide puddle but it looked shallow, so I just went for it. The construction petered out and I was smiling end to end as the road became a small forest trail. 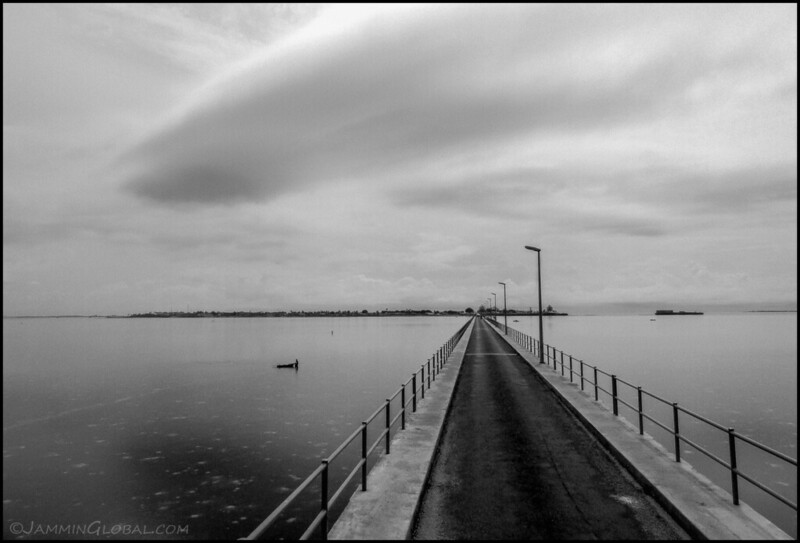 It was getting close to mid-day and these cumulonimbus clouds were heading for my path. 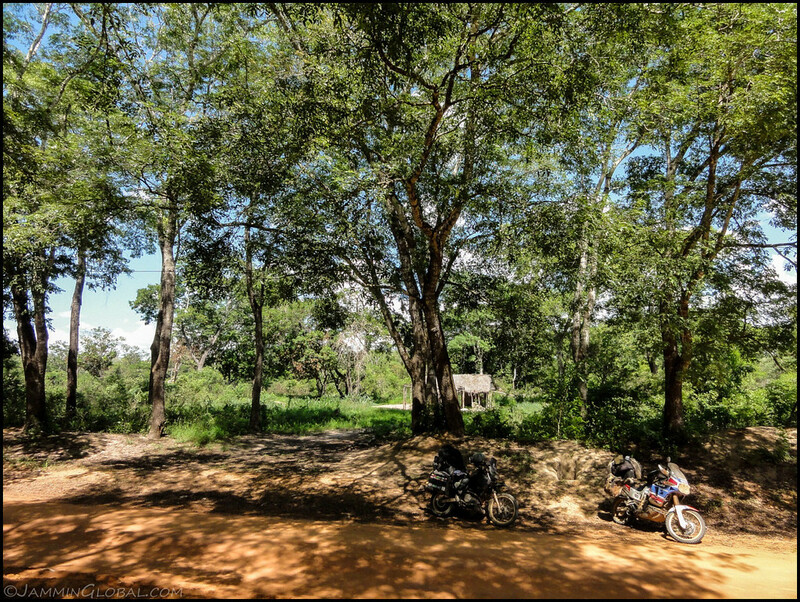 sanDRina in the forests of Northern Mozambique. There was hardly any traffic on this route, evident by the grassy, center berm. I loved being amongst such tall trees but it saddened me that they would be chopped down soon to make way for progress. Having a lunch of soft-boiled eggs and buns. I made these eggs in the morning and like to boil them for 5 to 6 minutes to get the yolk into a semi-solid state. Just as I was finishing up lunch in the middle of the forest, rain drops started falling. I packed up and got moving and rode through a fair amount of rain. The route was sandy but when it got wet, it actually became easier to ride. Riding through rain is not a problem but I’m a bit wary of lightning and this one thunderstorm was throwing down the electrical shards ahead of me and I thought best to wait it out instead of riding through it. I pulled up in this little village and asked in my basic Portuguese if I could just take a break here. A few minutes after getting inside this hut, the storm hit and the rain came down heavy. The villagers who let me stay in their hut during the storm. 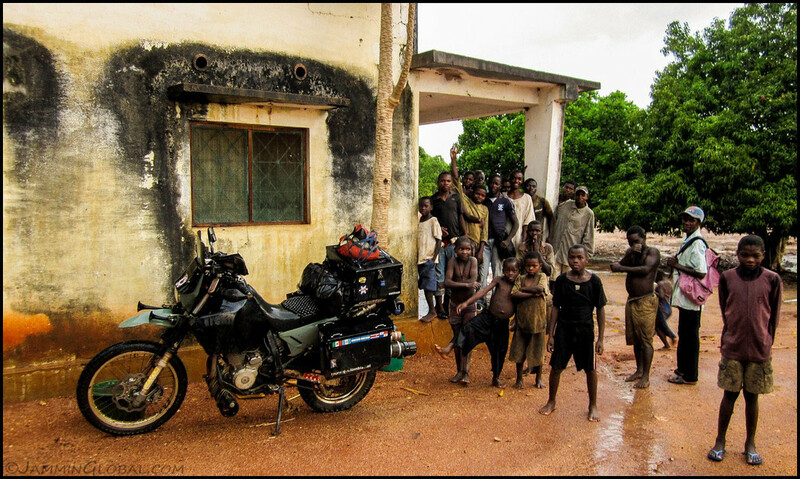 The kids were thrilled to see this strange man and his strange motorcycle make a stop in their village. I presumed this man was the village head and this boy, who was the best-dressed there, was his eldest son. The kids were all shy of my camera at first, but once I took one picture and showed it to them, they all loved it and wanted to get in every shot. Here, they’re eating some left over nshima and beans after an adult was through with his lunch. Look into his eyes as he reaches for his next hand-full of nshima. This kid looked to be the smartest one and I thought about how geography (where you are born on this planet) plays such a critical role in determining who gets what kind of chance in this world. Twenty minutes later and the thunderstorm had passed with sunshine in its wake. Click here to see the high resolution version. Saying goodbye to the mamas of the village. And one last shot of all the kids. Back on the trail with the sun beating down and you can’t even tell that it just rained so hard. Oops. I was riding through this sandy riverbed and didn’t see that wooden spike sticking out of the ground. It caught my tool tube and down we went. A few guys came running out of the woods and helped me lift sanDRina back up with the rubber side down. Evidence of the recent rains. Where the puddles were huge, a side track was cut into the brush. 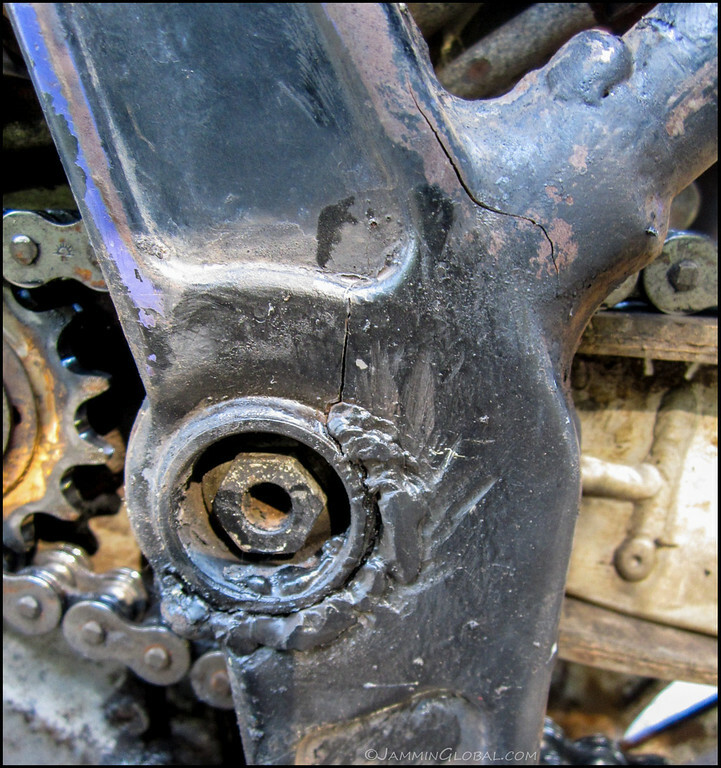 Riding lots of corrugations and I noticed a bolt for my pannier frame had rattled out. I found a replacement M6 bolt from my bag-o-bolts, put a dab of Loctite thread-locker and off we go. A long and messy mud puddle with an even messier detour. I went a bit back and made my own entry into the detour. Camping in a cheap residencial in Montepuez, a large town on the other end of the forest track. 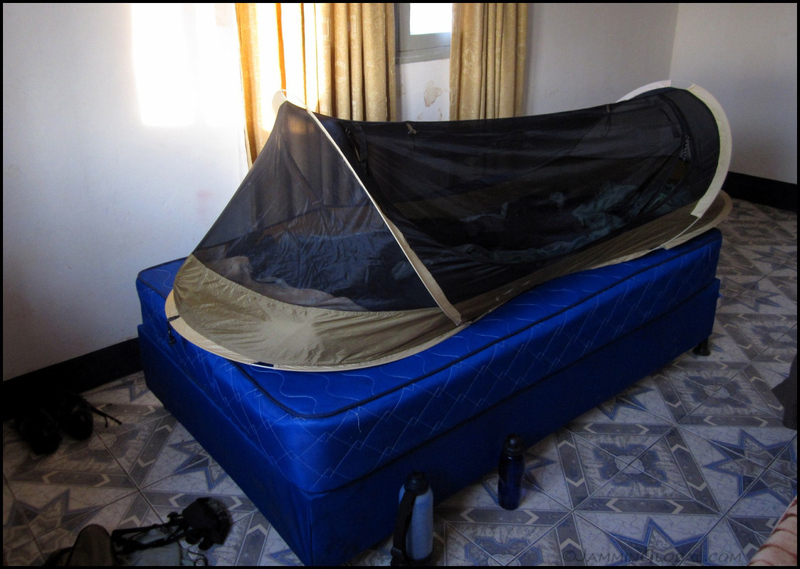 The beds were creaky and the mattress didn’t look inviting and there was no mosquito net, so best to setup my tent, which is a home I know. At least sanDRina had a nice place to spend the night in Montepuez. The next day’s ride was short and easy, heading down to the coast. A big baobab tree just across Russel’s Place in Pemba with the clear waters of the Indian Ocean. 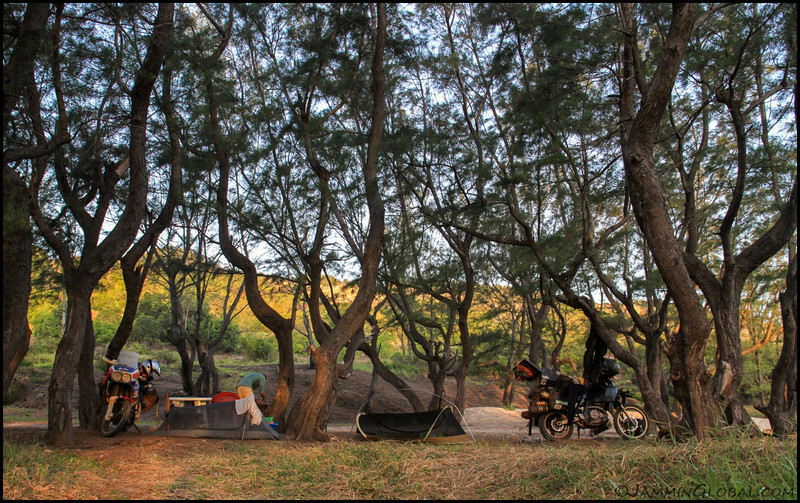 Russel’s is a backpackers and is the cheapest place to stay near the ocean. I took a bed in this elevated hut for 500 Meticais ($16.85). 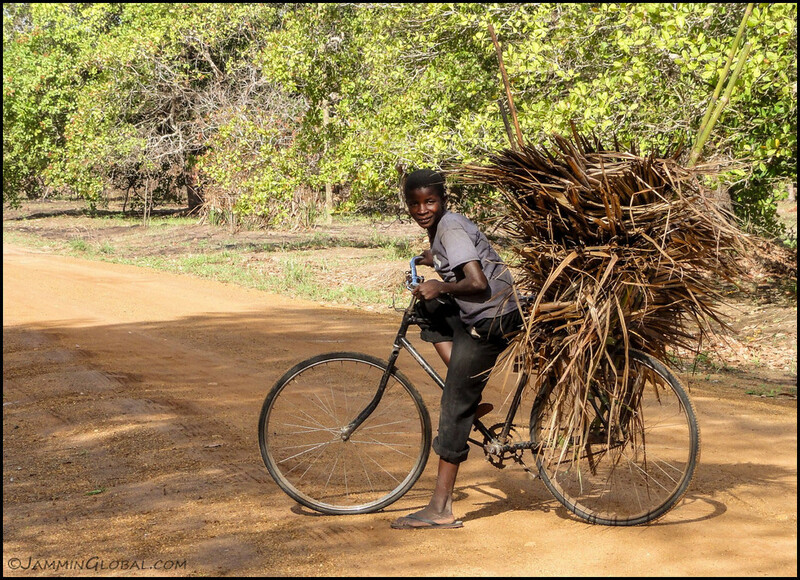 I was slowly adjusting to the higher prices in Mozambique compared to neighboring East Africa. 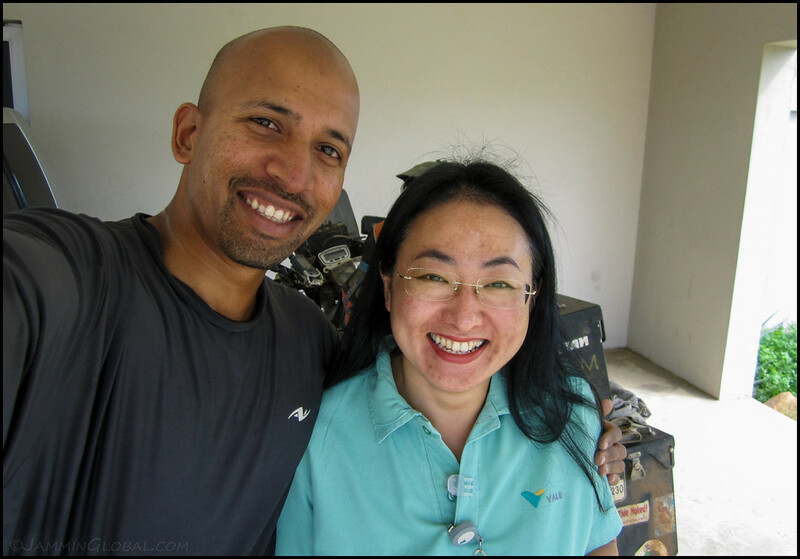 …this lady here cut and grilled it up for us for another 30 Meticais ($1). She also had a supply of beers and chapatis to go with it. The breeze was blowing strong and the atmosphere was fantastic. 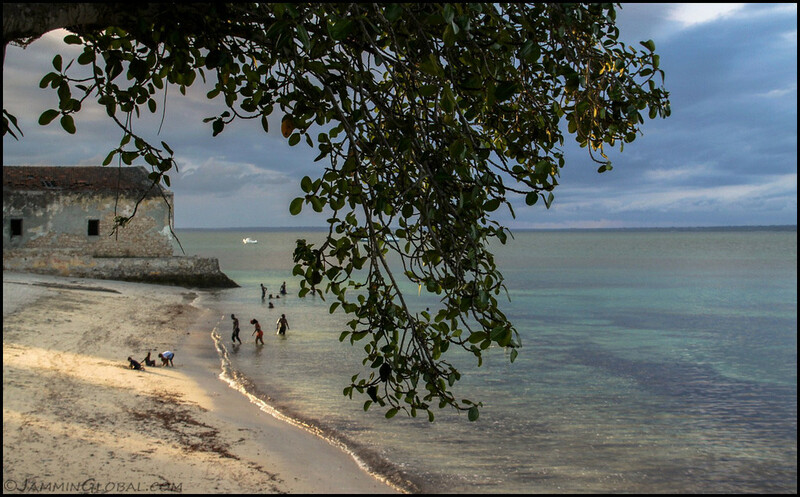 The receding tide at Pemba’s beautiful coast. Click here to see the high resolution version. Enjoying a walk through the water and making my connection with the Indian Ocean. 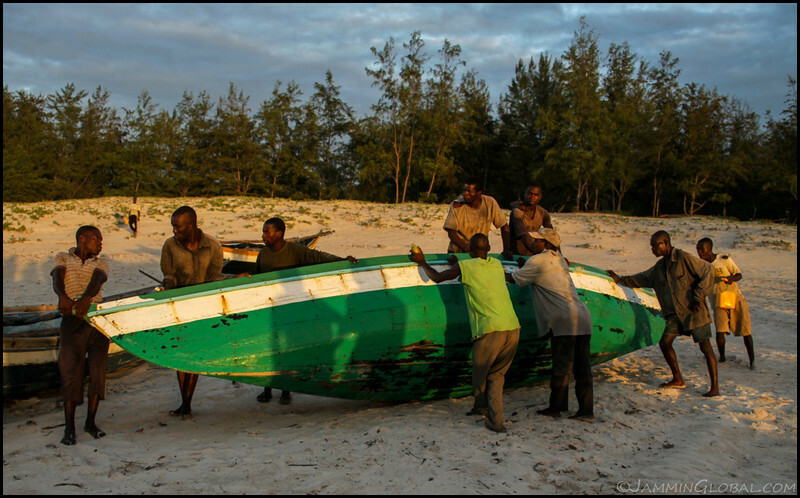 This was the first time sanDRina’s been at sea-level since entering Africa at Alexandria. Shopping for seafood for dinner the next night. We picked up this pile of octupii for only 25 Meticais ($0.84). He had this yellow-fin tuna going for around $30 and I thought about how much ‘value’ and price is added to food as it moves from where it is caught or harvested to where it is consumed. Here, we were consuming it where it was caught. Nothing fresher than that. 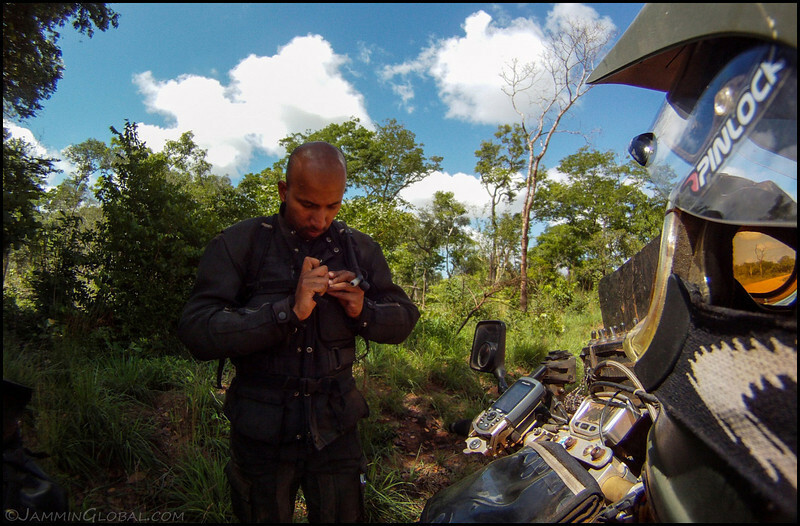 After my extended stay in East Africa, it was finally time to enter Southern Africa. 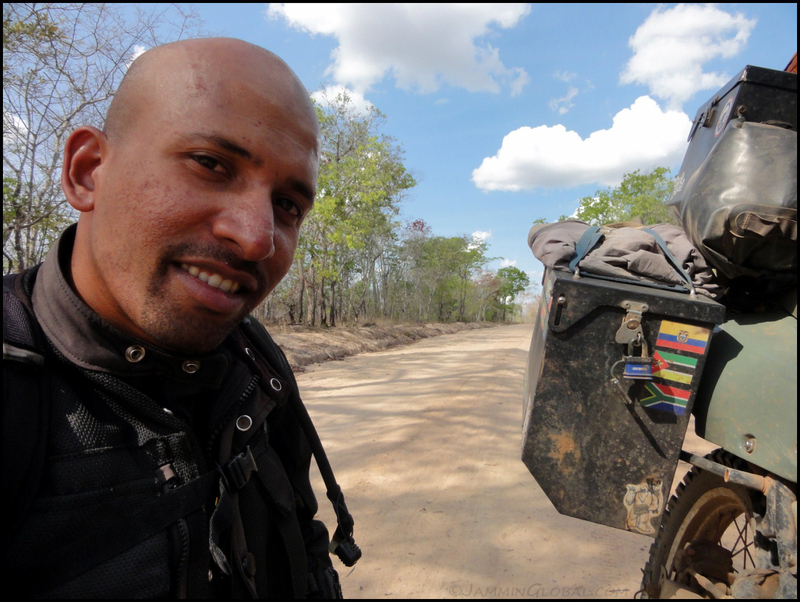 Mozambique has been a country that I was really looking forward to experiencing after the many positive things other travelers have said and also because it’s a Portuguese-speaking country. My travels through Brazil developed my love for the Portuguese language and I’ve been earning to speak it ever since I left South America. 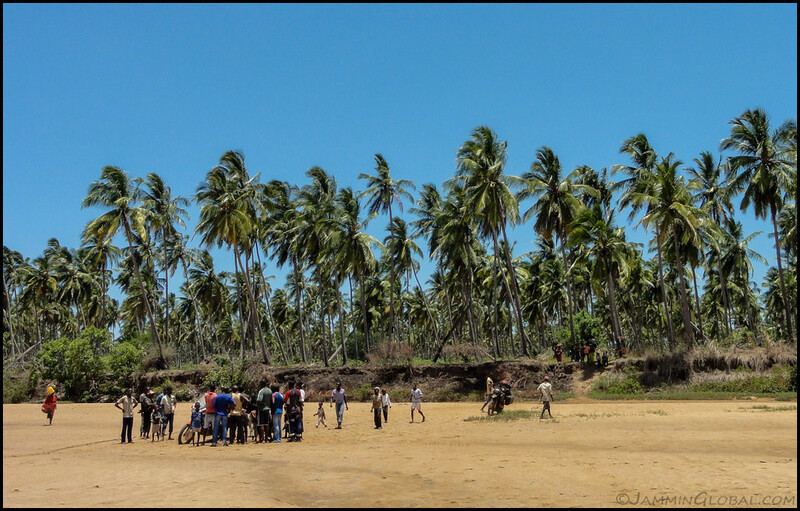 Mozambique was first introduced to Portuguese culture when Vasco da Gama made landfall on his way to India in the 15th century. As other European powers were gobbling up Africa, Portugal kept a hold of Mozambique, Angola and Guinea-Bissau. 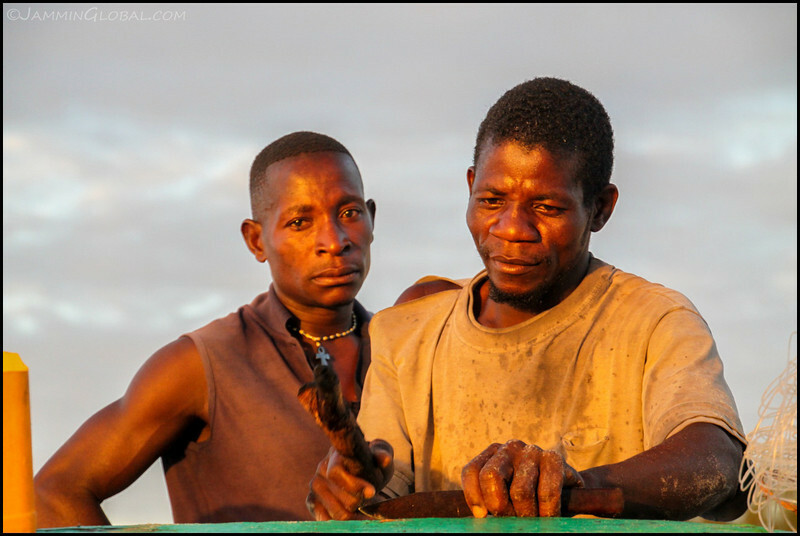 After a long struggle, Mozambique finally became independent in 1975 but quickly plunged into a deadly civil war that ravaged the country till 1992. Since then, the country’s been growing fast but there’s a huge gap between the north and the south. 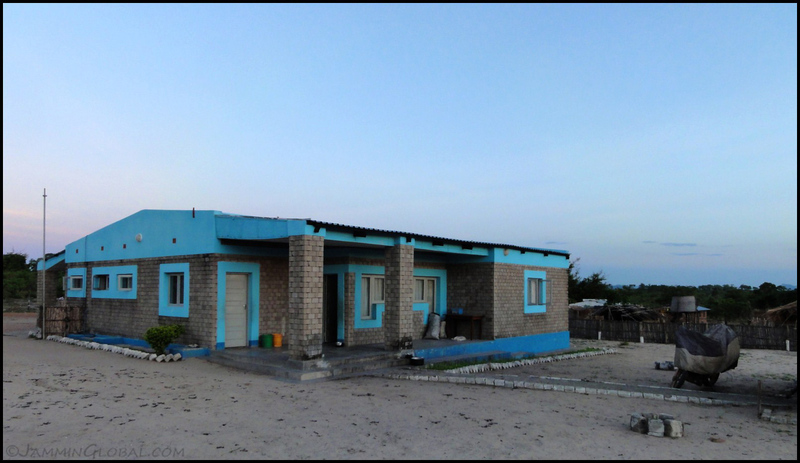 Mozambique is a big country, stretching 3,000 kms from Tanzania to South Africa and most of the development is taking place in the south. This is the reason I traveled only in the north of the country. I like rural and rustic places and I found plenty of that in the friendly north. 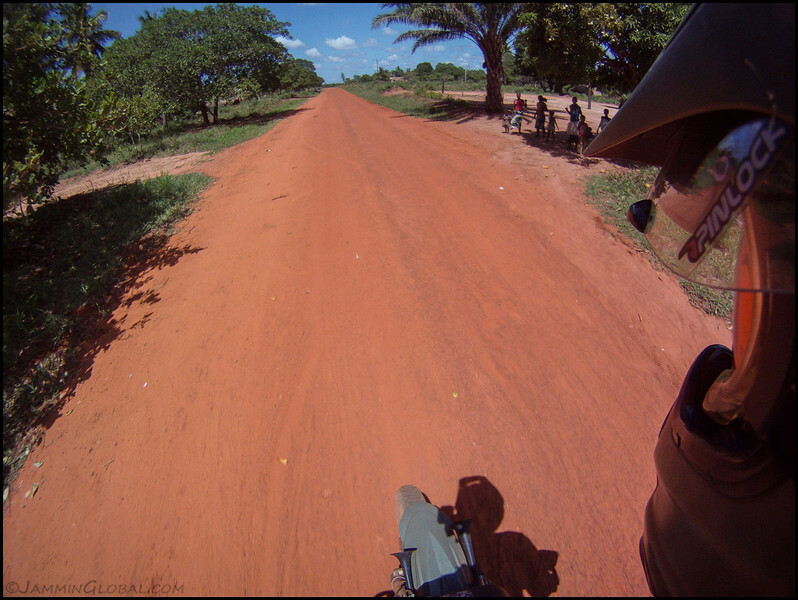 Entering Mozambique at the remote border of Matchedje across Rio Ruvuma. I love small border crossings. There’s no hassle and the officers are more friendly. 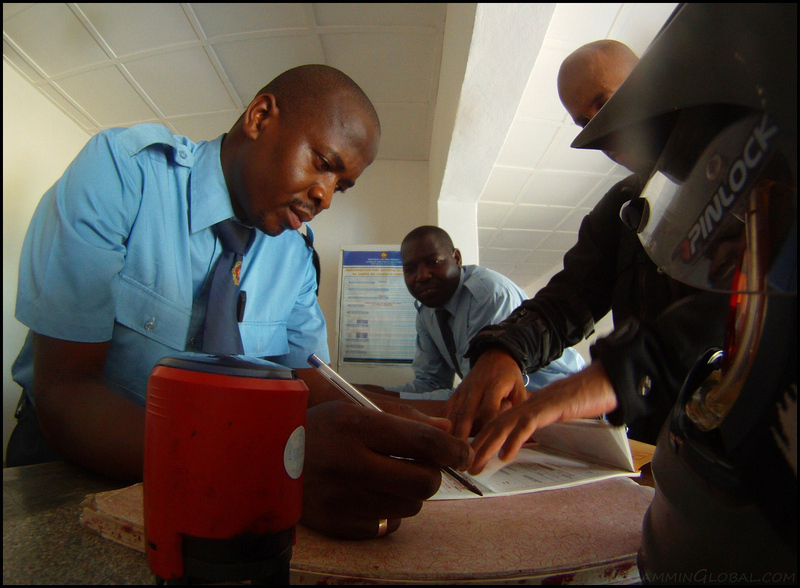 Here, this customs agent wasn’t too sure how to process the carnet for sanDRina and I’m showing him that he has to tear off the bottom portion and keep that and then the middle portion will be taken when I exit the country. 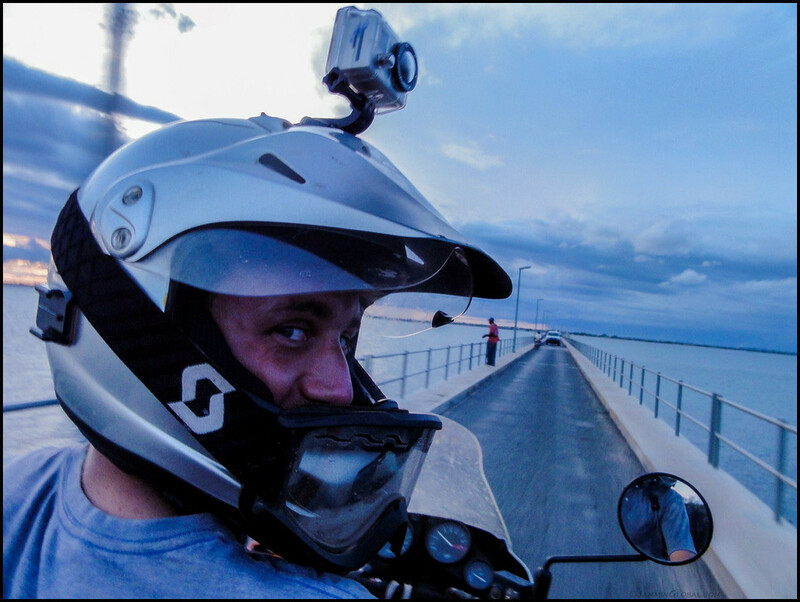 Thanks to GoPro for the hidden camera shot. 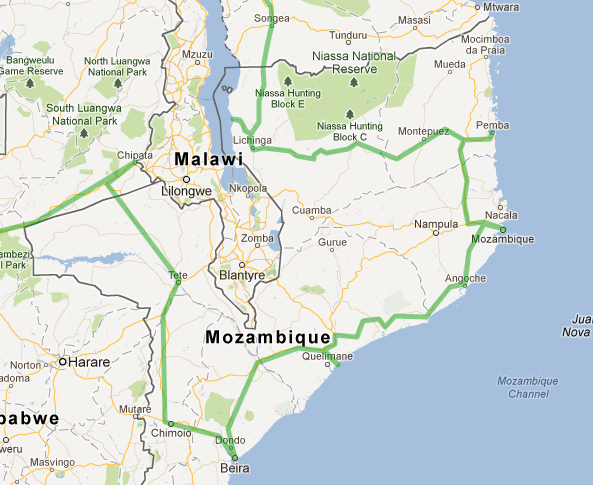 My route through Mozambique. 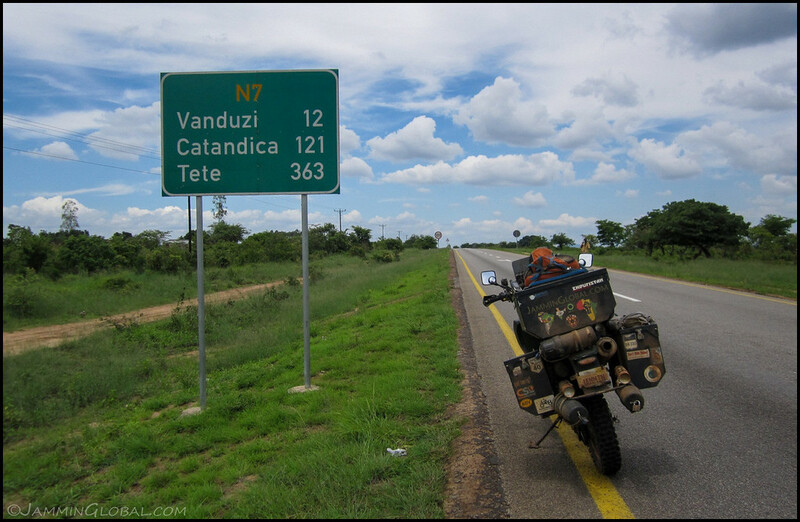 I entered from Tanzania, near Lake Malawi, and then cut across Niassa province to Pemba on the coast. 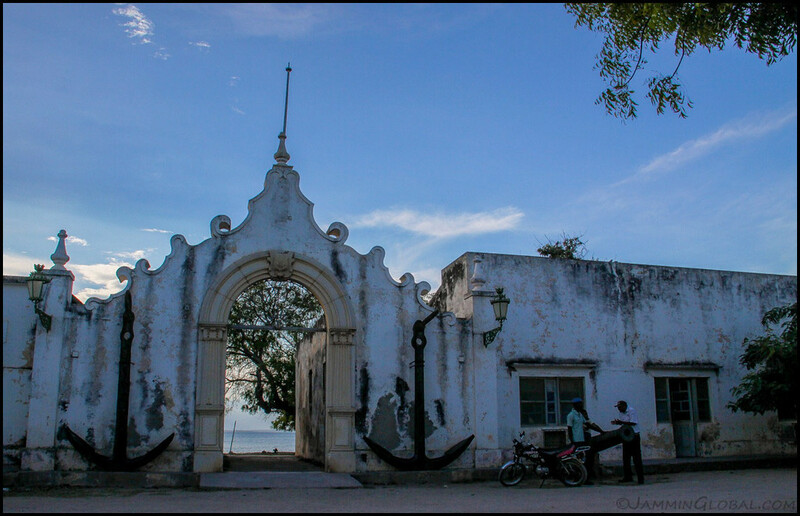 After a visit to historic Ilha da Mozambique, I had a nice ride along the coast down to Beira. Then, I turned inland and passed through Tete on my way to Zambia. Click on it to go to the interactive version in Google Maps. 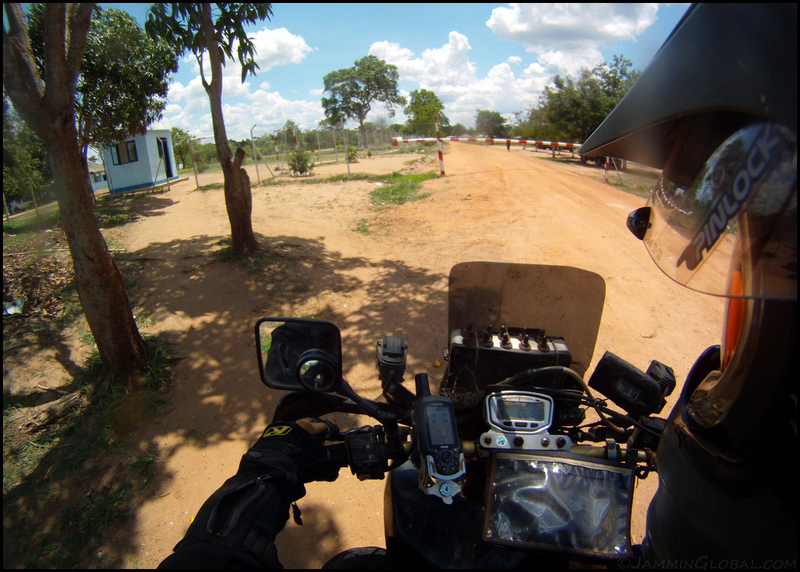 With the border village of Matchedje behind me, I had 60 kms (37 mi) of sandy, forest riding till the next human settlement. The road had no traffic on it besides me and one minibus, called a chapa, here. Taking a break in the shade and letting my bones and sanDRina’s suspension relax from the corrugations. Click here to see the high resolution version. …it soon became quite deep and once I lost my momentum, it was tough to get back up to speed. …enjoy the solitude of the forest. Enjoying my first day in Mozambique. Those 60 kms were slow-going and I started to look for a place to stay for the night. The first village from the border was Novo Madeira and I pulled up to this official-looking building. I introduced myself, in Portuguese, to the officer on duty, Mr. Roman, and asked if I could pitch up my tent in the back. He said, no need, there’s a spare bedroom at the back that I was free to use. How nice. This was the only government building in the area and behind the offices at the front was a guest house for passing officers and I guess, adventure travelers. The sleepy village of Nova Madeira where the residents all had a patch of forest land that they farmed for their sustenance. Roman was a customs officer with military training and excused himself to carry out his evening workout. 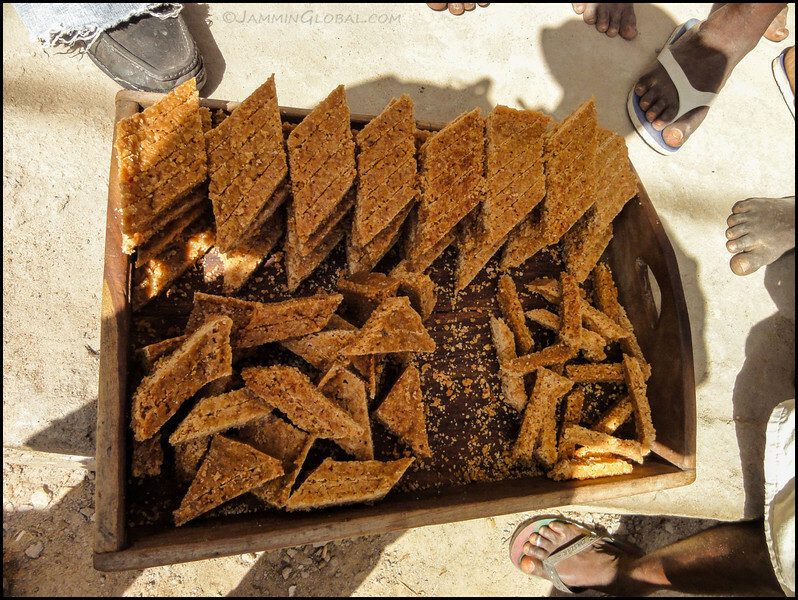 …that we had with nshima (maize meal porridge). He was a very pleasant man and was impressed with my Portuguese that was coming back to me very quickly. I had listened to my Michel Thomas language lessons recently and being immersed was releasing my knowledge of this language. We sat out under the stars and he asked why the stars near the horizon twinkle more than ones that are straight above. In my basic Portuguese, I managed to convey that the light from stars near the horizon have to travel through more air (atmosphere) than the ones straight above and that’s what makes them twinkle more. 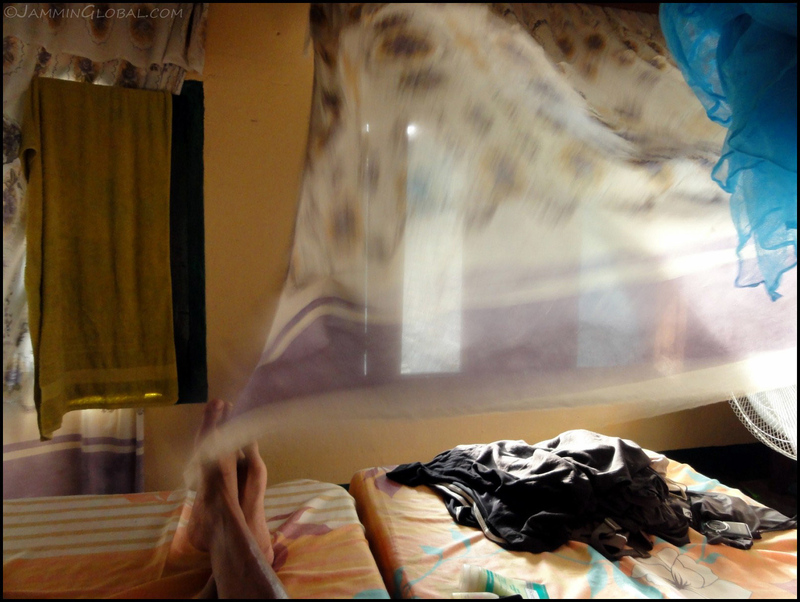 There was no mosquito net, so I put up my tent on the bed and had a restful night. Leaving the next morning and I enjoyed the overcast sky as it kept the temps in check. Thanks for the stay, Roman. 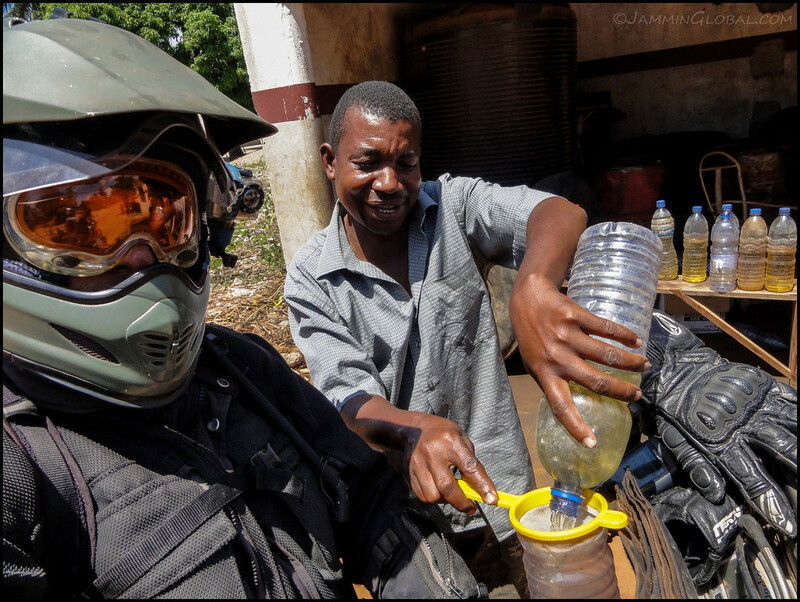 What a great first impression of Mozambique. 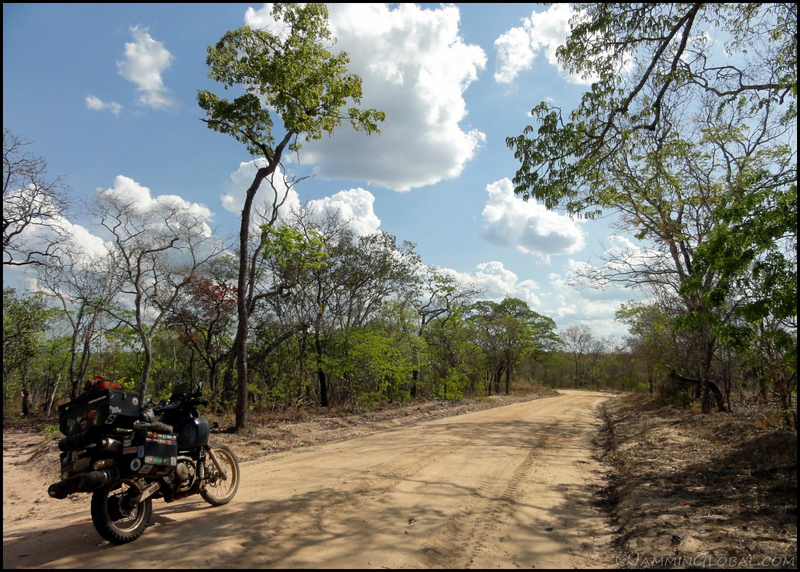 Heading south on a hard-packed mud road and enjoying the curves and dips and climbs. The forest ended and the land was taken over by farmland but the horizon was exciting with mountains all around. Click here to see the high resolution version. Panorama of the ride with some jagged peaks in view. Click here to see the high resolution version. 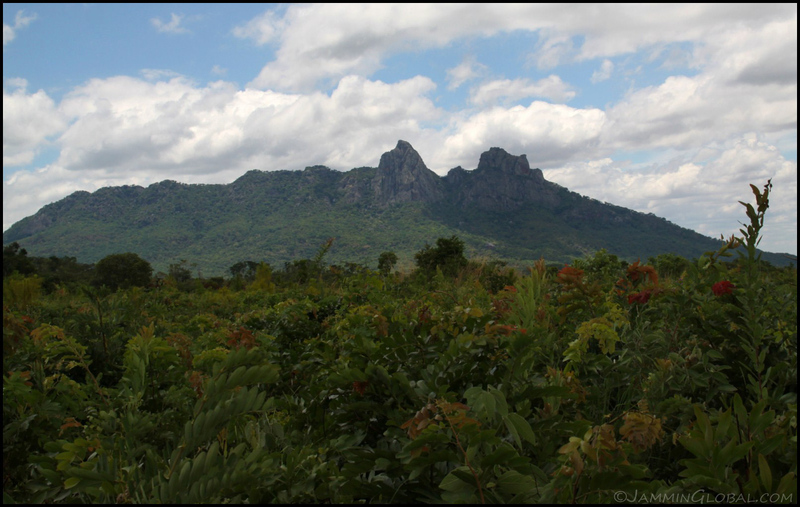 The mountains of Northern Mozambique. 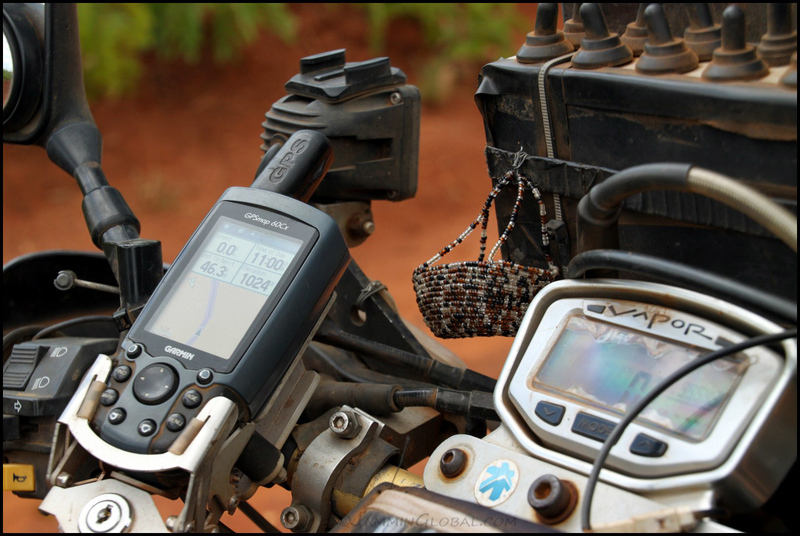 A shot of my GPS and a basket from a friend in Kenya. 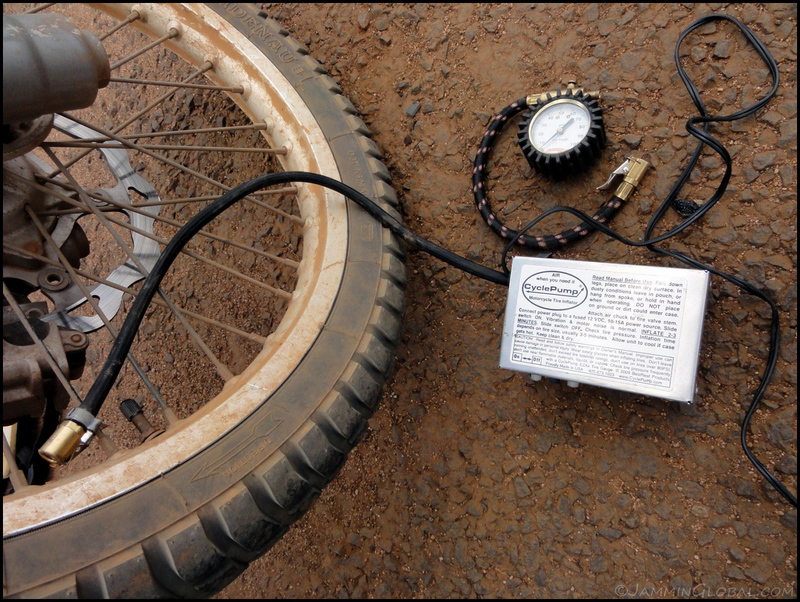 I hit the pavement near the town of Lichinga and aired up the tires with my CyclePump. 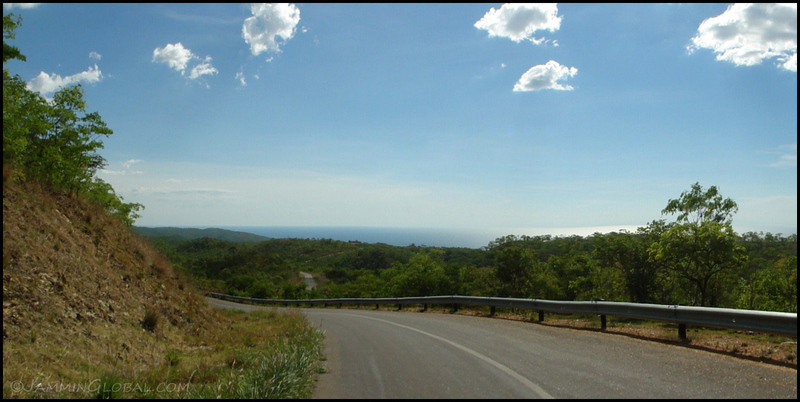 …I rounded a corner and wow, grand old Lake Malawi was spread out across the horizon. 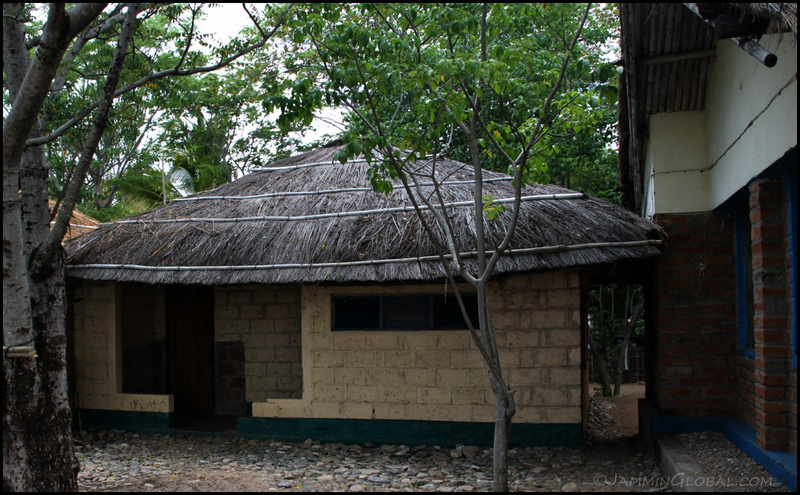 …where they had this little hut for 250 Meticais ($8.43) per night. 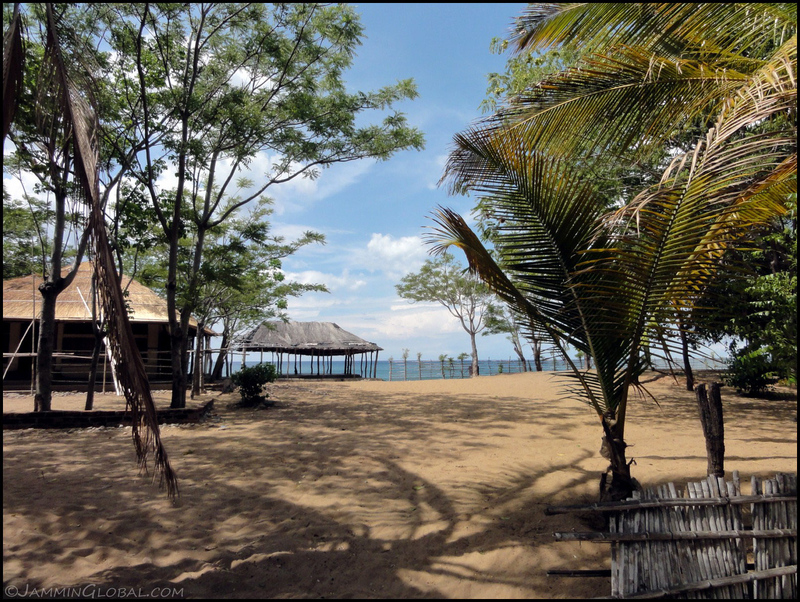 The view from my beach hut of beautiful Lake Malawi. The mountainous shoreline of Lake Malawi that I had to descend down to get here. 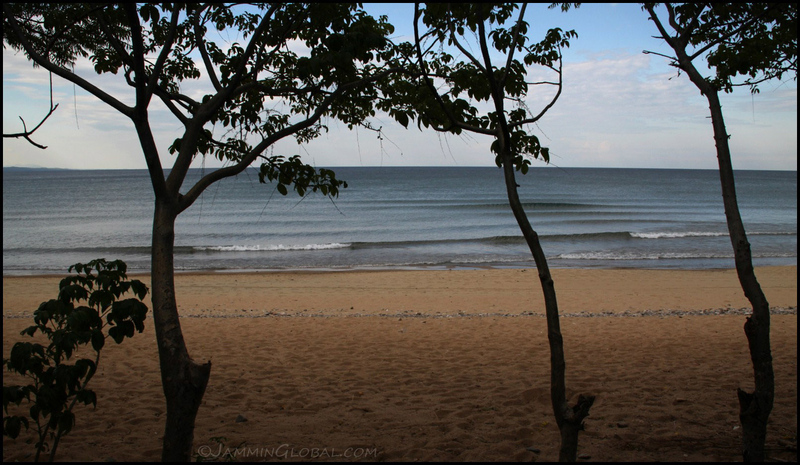 The waves of Lake Malawi. This lake holds a special place in my life as my family used to vacation on the opposite shore in Malawi when we lived in Zambia during my childhood. I wasn’t going to pass through Malawi, due to visa complications, but coming back to these waters was enough to stir up the nostalgia. 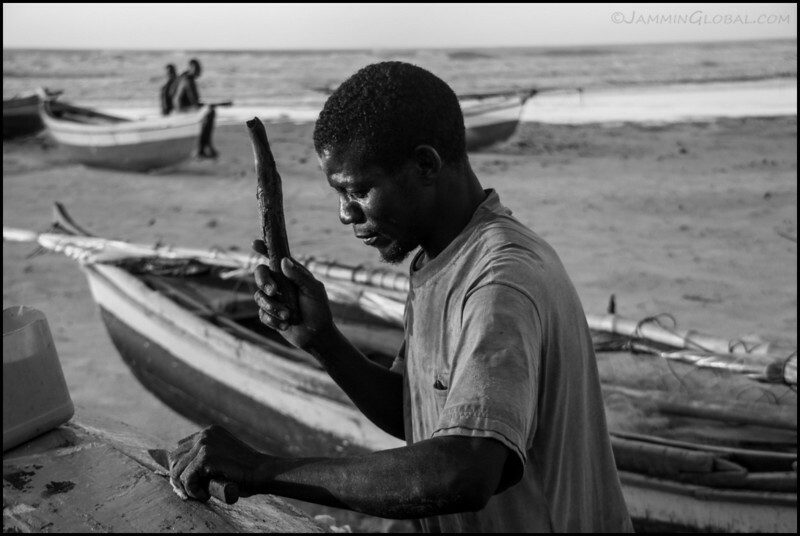 On the Mozambican side, the lakeshore isn’t developed and the lake is used as the primary source of water for the local population. 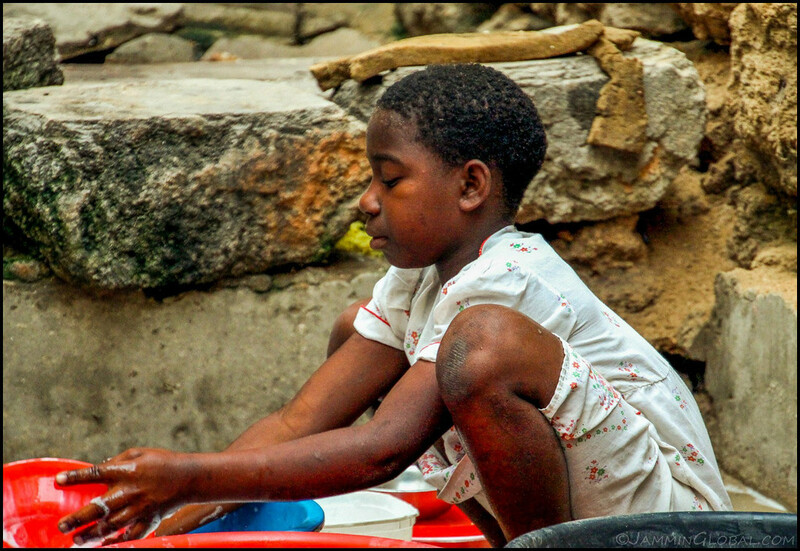 They bathe, wash their clothes and take water back home for cooking and drinking. Mango season was in full bloom and I asked the hotel workers to get me a few from the mango tree in the parking lot. 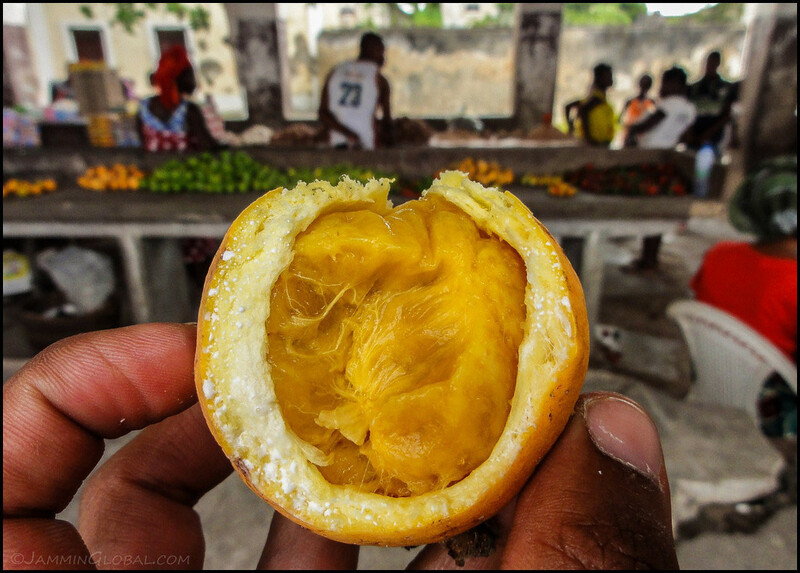 I enjoyed these luscious fruits over the day and had my fill of fresh mangoes. 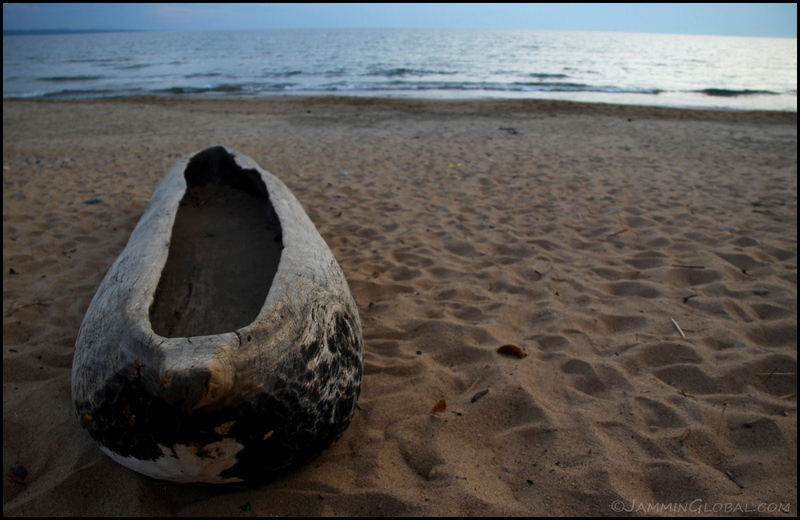 An old dhow carved out from a single tree trunk on the shores of Lake Malawi. 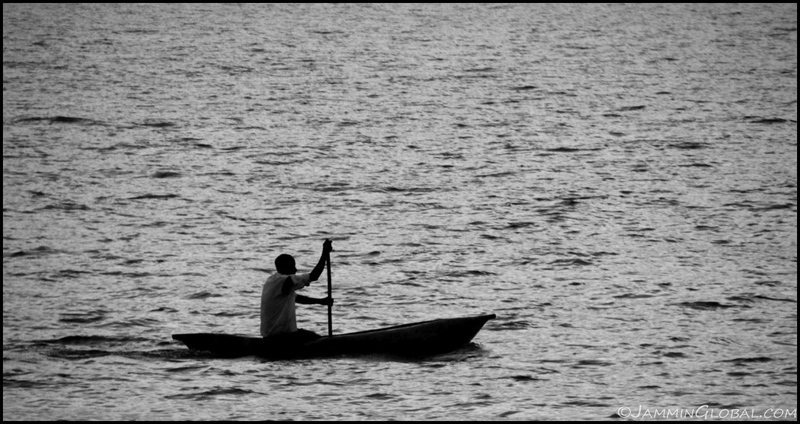 A fisherman heading out for his evening catch. 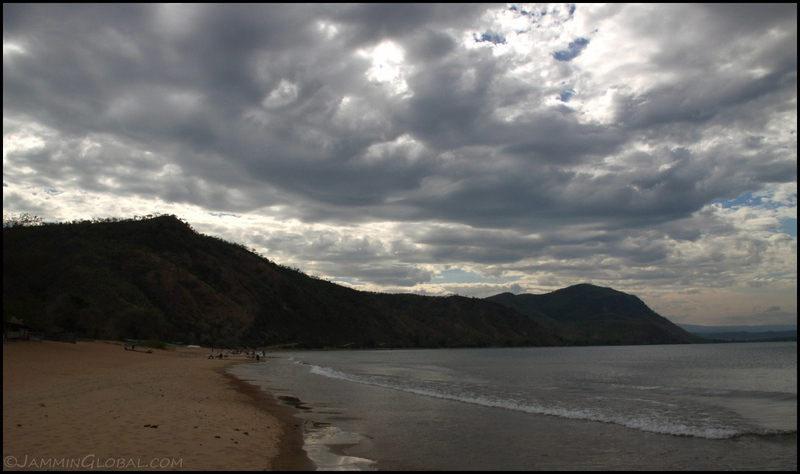 Lake Malawi is the second-deepest lake in Africa, after Lake Tanganyika, and is the southernmost of the Rift Valley Lakes. 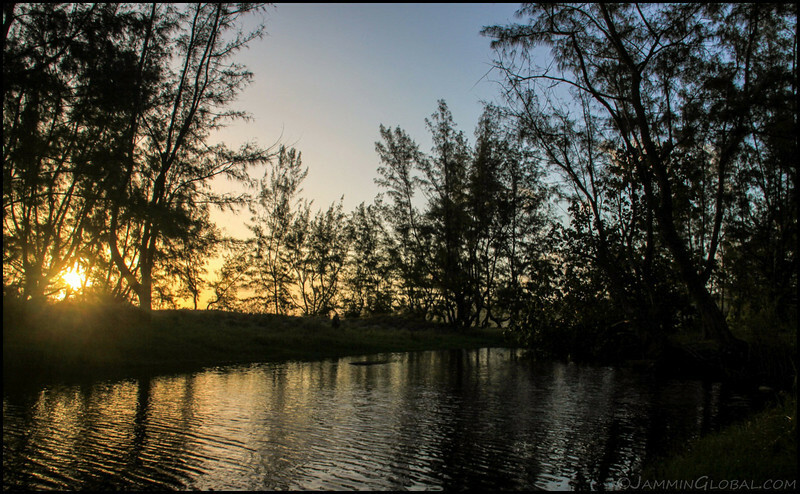 Its isolation and great depth has allowed hundreds of species of endemic fish to evolve over its lifetime. The lake is also known for its snail population that harbor the deadly bilharzia parasite. 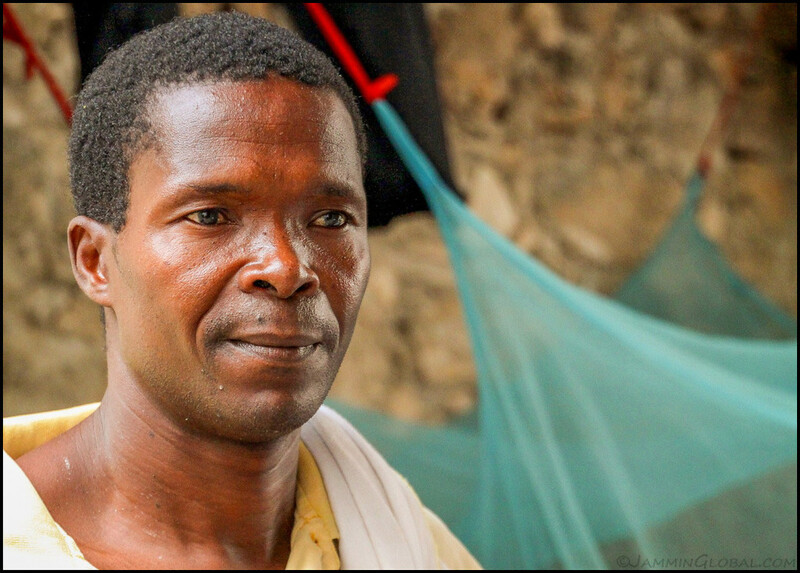 Bilharzia wasn’t an issue when I was a kid but recently, with certain snail-eating fish being over-fished, bilharzia has become more of an issue. 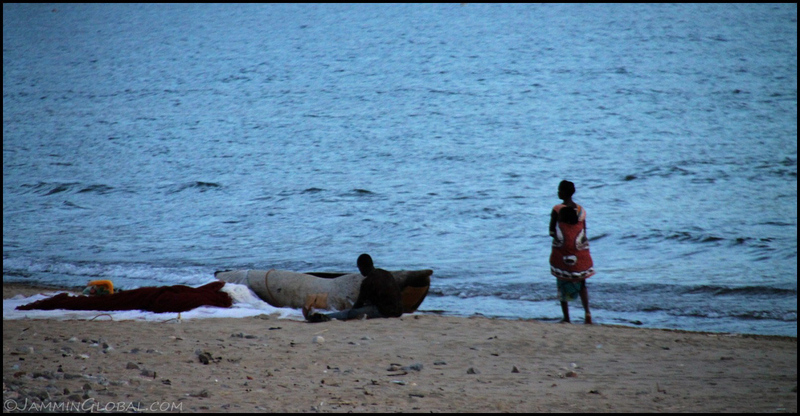 As dusk falls, a young lady with her baby tied on her back walks past a fisherman mending his net. Enjoying the strong breeze coming off of Lake Malawi in my simple beach hut. 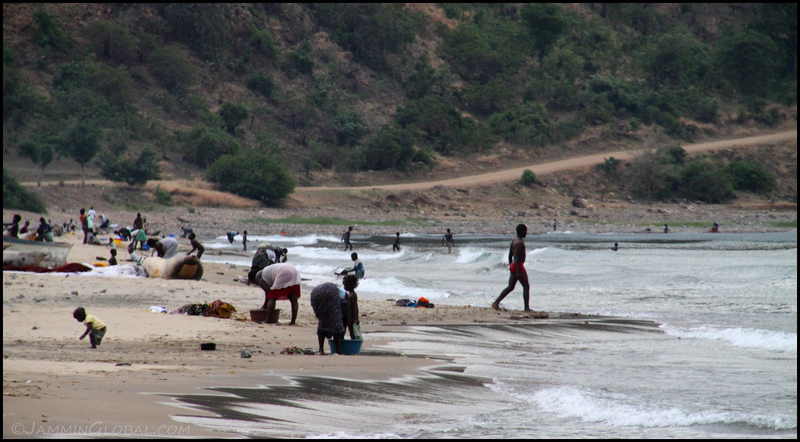 Heading out of Chuwanga Beach and soaking in the grand views of Lake Malawi. Click here to see the high resolution version.